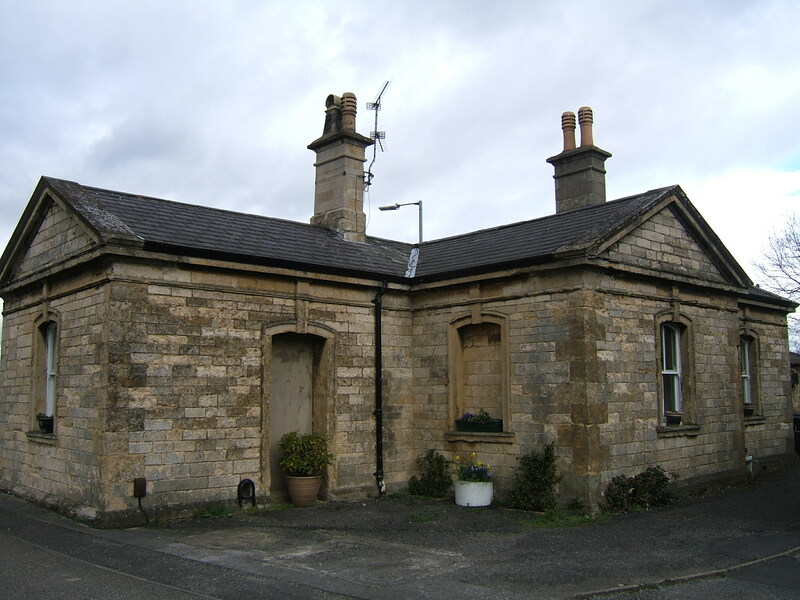 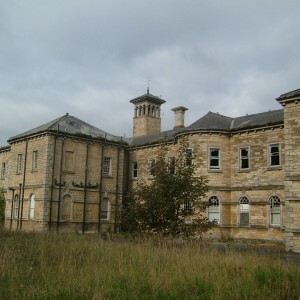 The lunatic asylum serving Lincolnshire developed , along with many others, in response to the 1845 act of parliament making it mandatory for each county to provide accommodation for its lunatics. 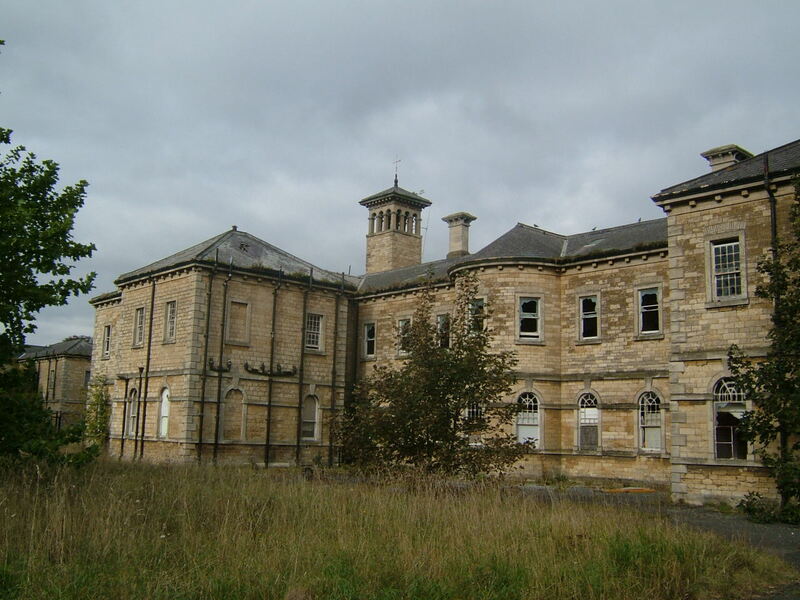 Although a predominantly rural county, Lincolnshire itself constituted of three ‘parts’ as well as large settlements of borough status who together combined to develop the lunatic asylum at Bracebridge heath, to the south of Lincoln. 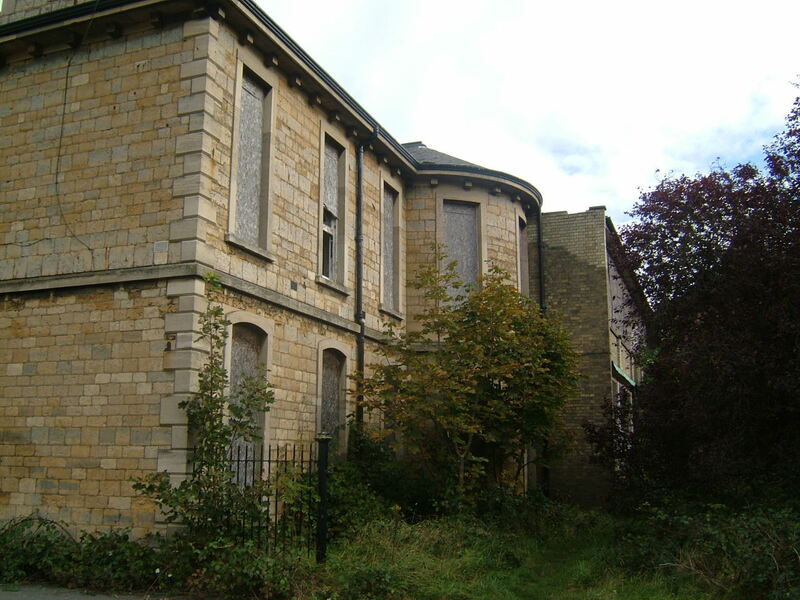 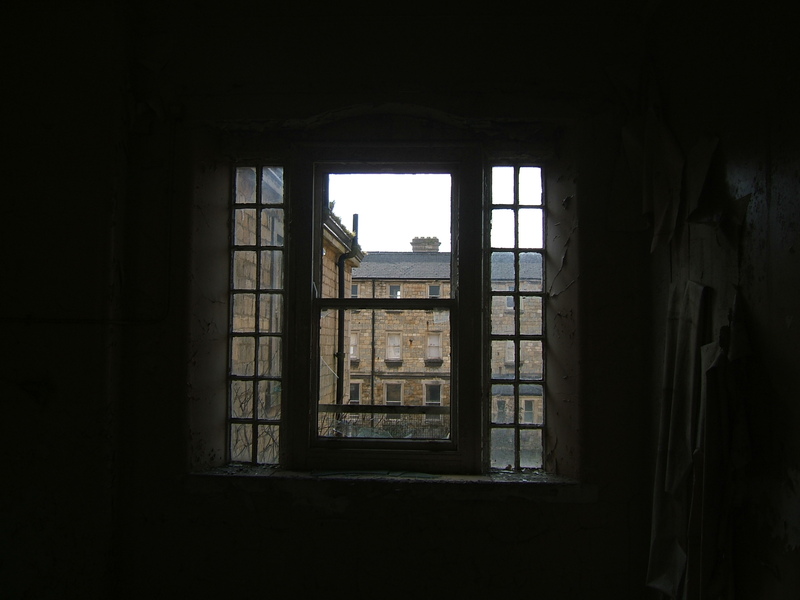 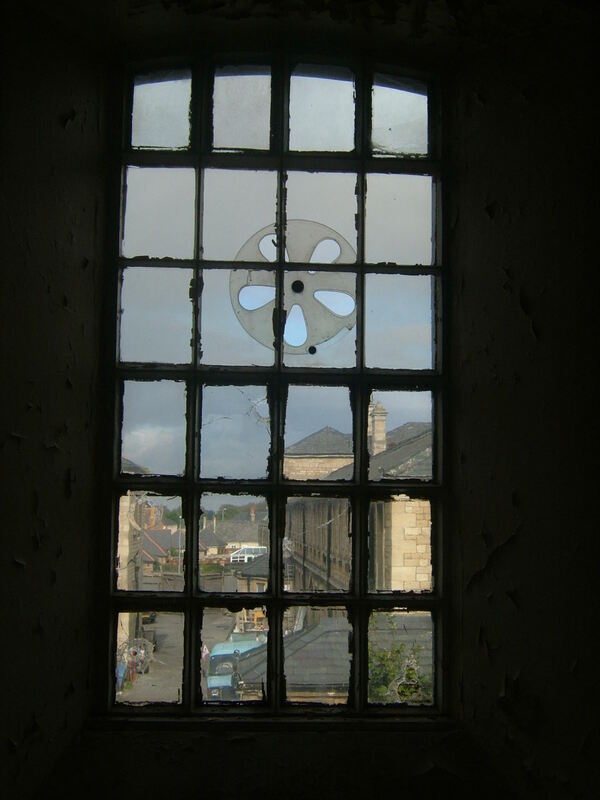 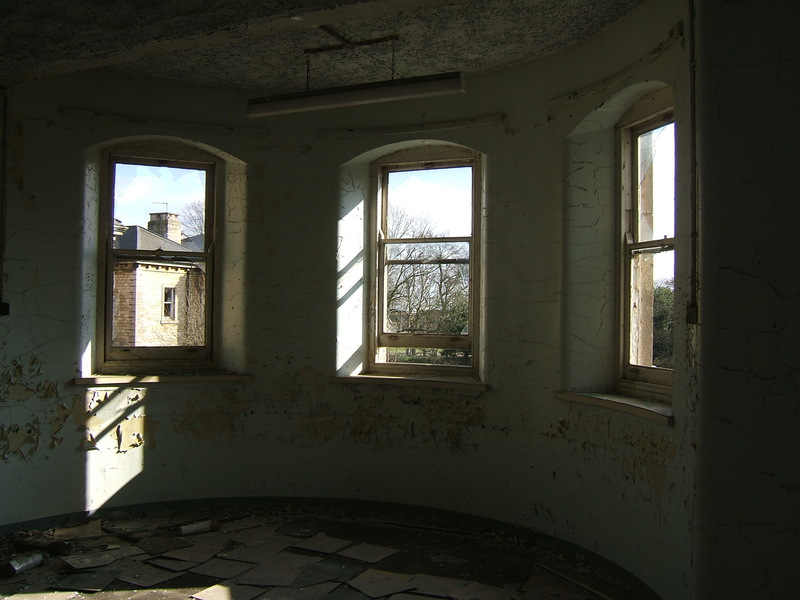 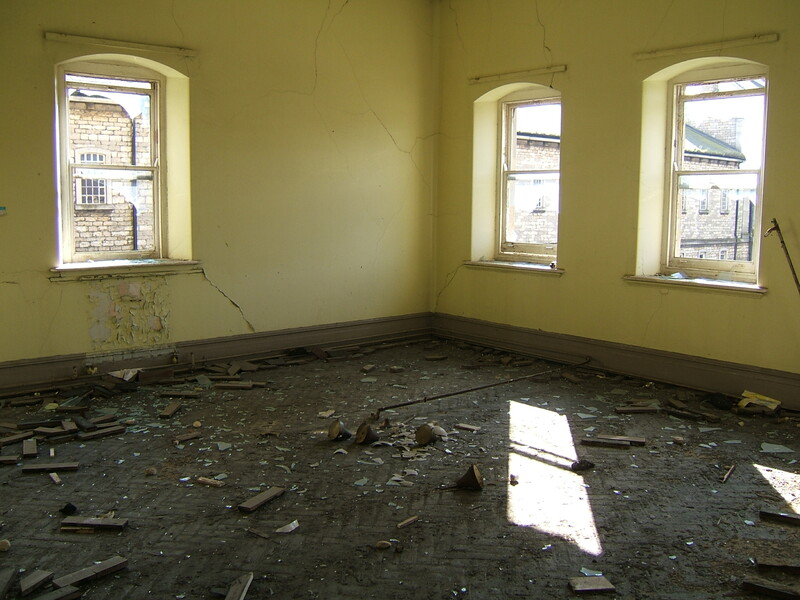 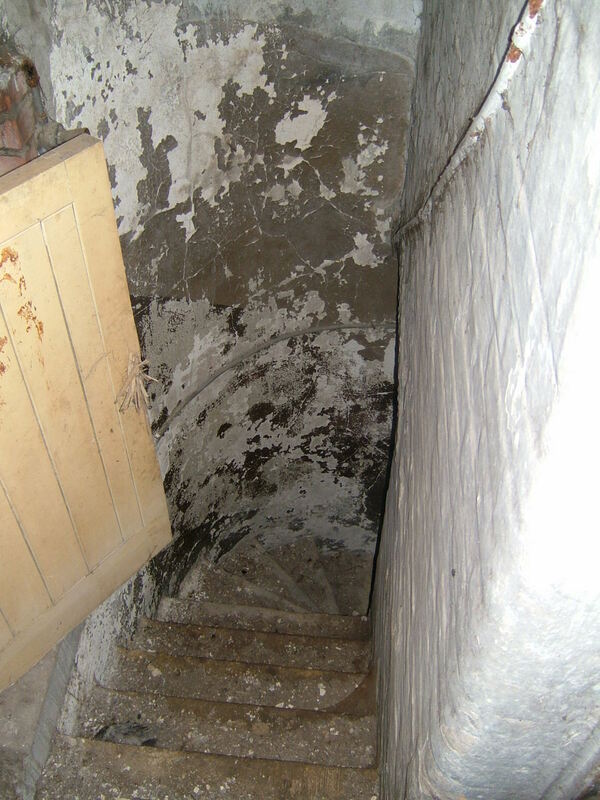 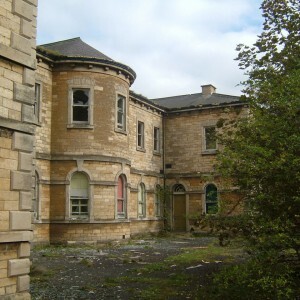 Until this time pauper patients were accommodated at the Lincoln Asylum, close to the castle, which had been opened in 1820 but was intended predominantly as a public subscription establishment, with each parish or poor law paying for treatment of their inmates. 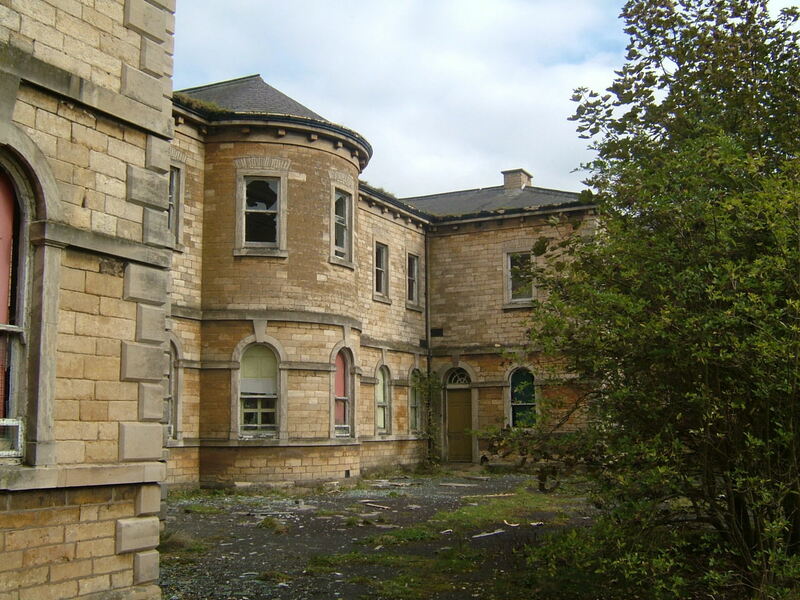 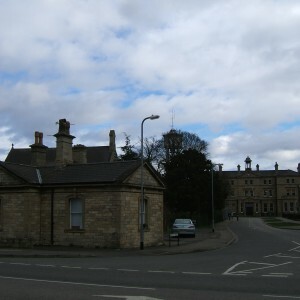 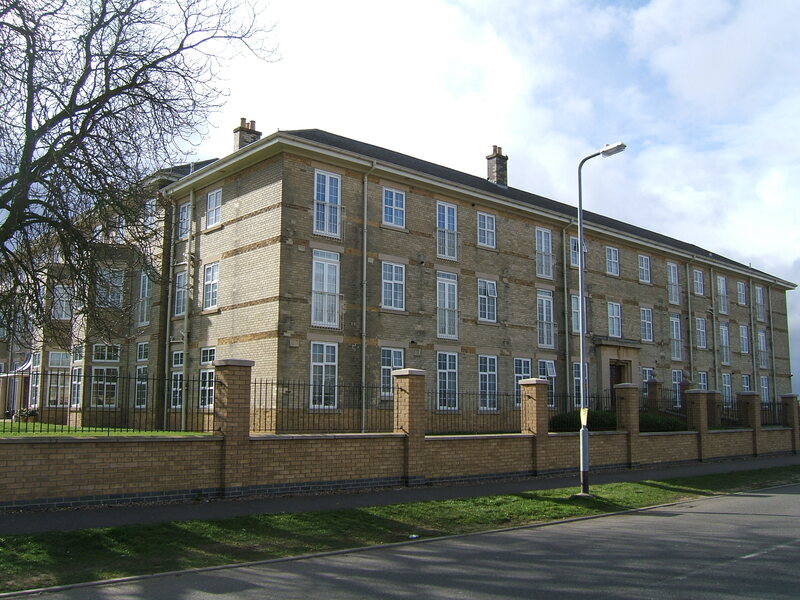 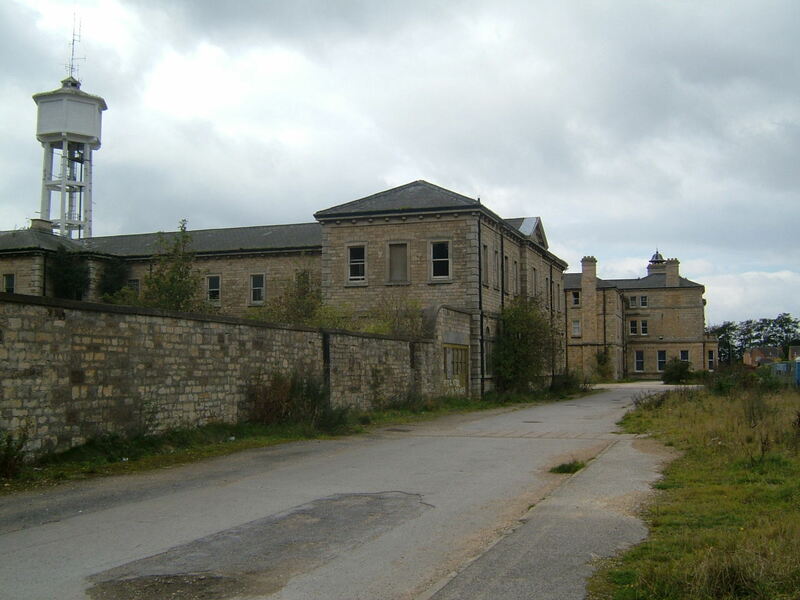 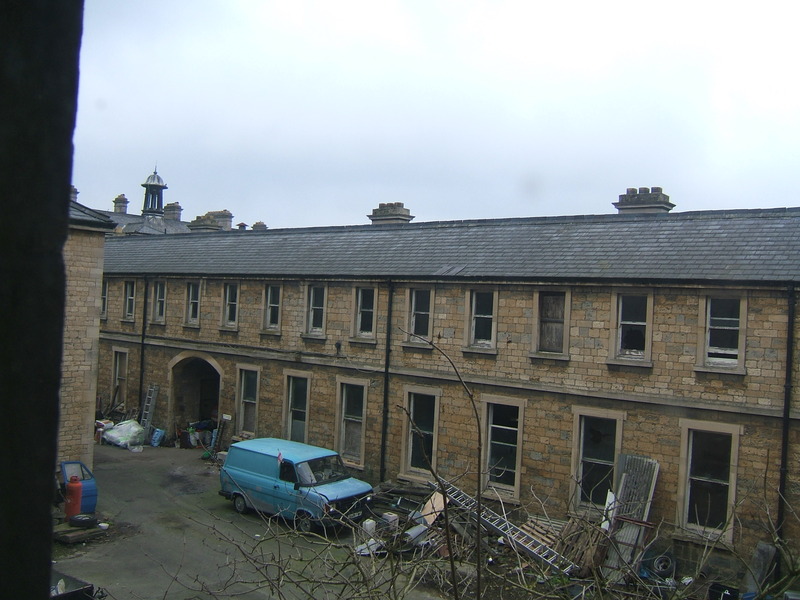 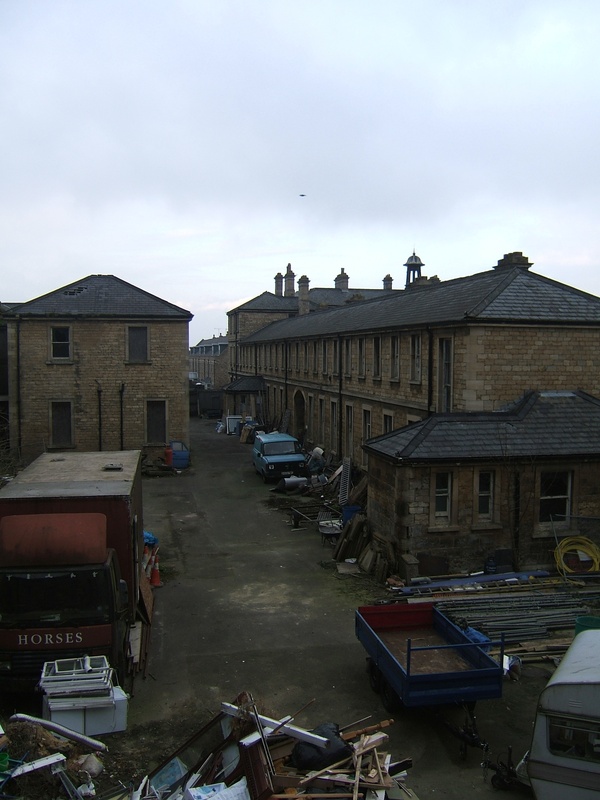 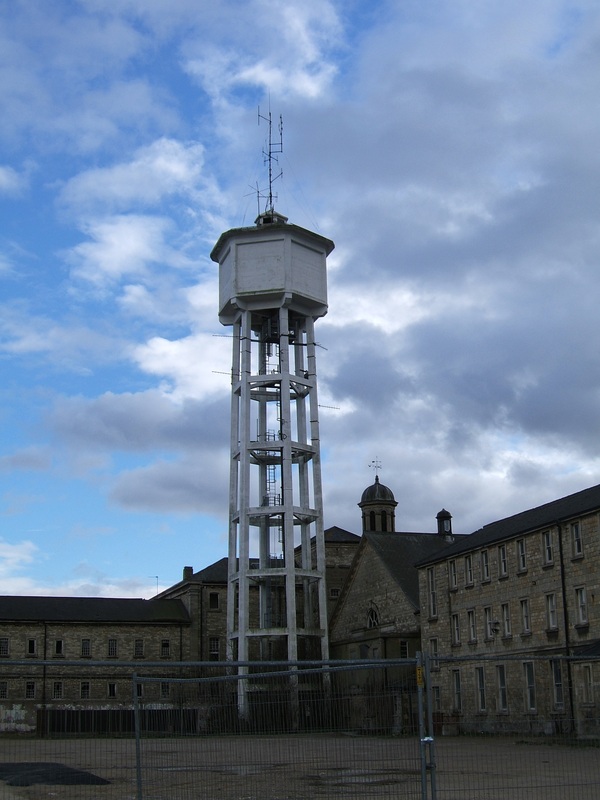 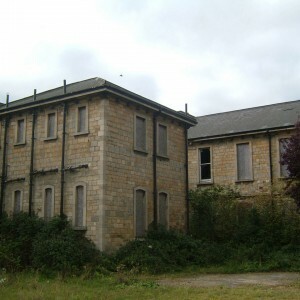 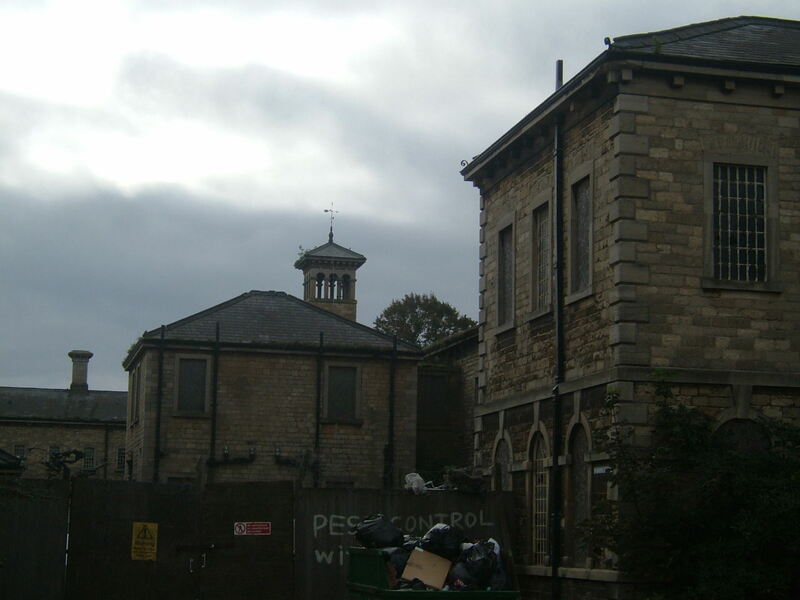 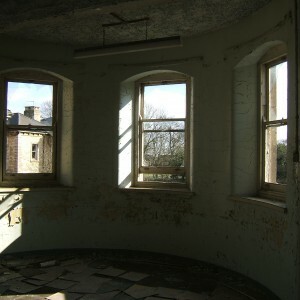 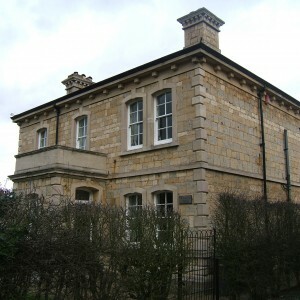 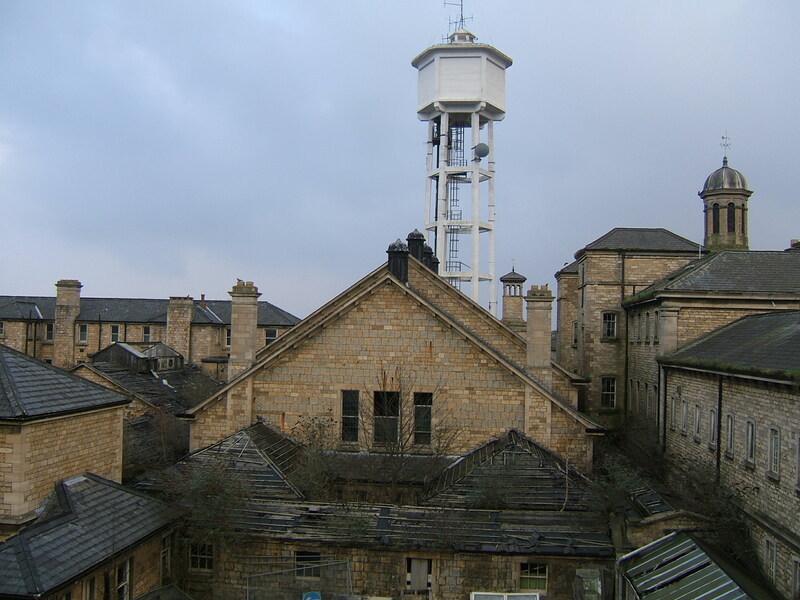 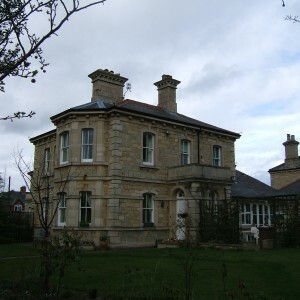 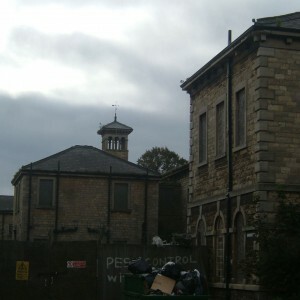 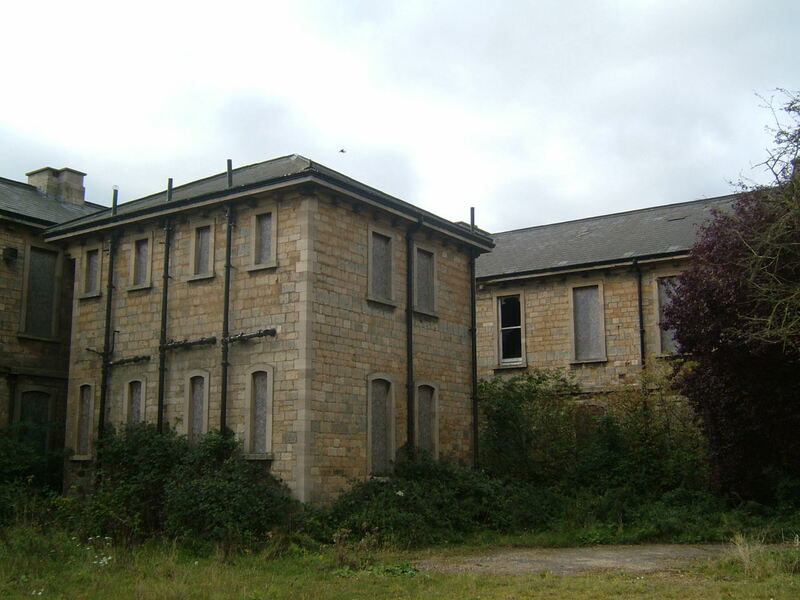 The Lincoln asylum was also confined by its hilly, central location and comparatively small size making a new-build establishment preferable over purchasing the existing institution. 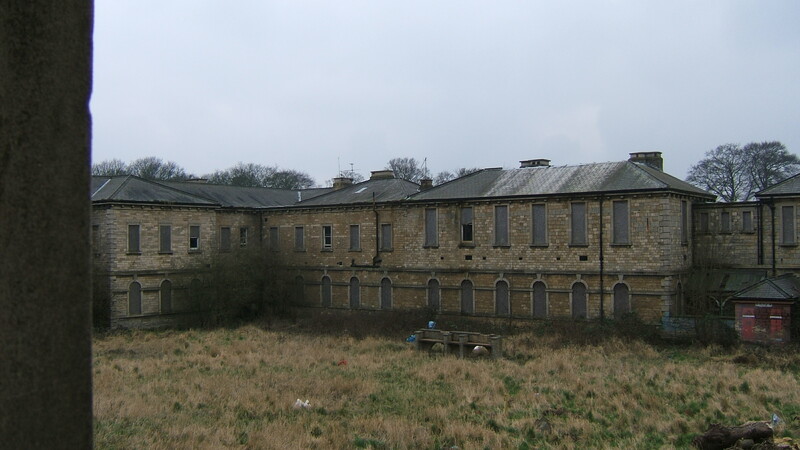 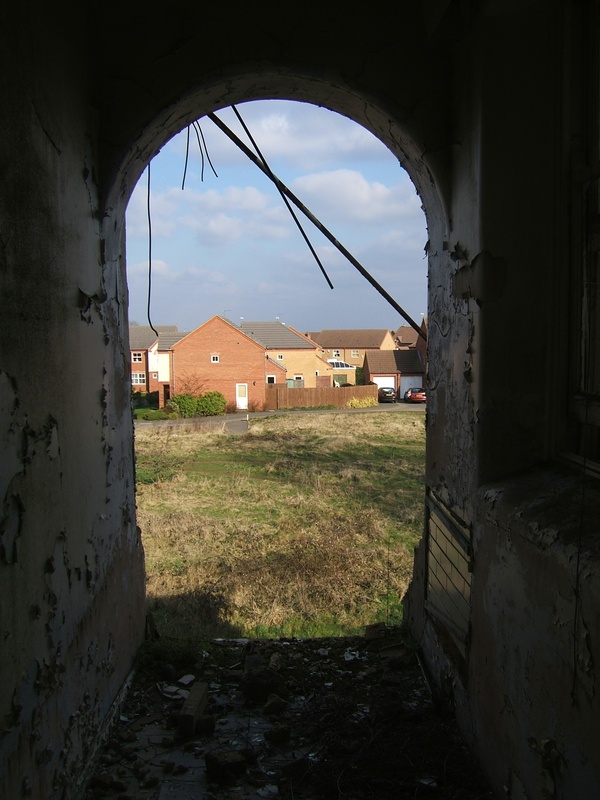 The site at Bracebridge heath was by comparison a rural, flat open site alongside the main Lincoln to Sleaford road offering a readily available supply of cheap farming land with which to provide produce support the asylum population. 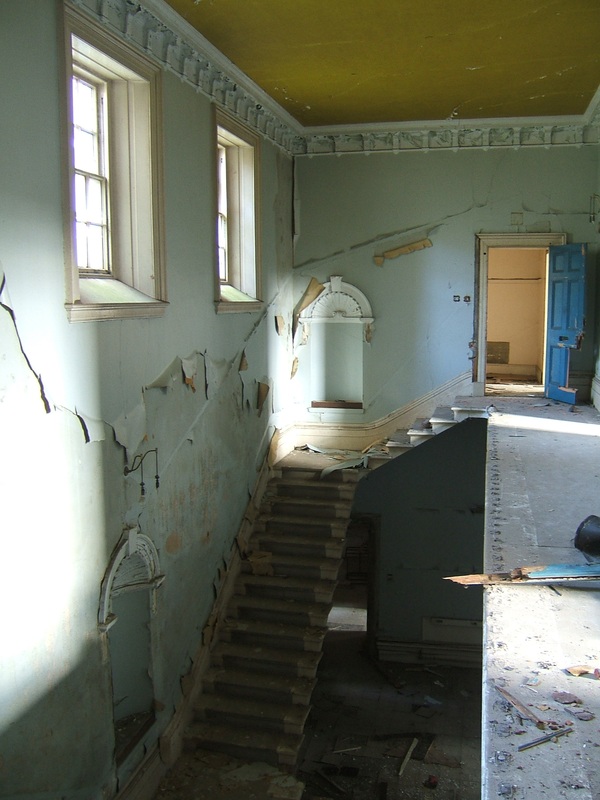 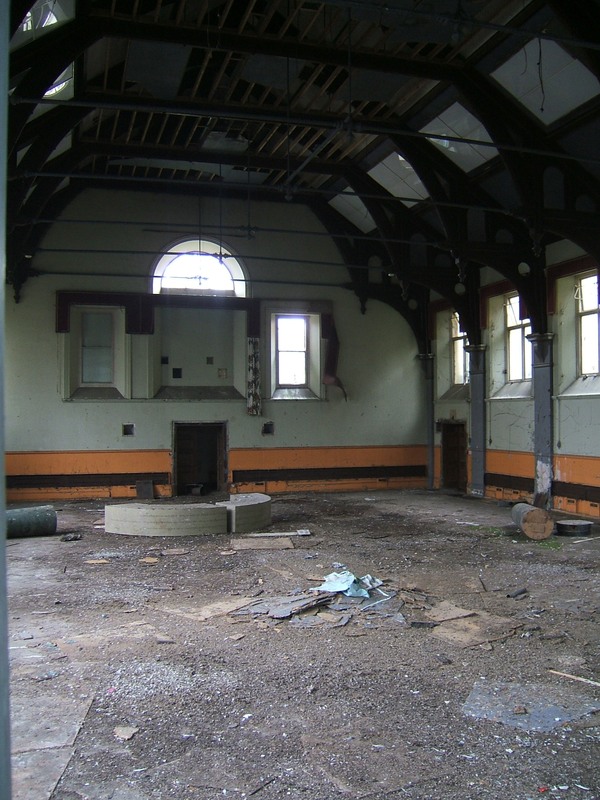 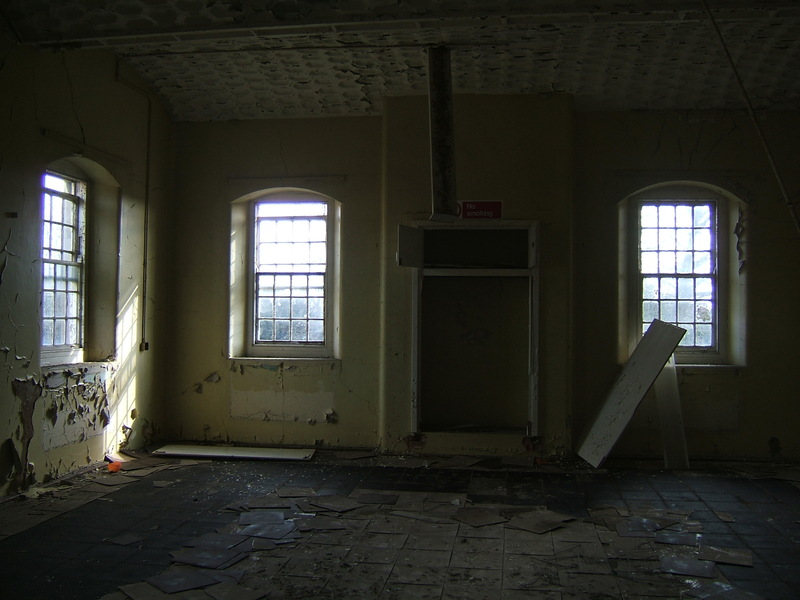 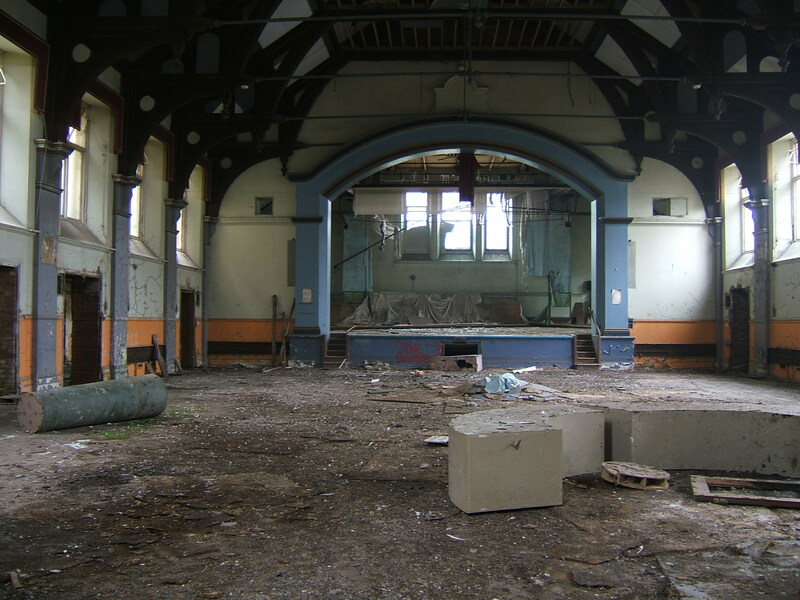 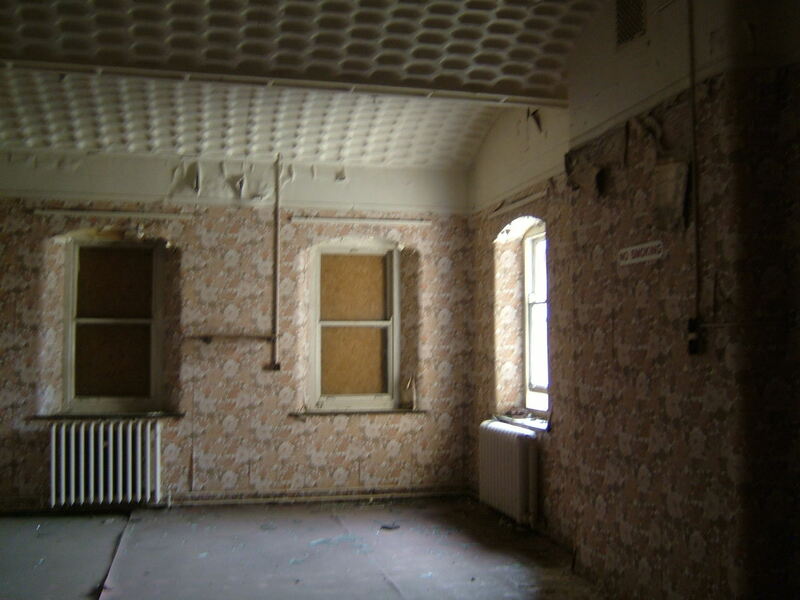 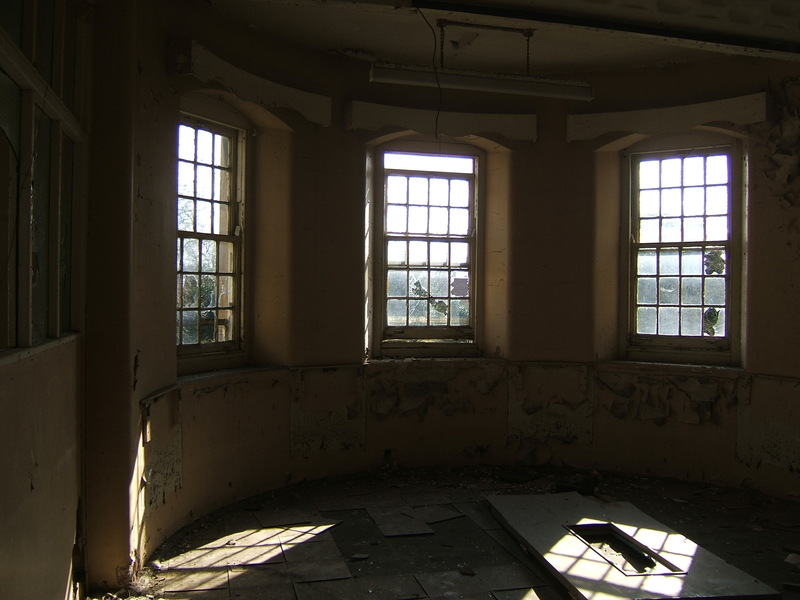 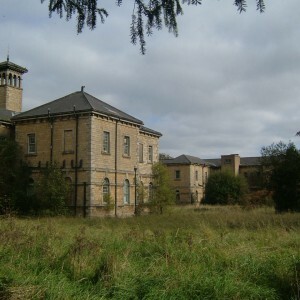 The buildings were planned by John R Hamilton and James Medland of Gloucester who had also provided the design for the Worcestershire County Asylum at Powick. 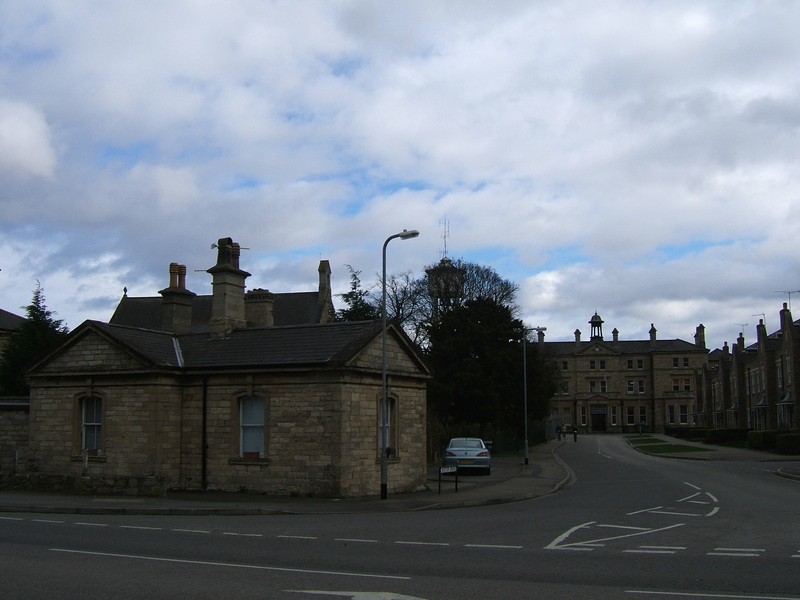 The appointment of Thomas Parry as county surveyor appears to have resulted in considerable contention with Hamilton as disputes appear to have arisen over modifications to the design, resulting in Hamilton in leaving the project in 1850 shortly after Parry’s appointment. 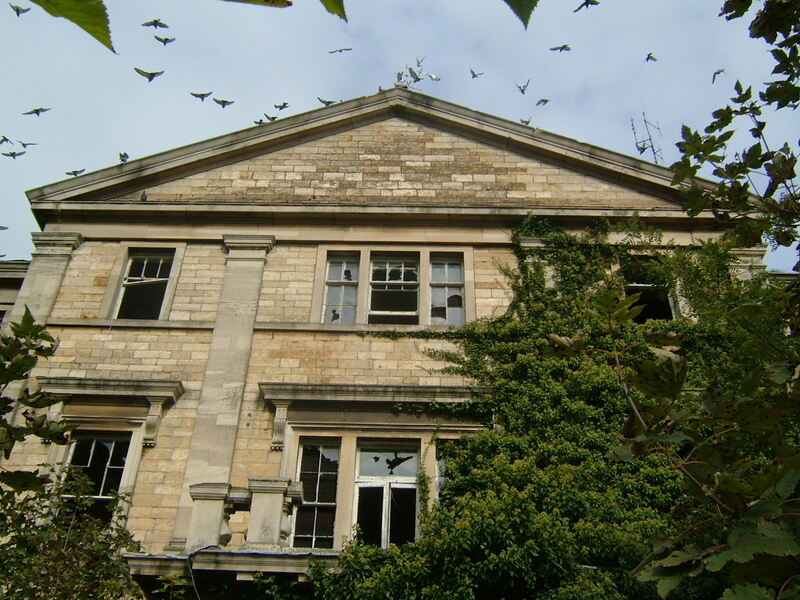 The building itself was executed in local stone with male and female wings either side of central services block with the Superintendent’s residence occupying the principal portion of frontage of the south front and decorated with a porch and pediment. 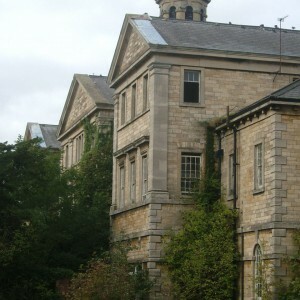 The walled superintendent’s garden separated the male and female airing courts. 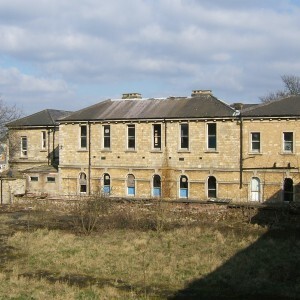 Behind the adjacent wards were single storey blocks for refractory patients . 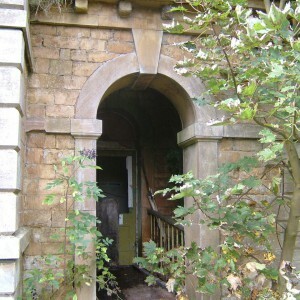 A small gatehouse guarded the entrance to the north of the site. 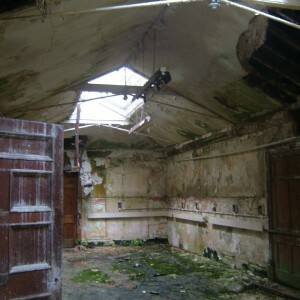 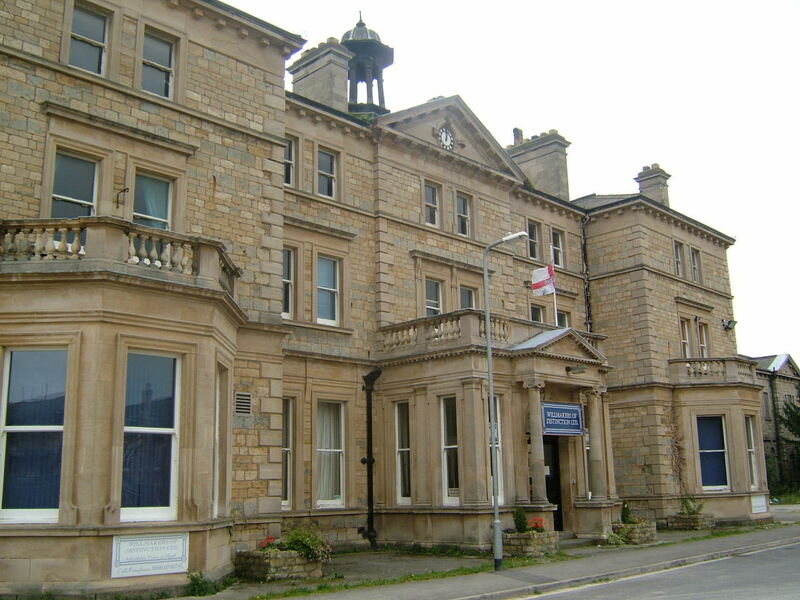 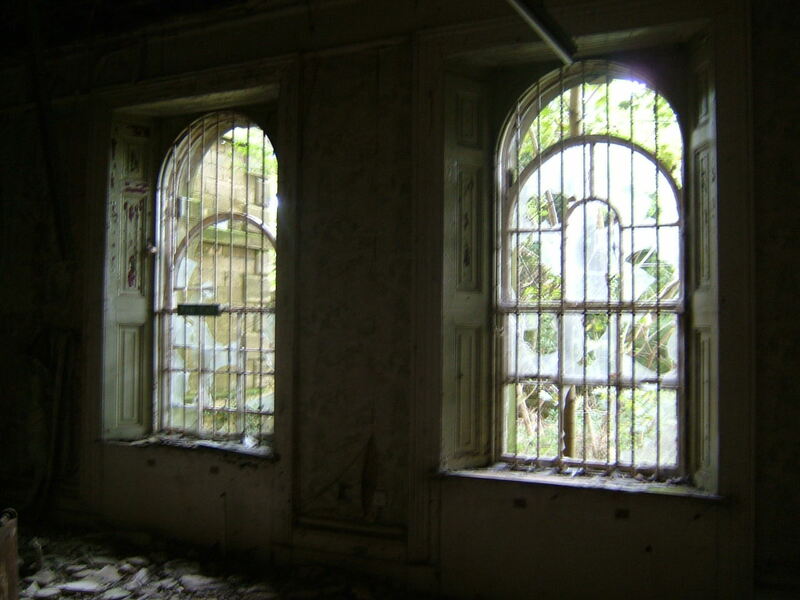 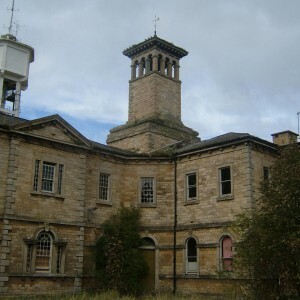 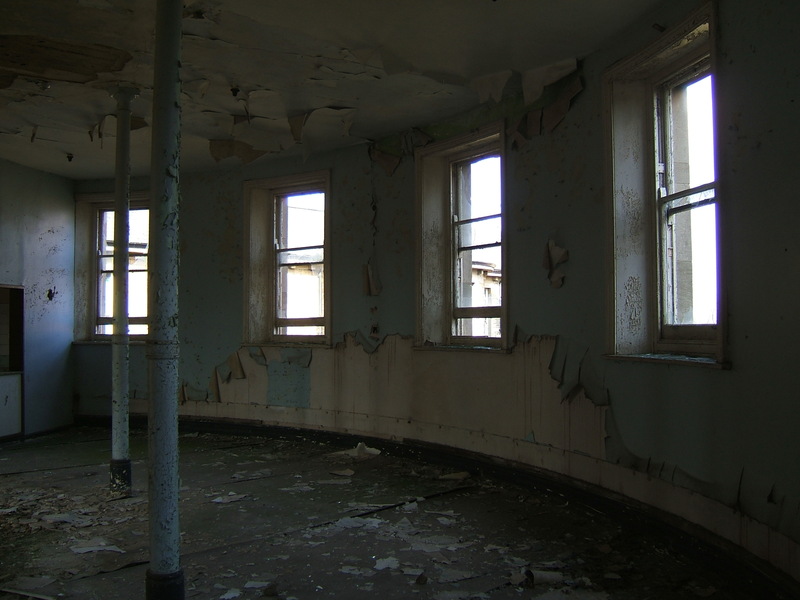 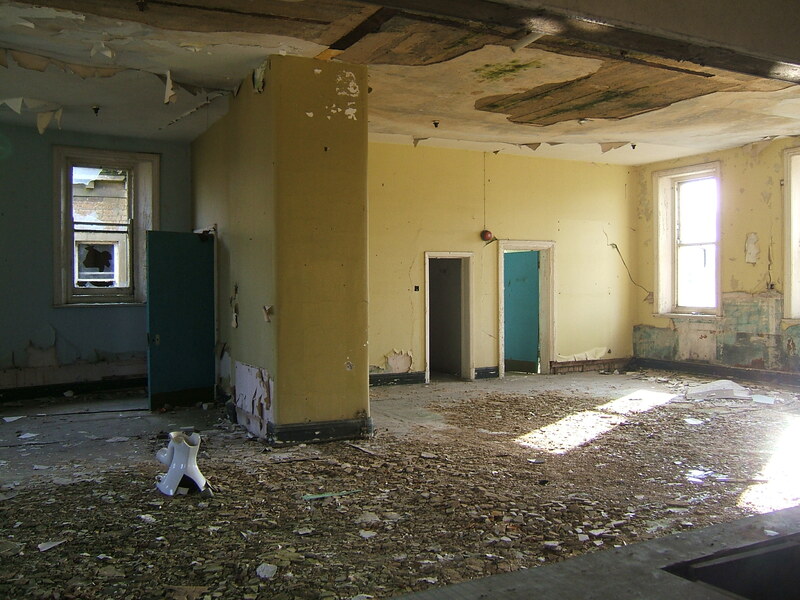 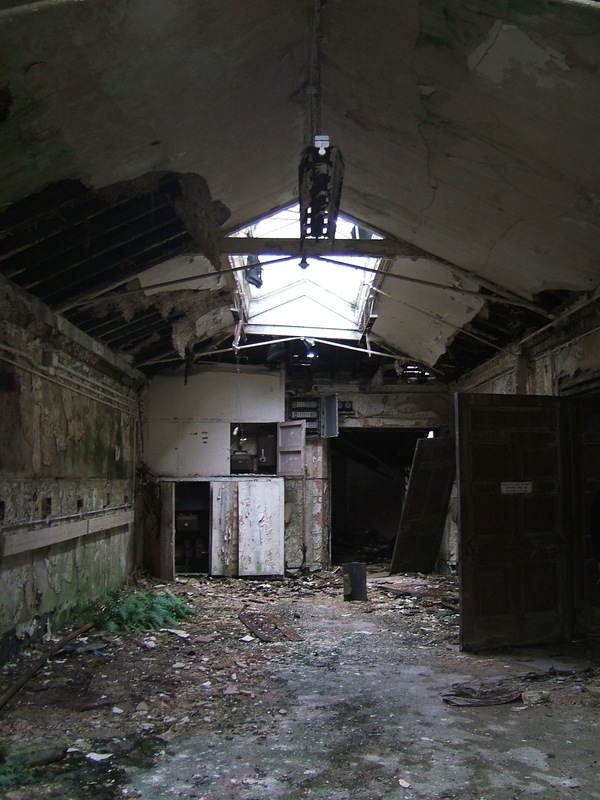 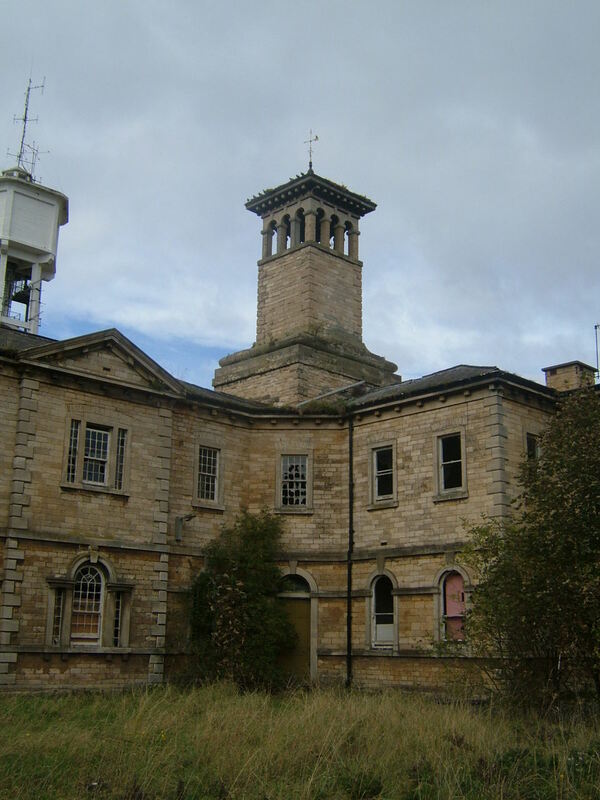 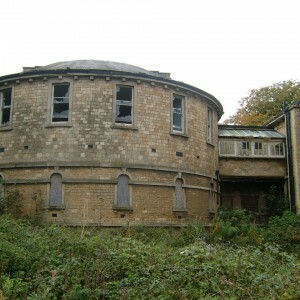 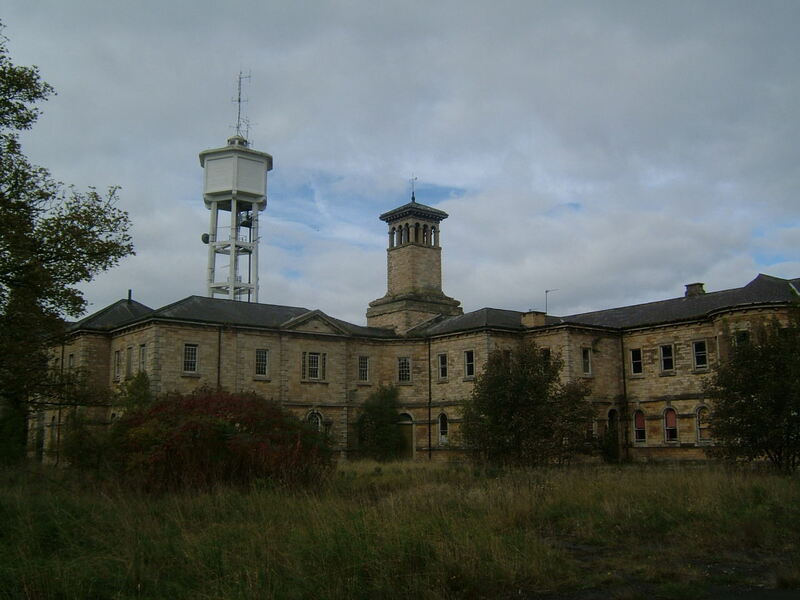 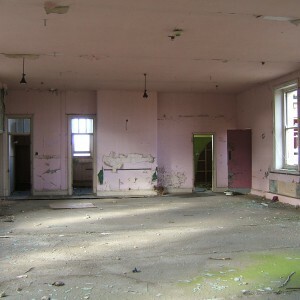 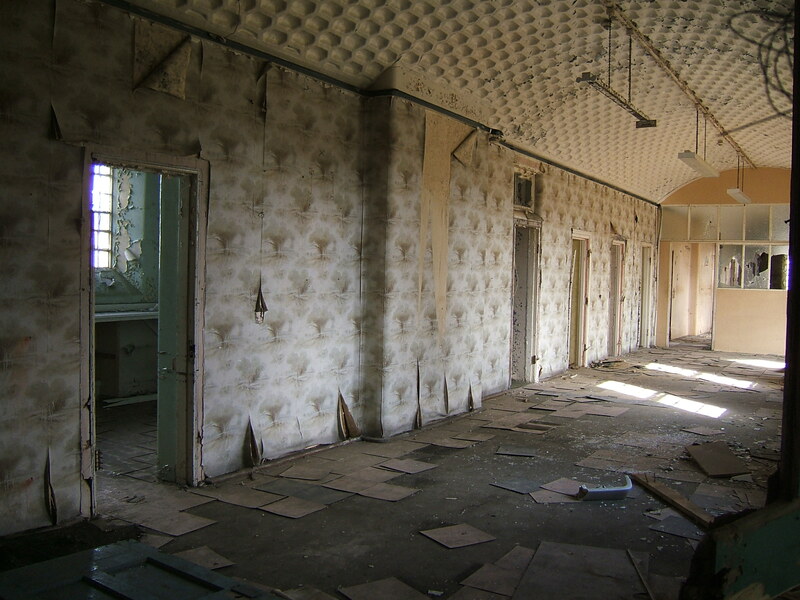 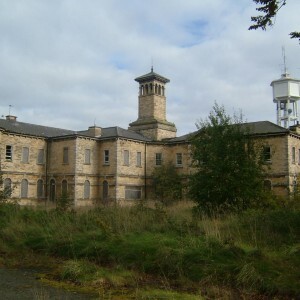 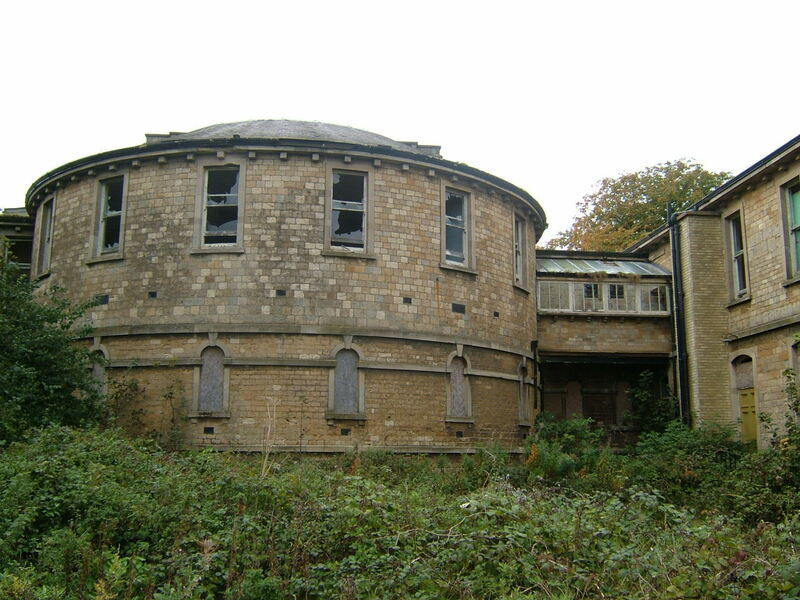 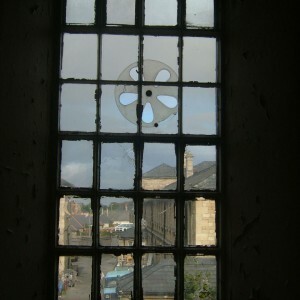 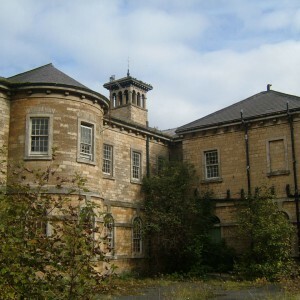 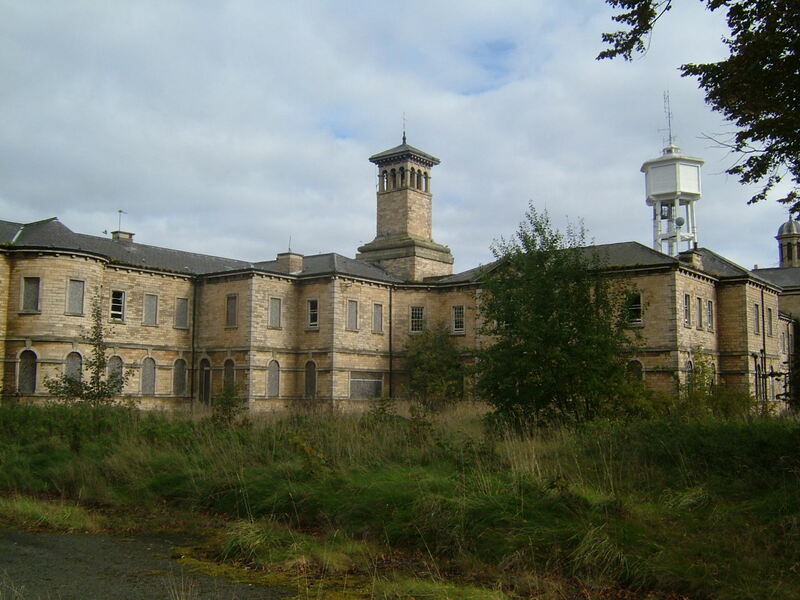 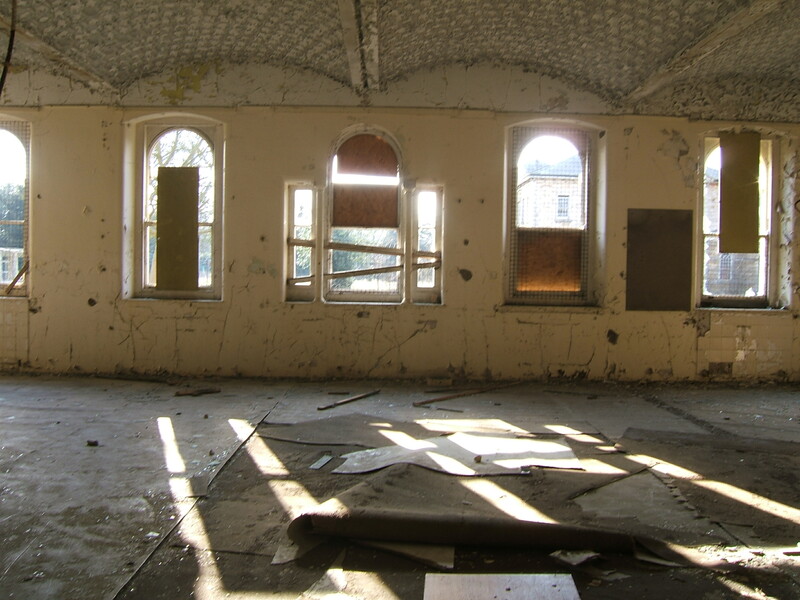 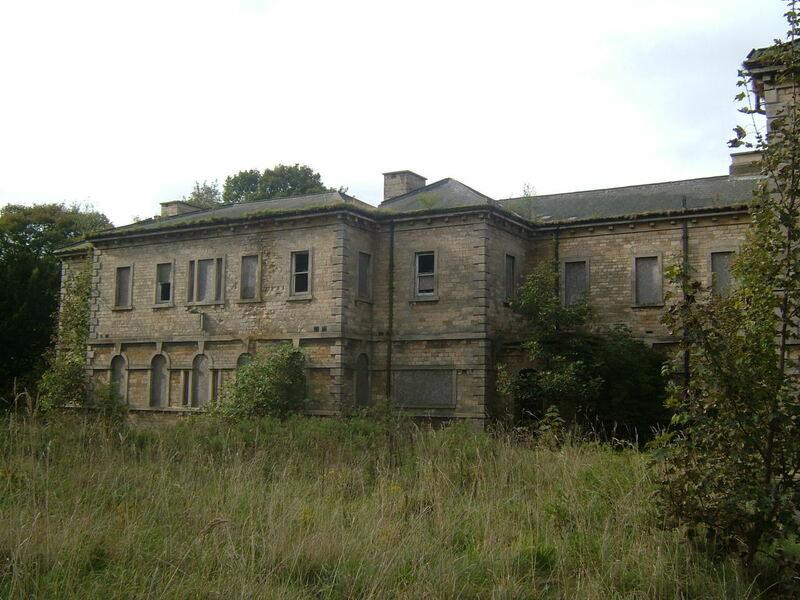 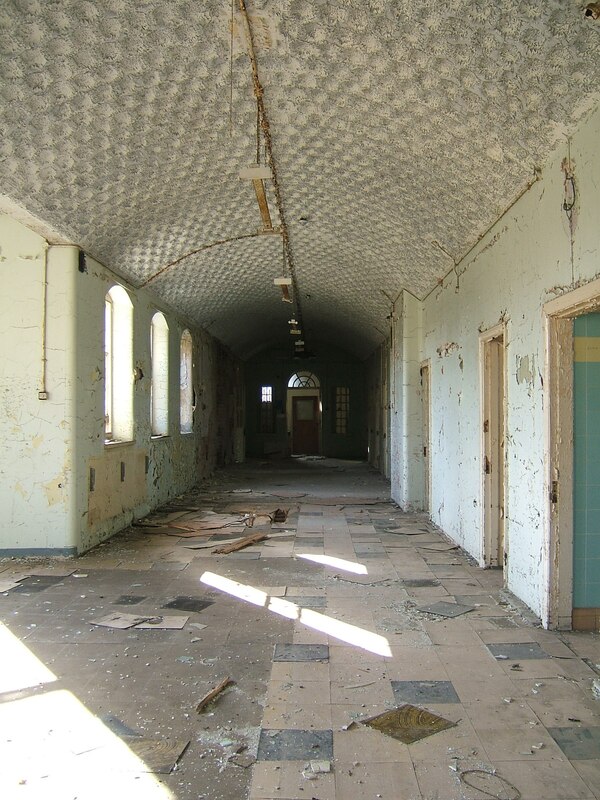 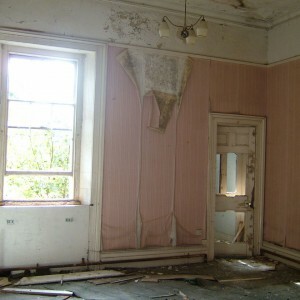 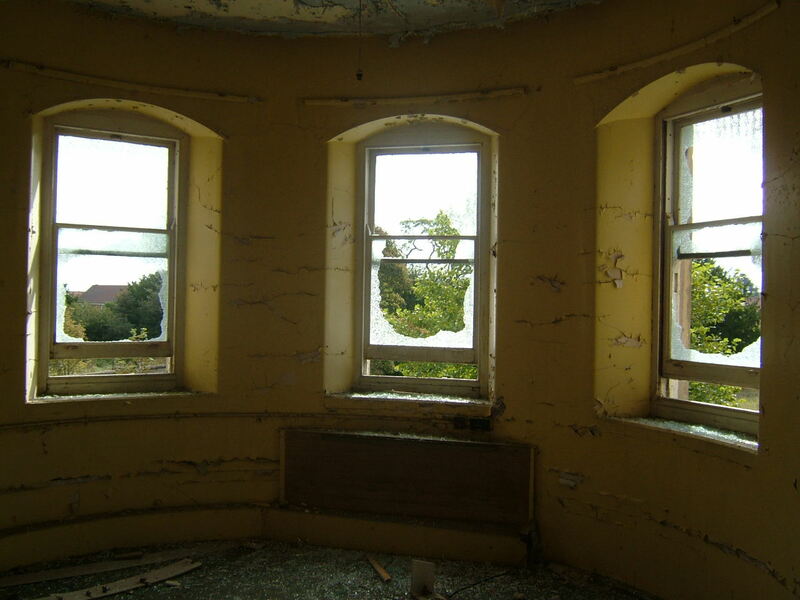 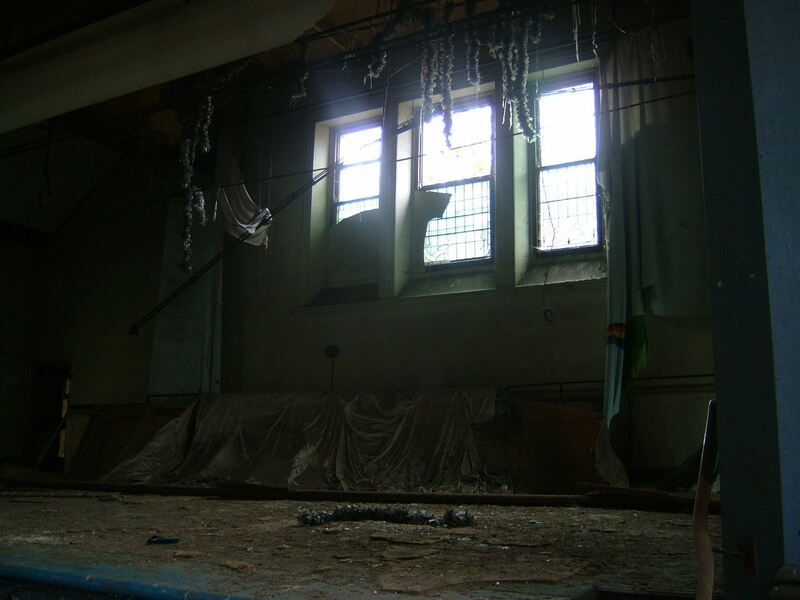 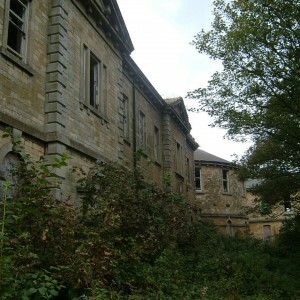 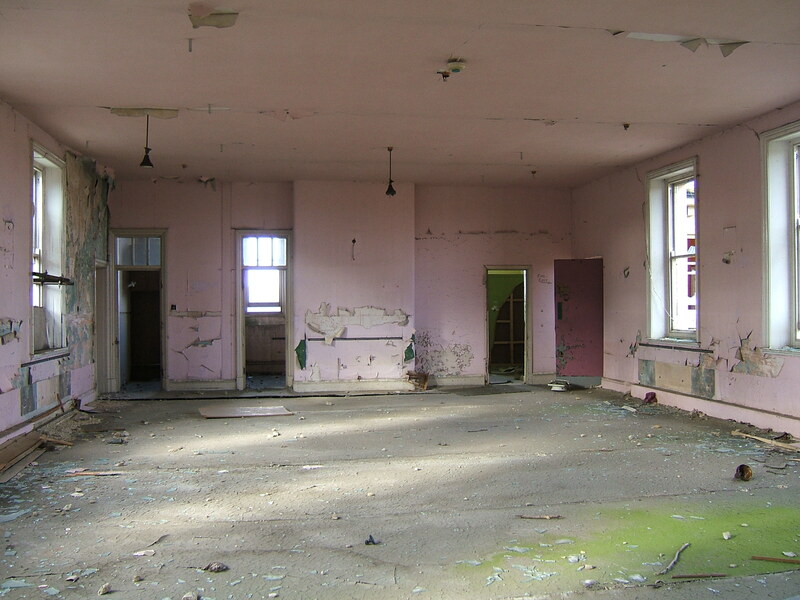 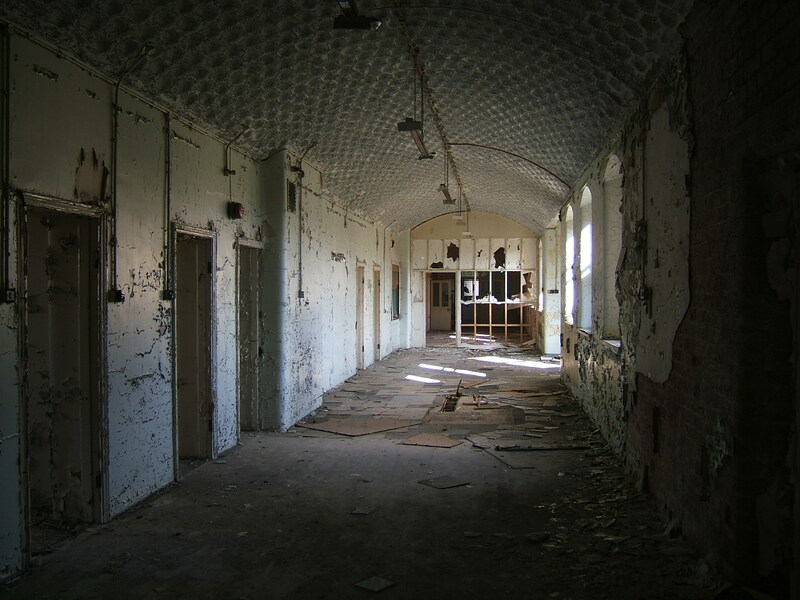 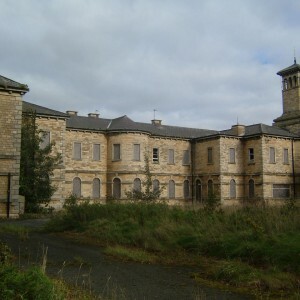 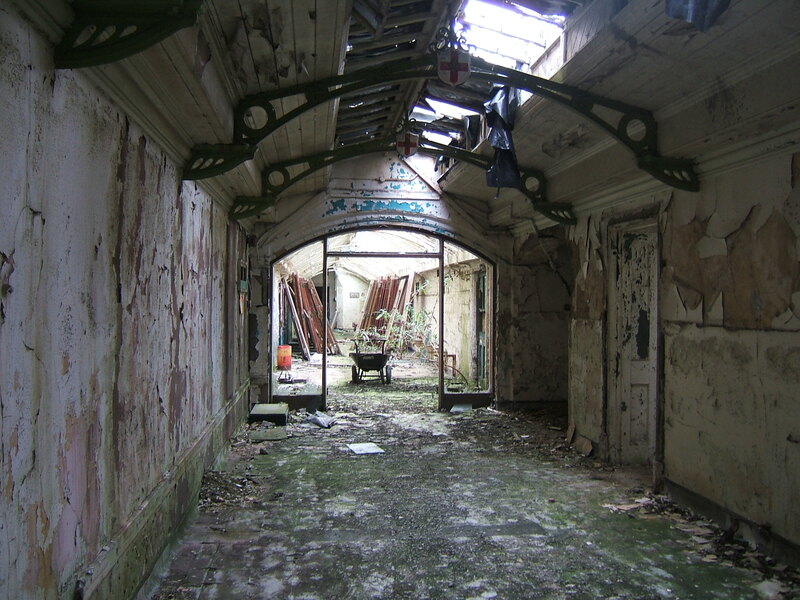 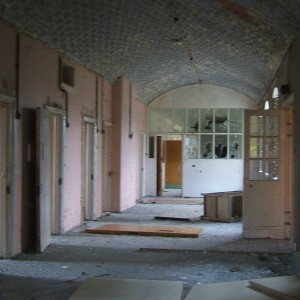 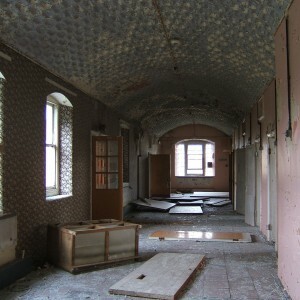 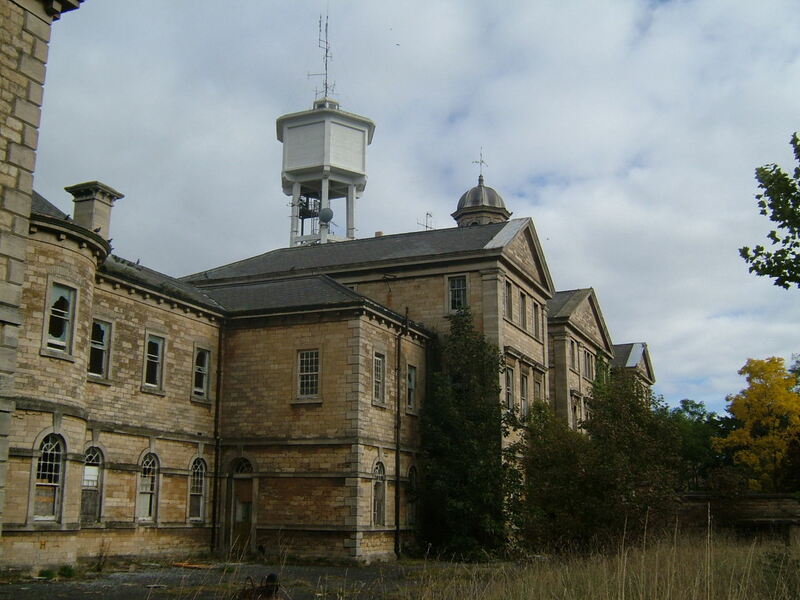 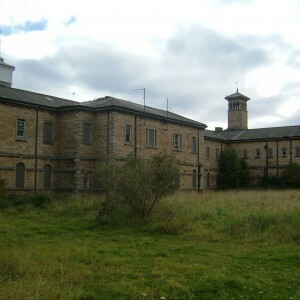 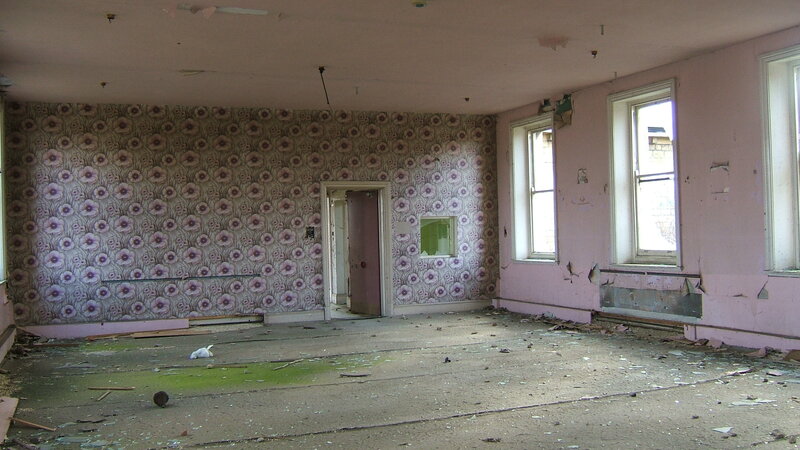 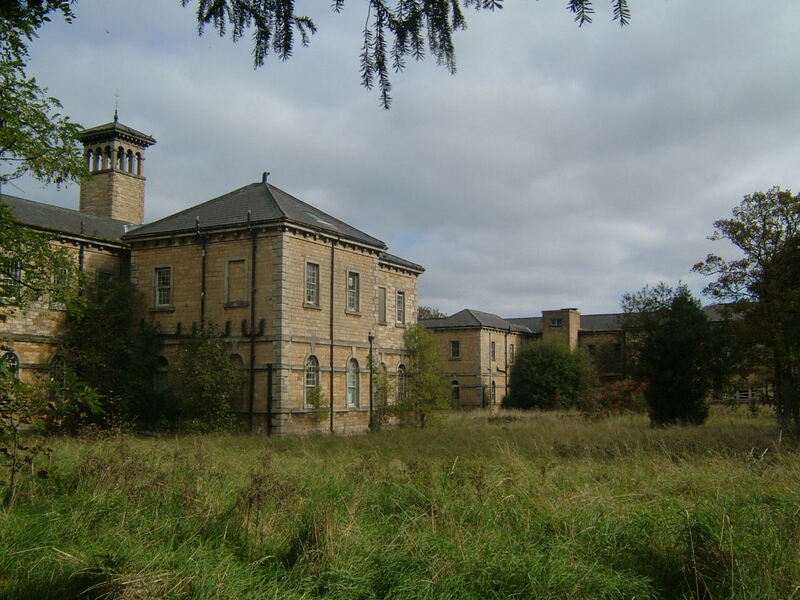 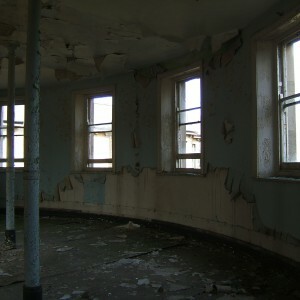 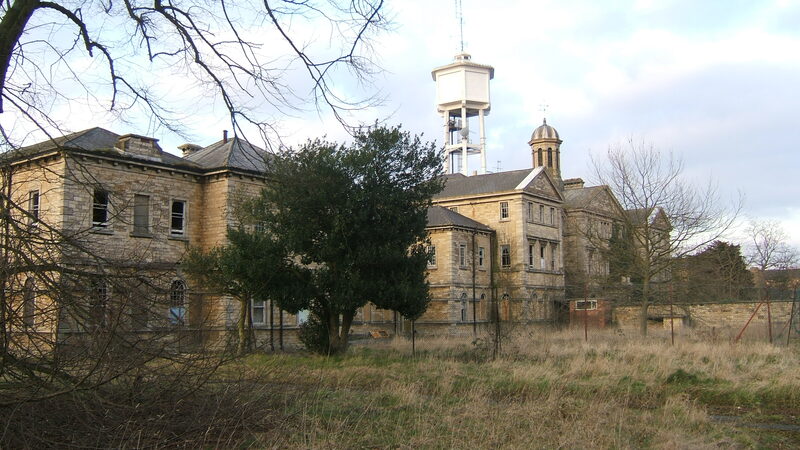 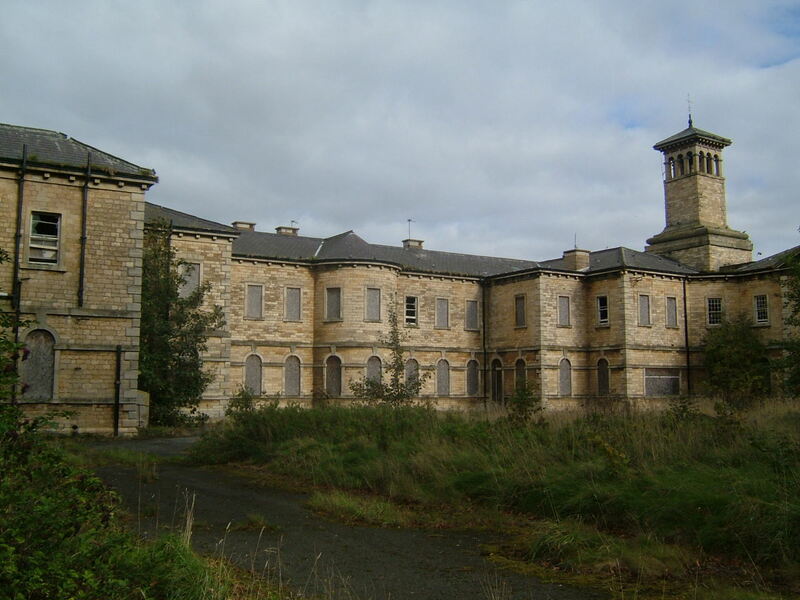 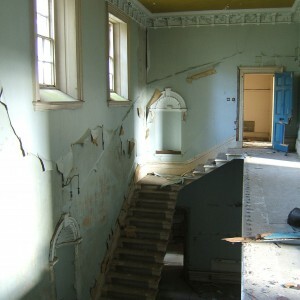 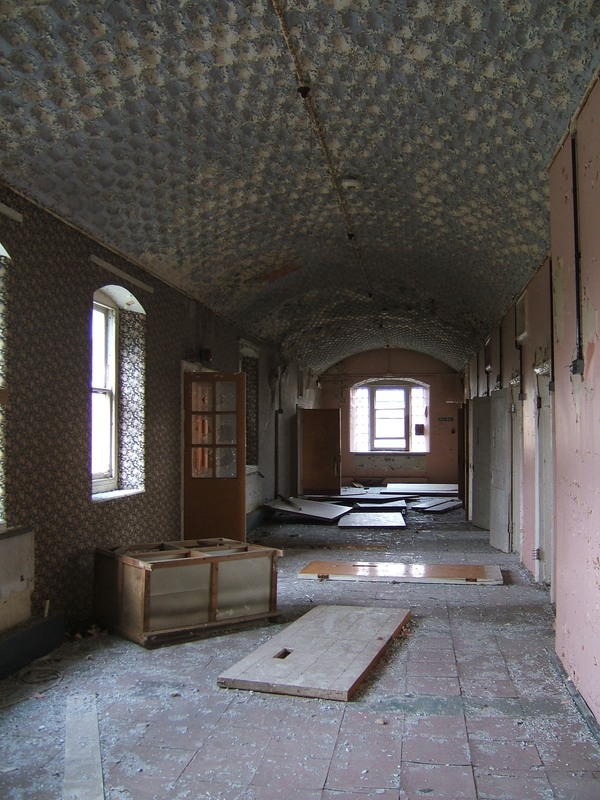 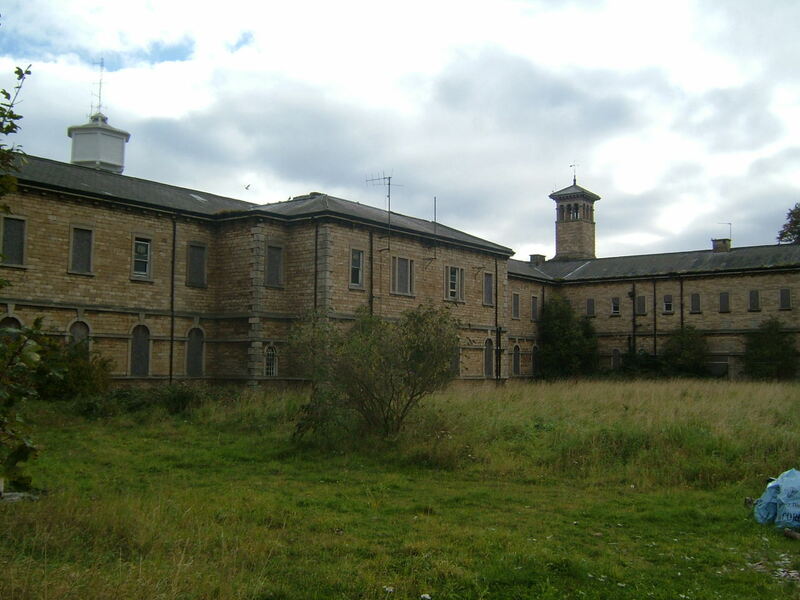 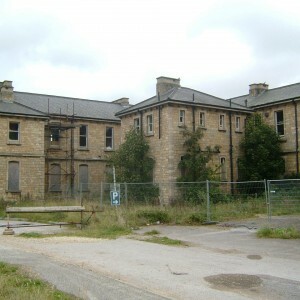 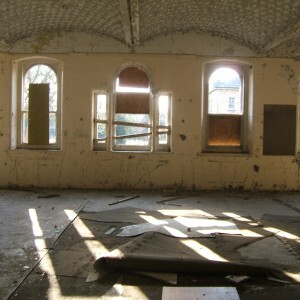 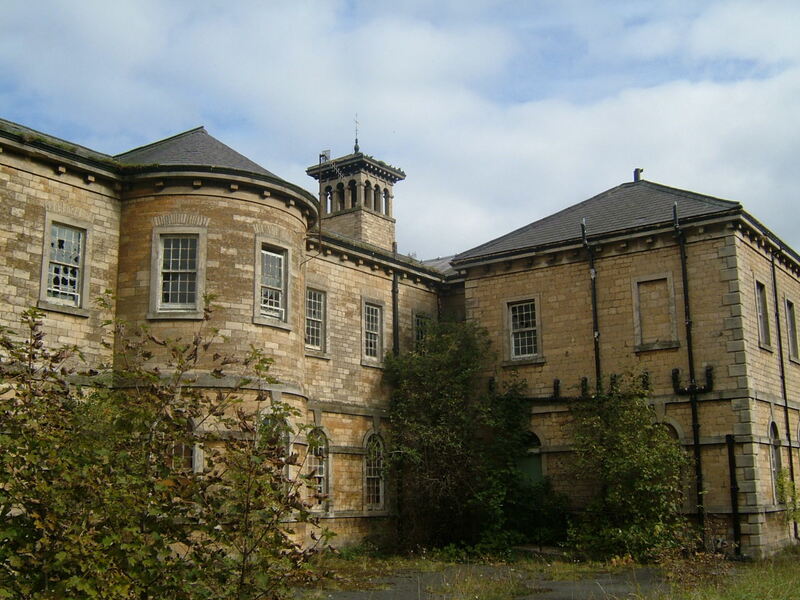 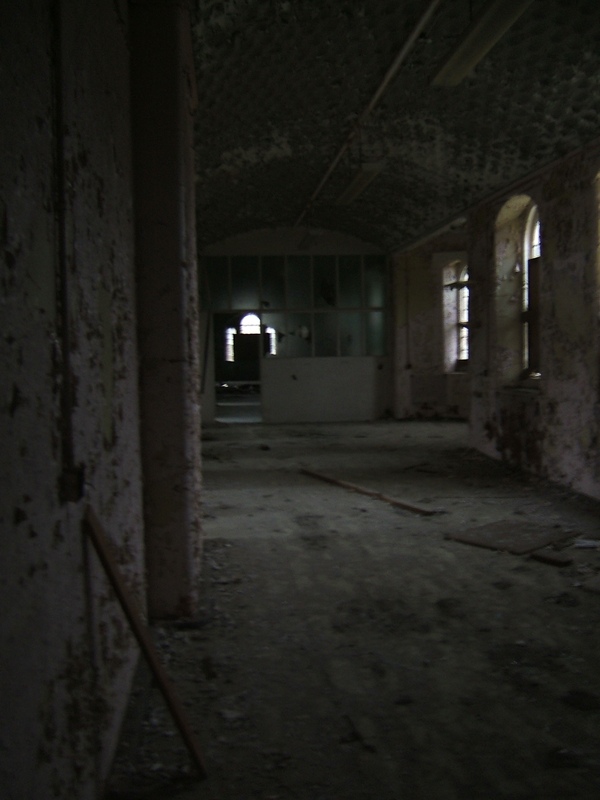 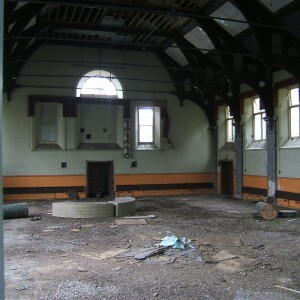 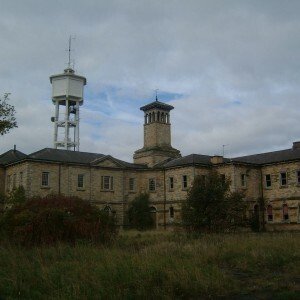 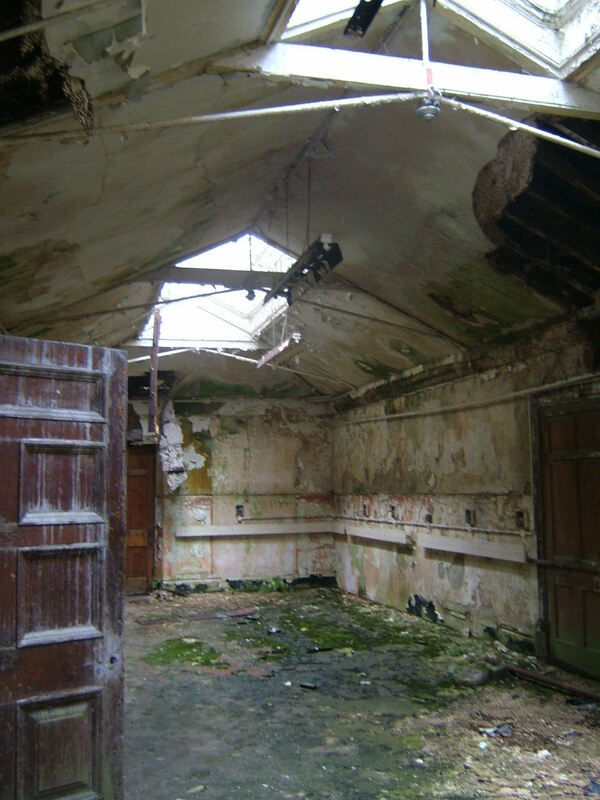 The hospital was subject to numerous additions over the following years to cope with increasing numbers of inmates and the requirements for better facilities, the first taking place in 1858 by Thomas Parry. 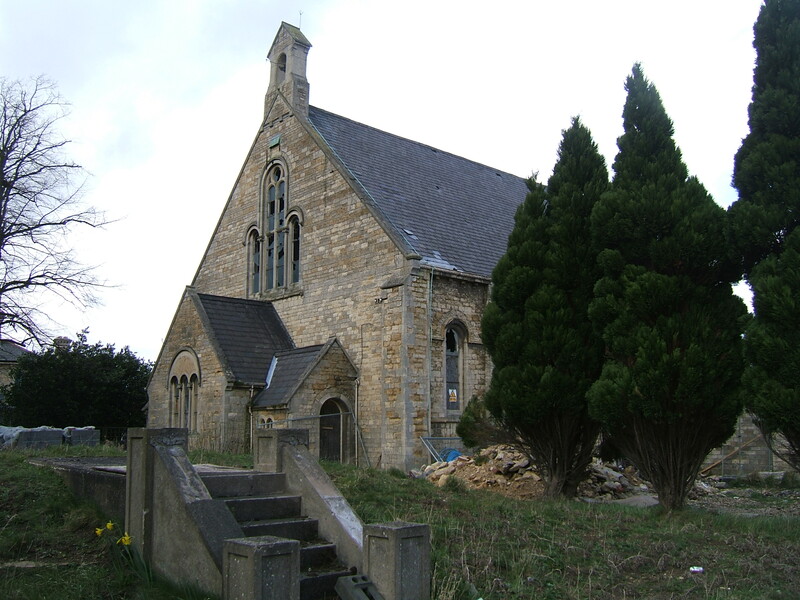 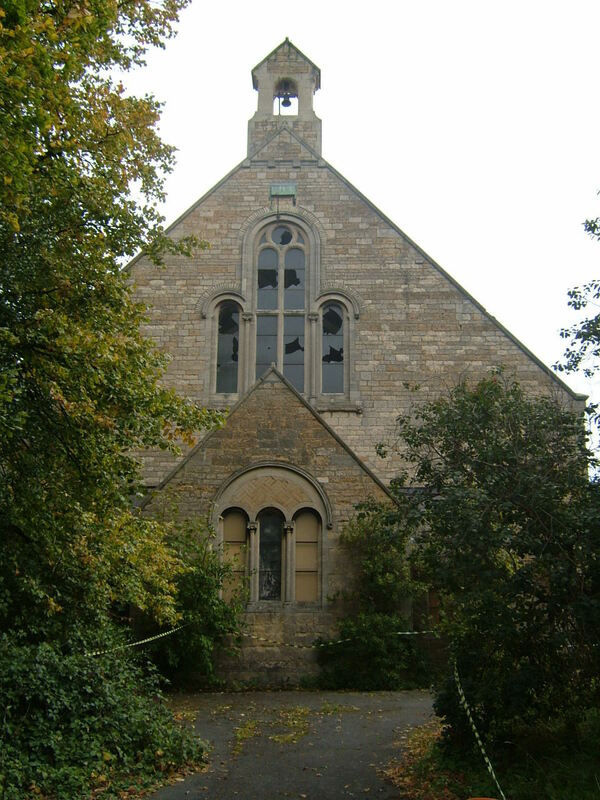 A cemetery and mortuary chapel was consecrated in 1855 to the south of the site as the local burial ground was unable to support the volume of pauper burials resulting from the asylums presence. 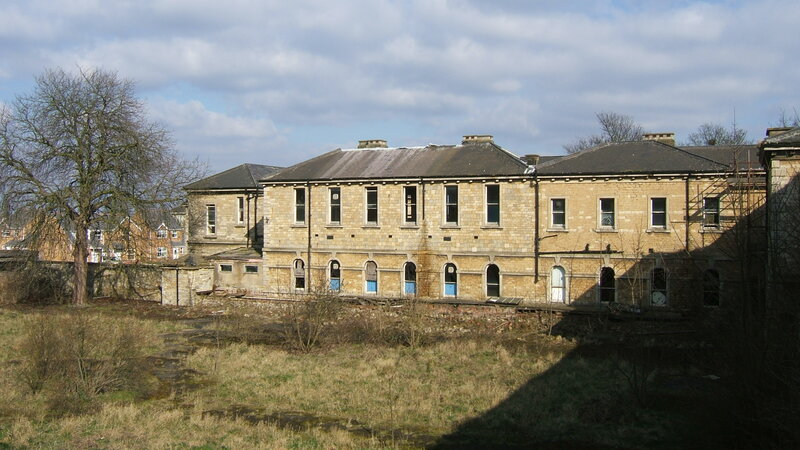 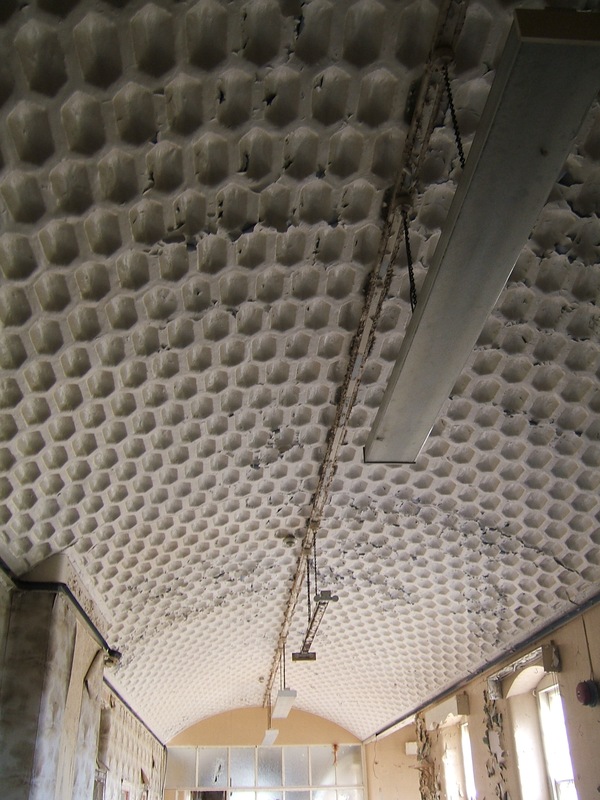 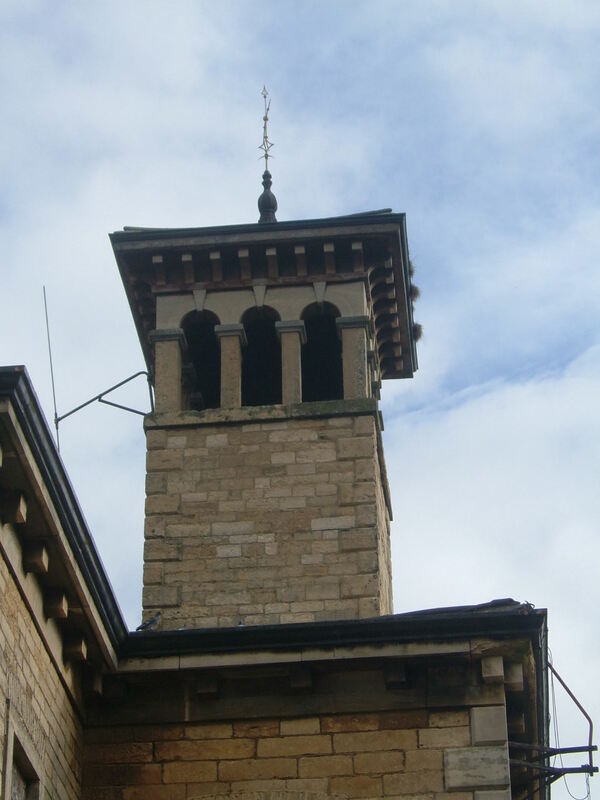 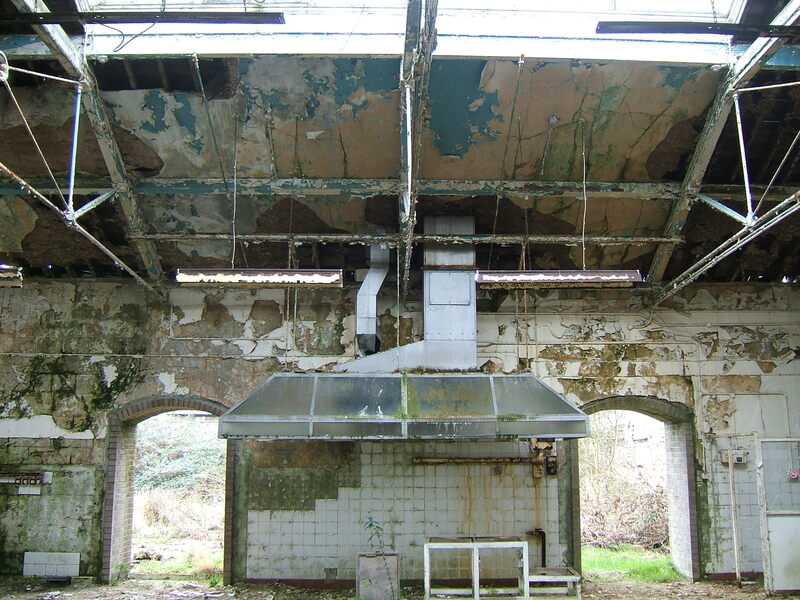 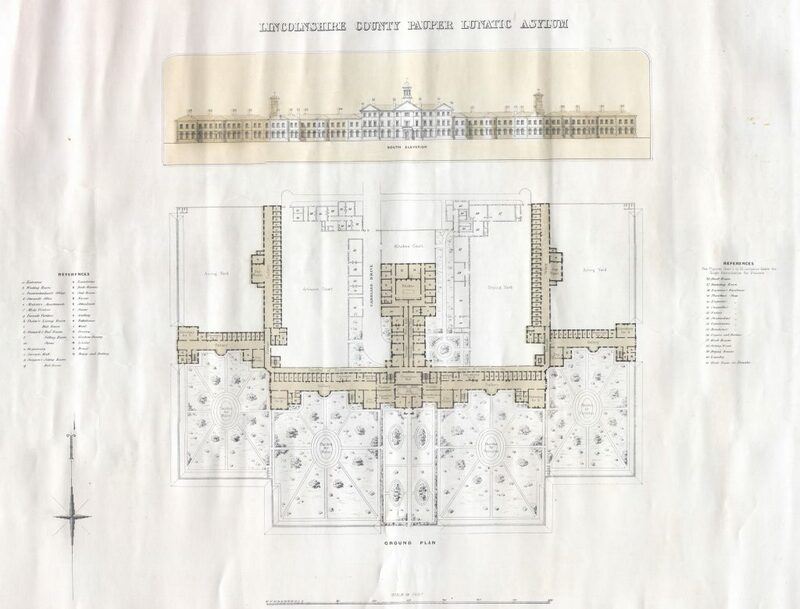 Additional wards were provided with an upper floor to the refractory block, and in 1882 further wings extended either side of the main frontage to designs by FH Goddard, who was also responsible for the addition of sanitary towers to the original wards in 1897. 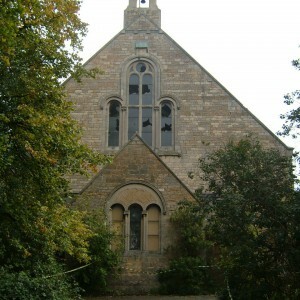 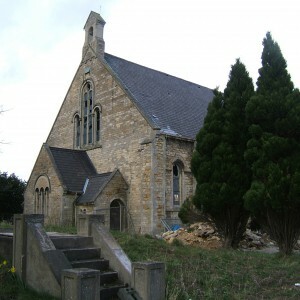 A separate detached chapel was built in 1869 adjacent to the driveway which replaced the original within the centre of the asylum. 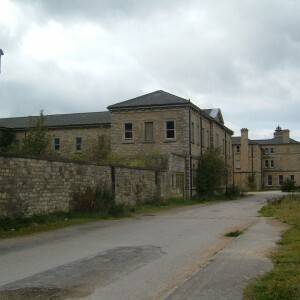 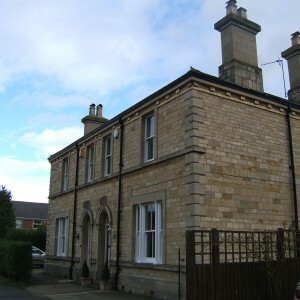 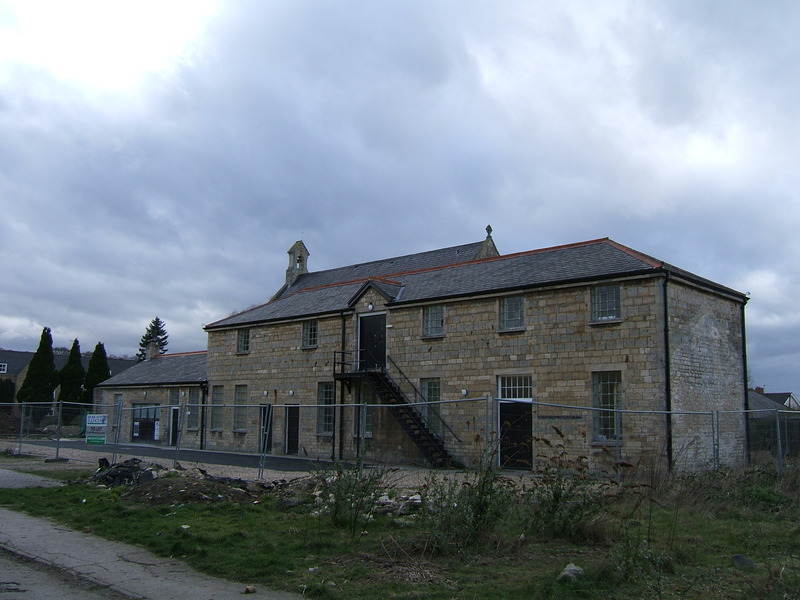 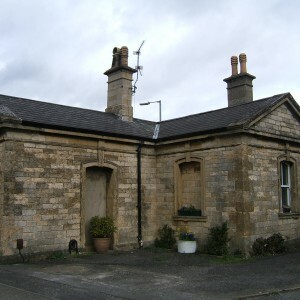 The previous collaboration between the various constituents of Lincolnshire broke down with the new administrative county of Kesteven and borough of Grantham leaving to develop their own institution, initially utilising the old Grantham Workhouse and later transferring to a new site at South Rauceby near Sleaford. 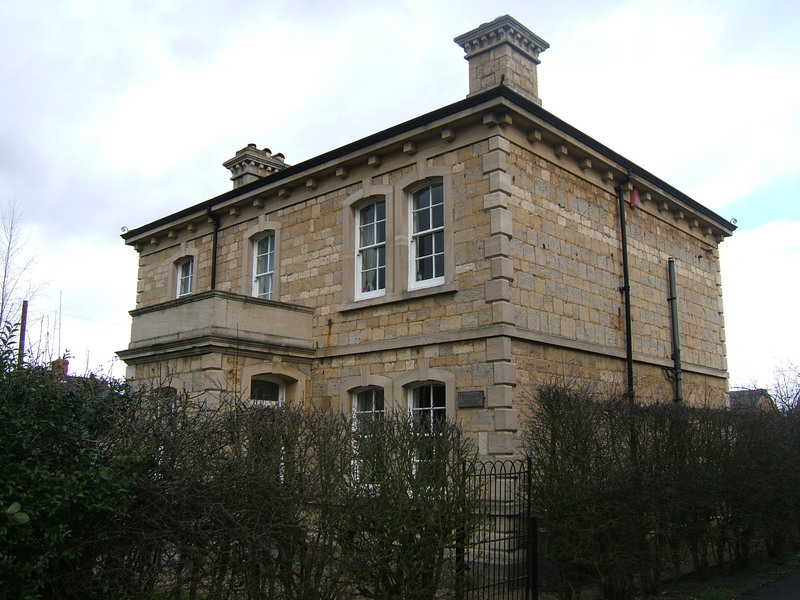 This left the administrative counties of Holland, Lindsey, the City of Lincoln and boroughs of Stamford and Grimsby with the responsibility for the existing institution and provided additional capacity for their use. 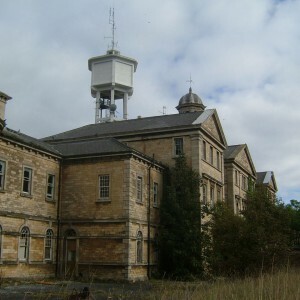 This additional capacity seems to have been all but exhausted by the turn of the century as once again expansion loomed. 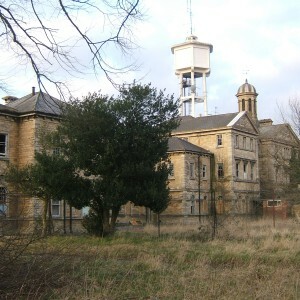 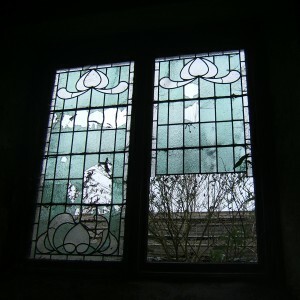 The design for this next stage of development was by Albert Edward Gough, of the partnership of John Giles, Gough and Trollope who were experienced architects in the building asylums and workhouses, some of their previous works including the Staffordshire Asylum at Cheddleton, the Central London Sick Asylum at Colindale and the Chelsea Poor Law infirmary. 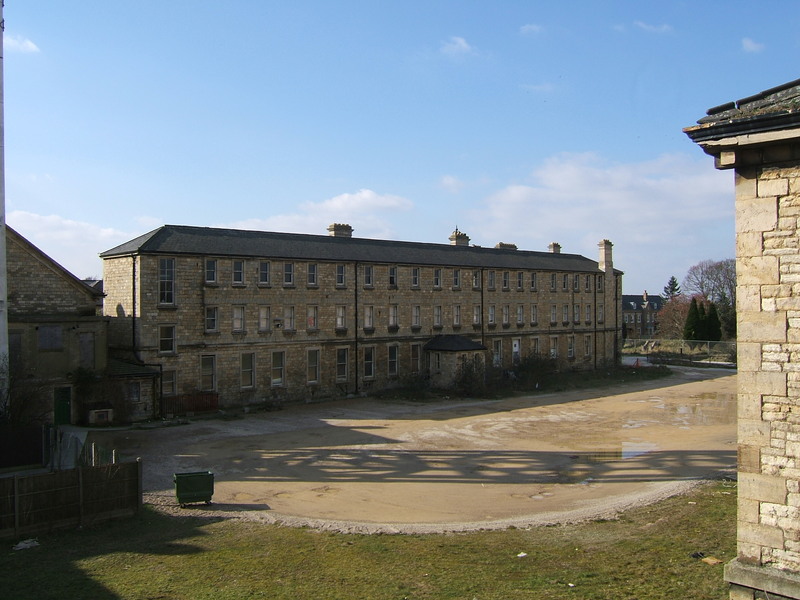 Gough’s involvement led to a new detached superintendents residence being constructed to the northwest of the site, new ward blocks at the very north of the outermost blocks and most significantly demolition and reconstruction of much of the central services area. 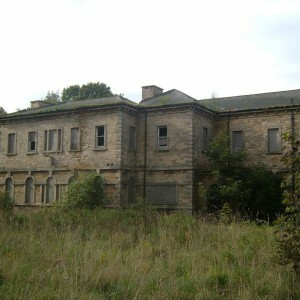 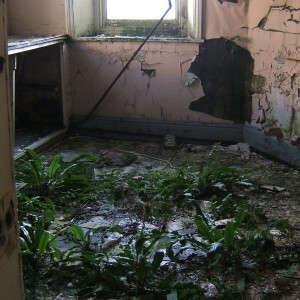 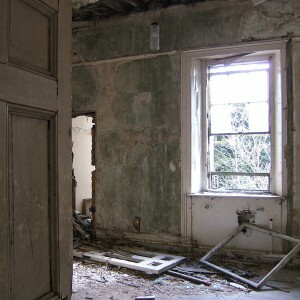 The original superintendent’s residence was retained but subdivided for use as offices and medical officers residences. 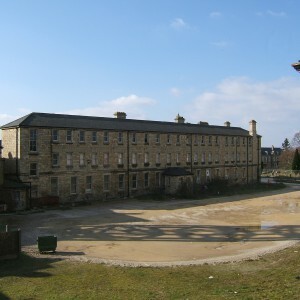 The new complex comprised of a three storey administration block with stewards stores, kitchens and scullery, servery area and finally a recreation hall with stage. 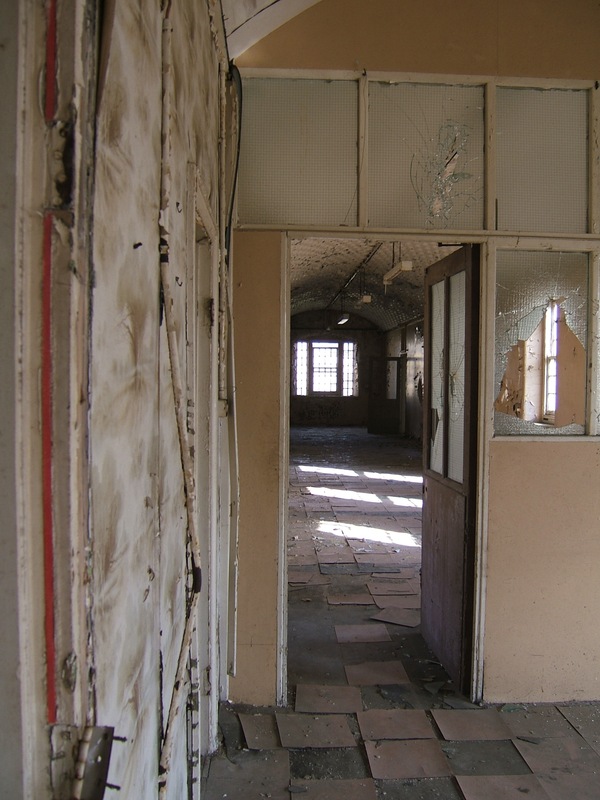 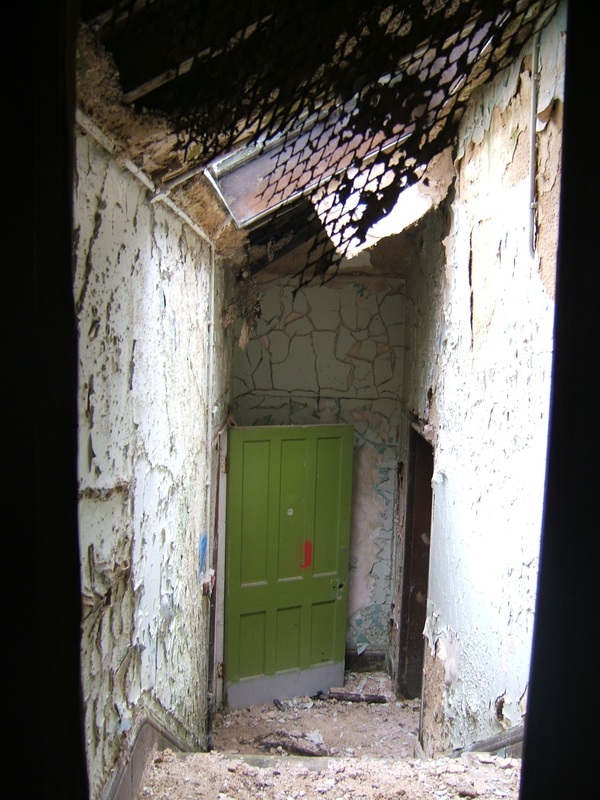 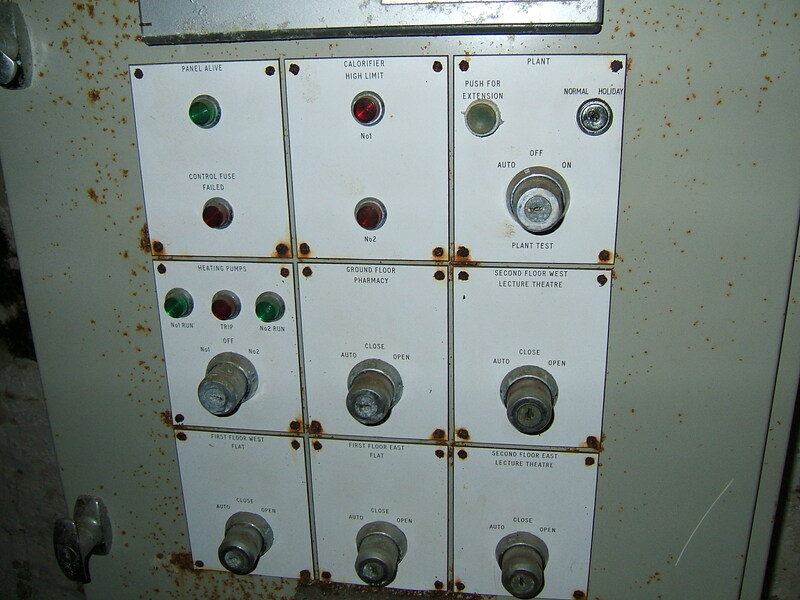 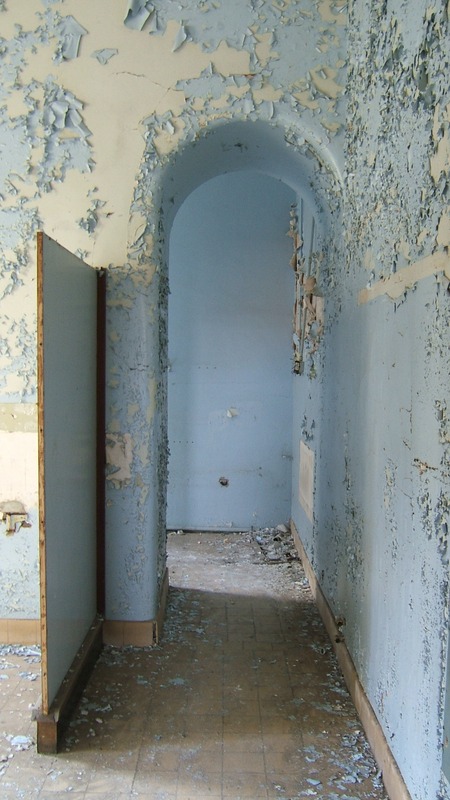 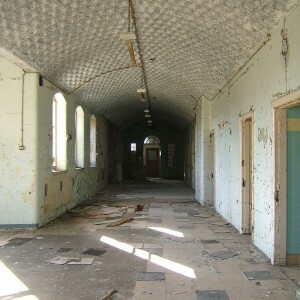 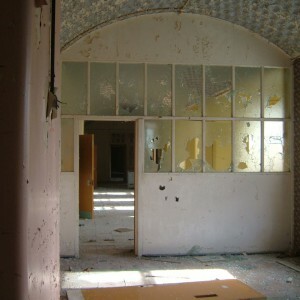 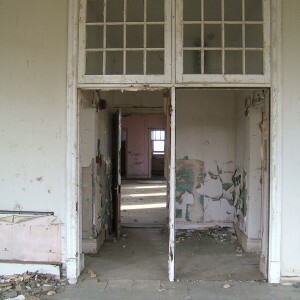 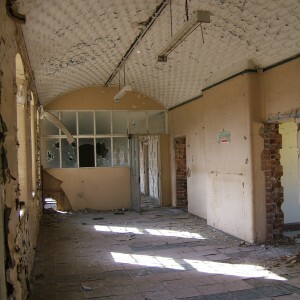 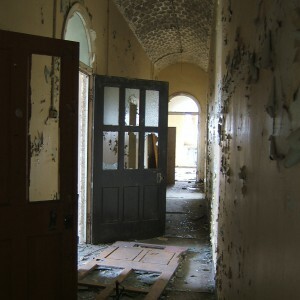 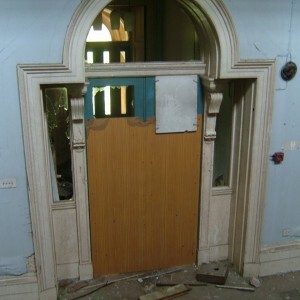 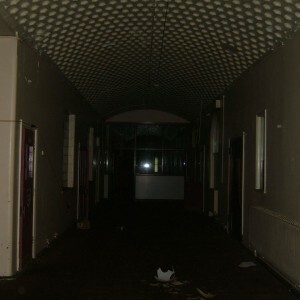 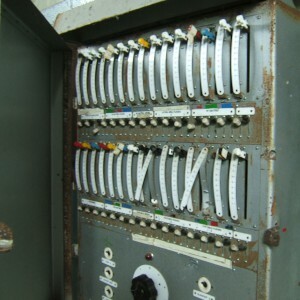 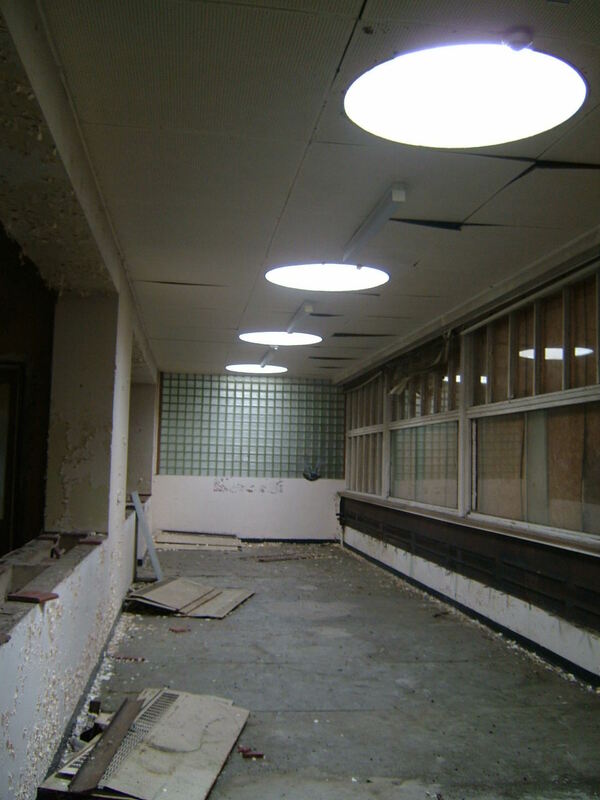 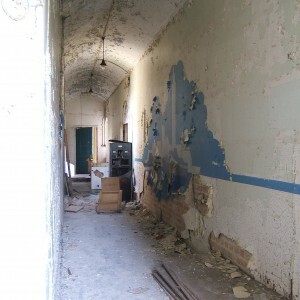 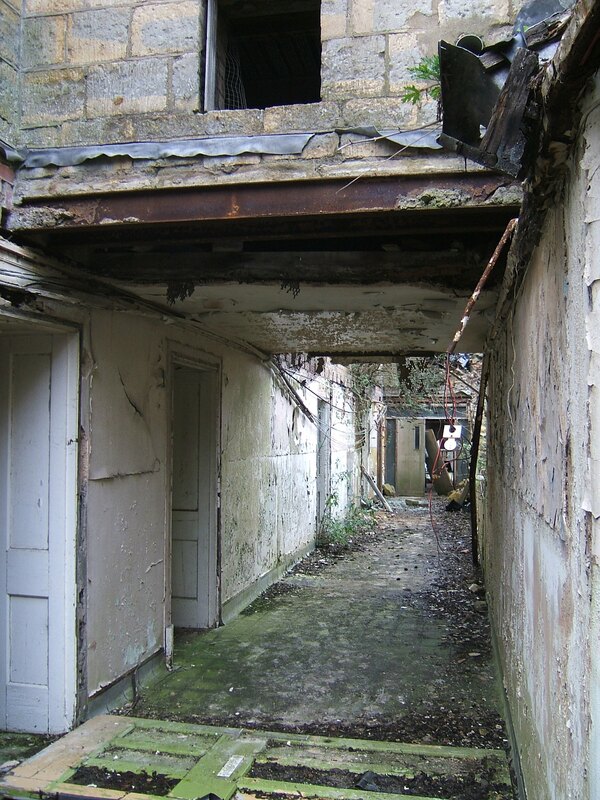 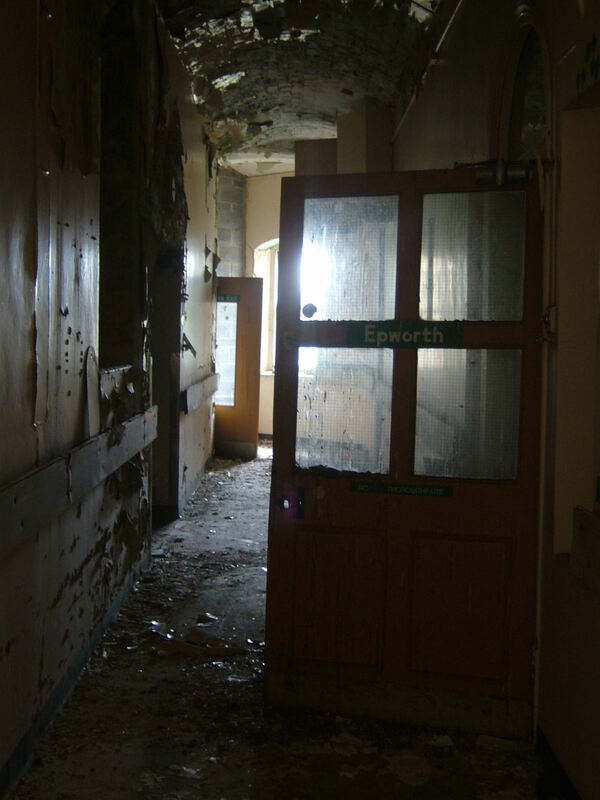 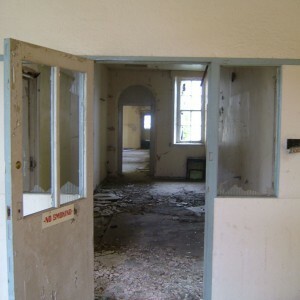 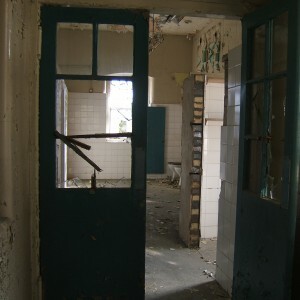 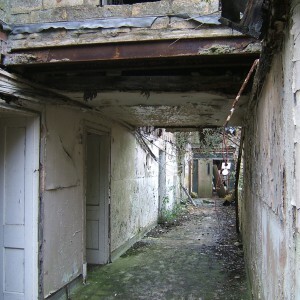 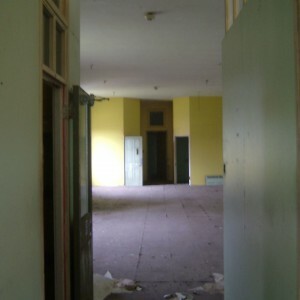 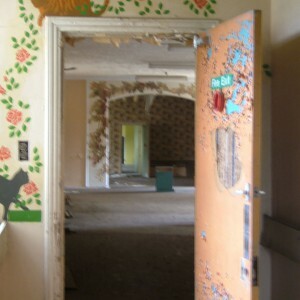 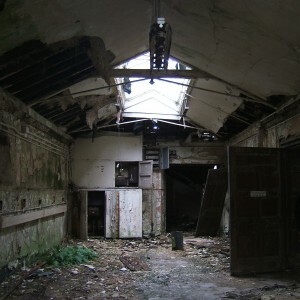 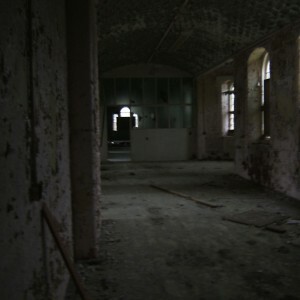 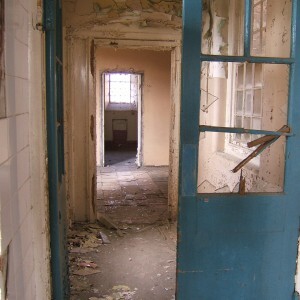 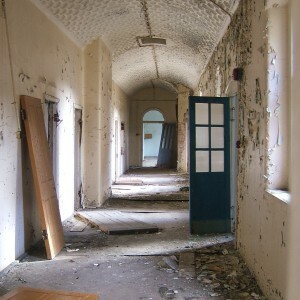 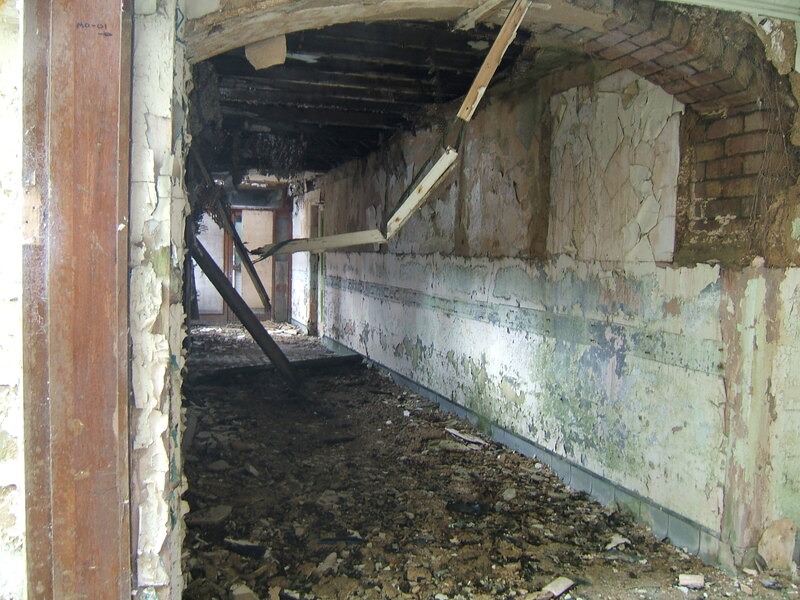 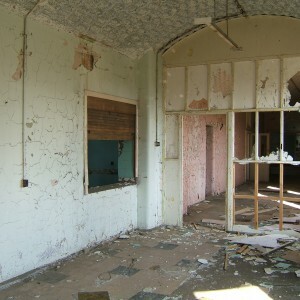 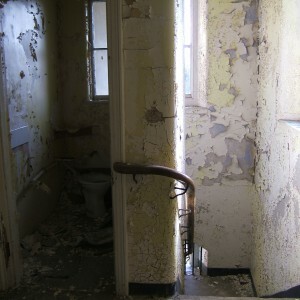 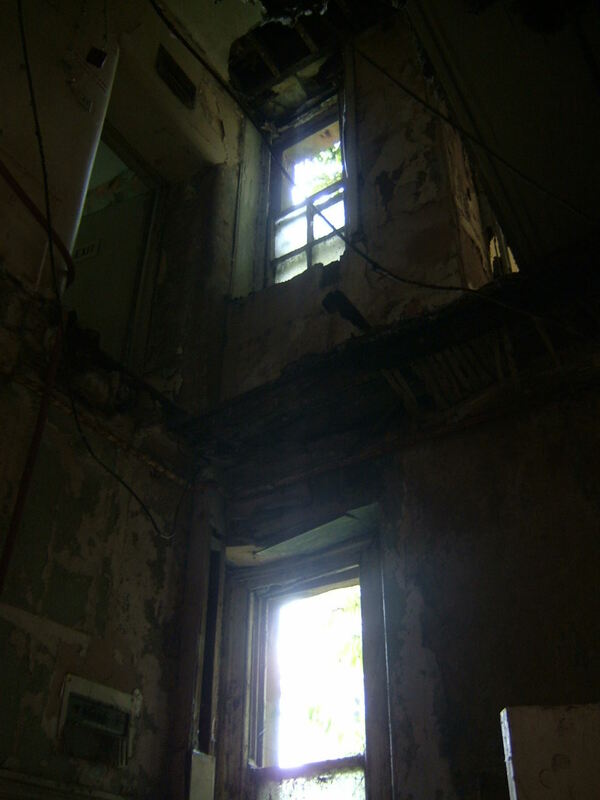 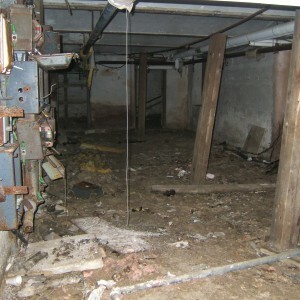 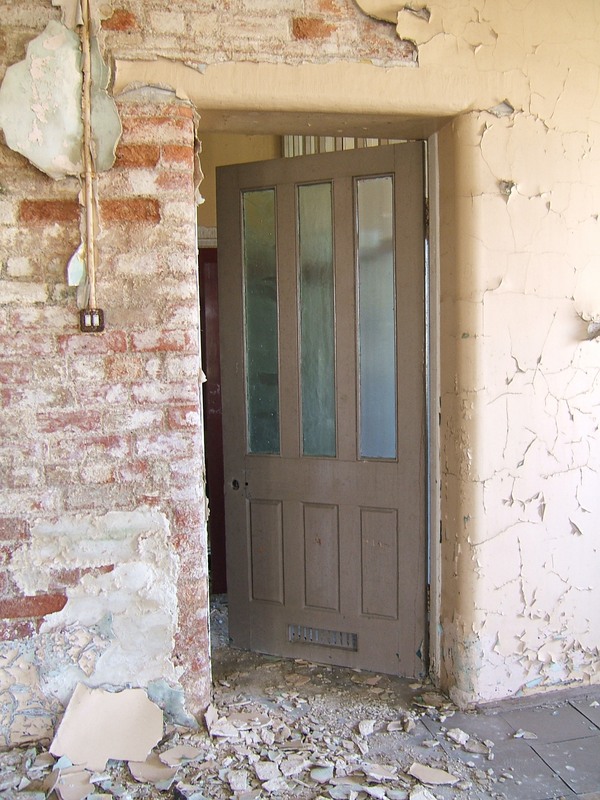 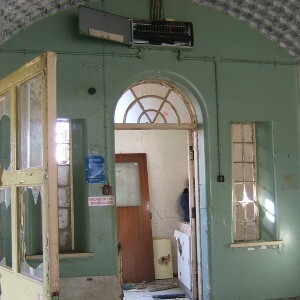 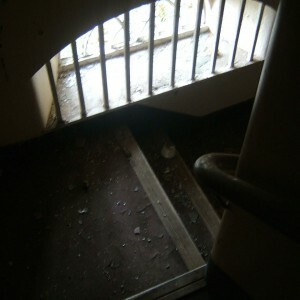 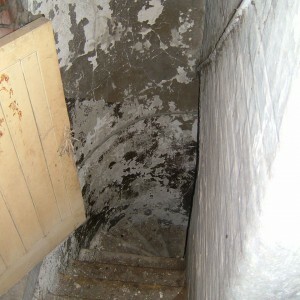 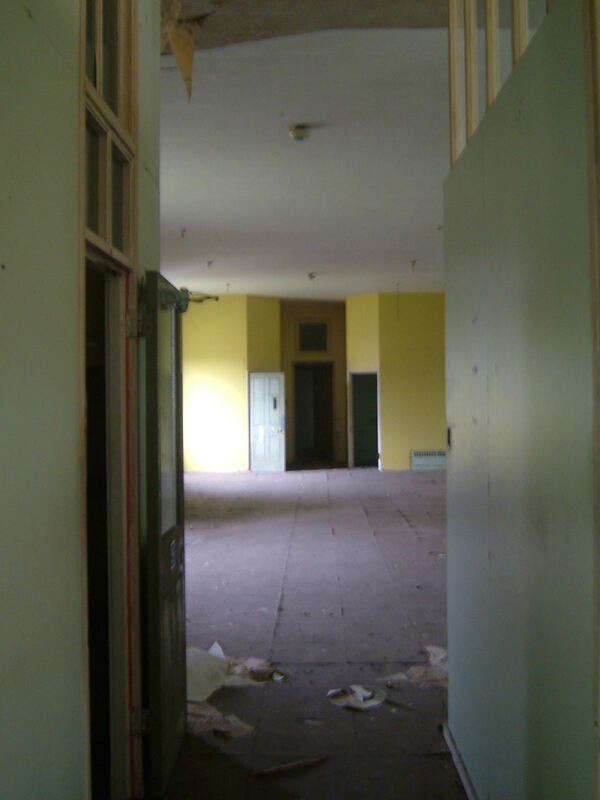 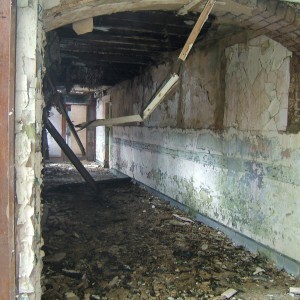 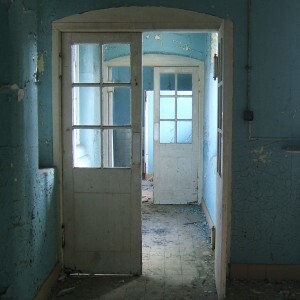 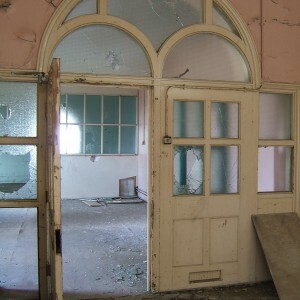 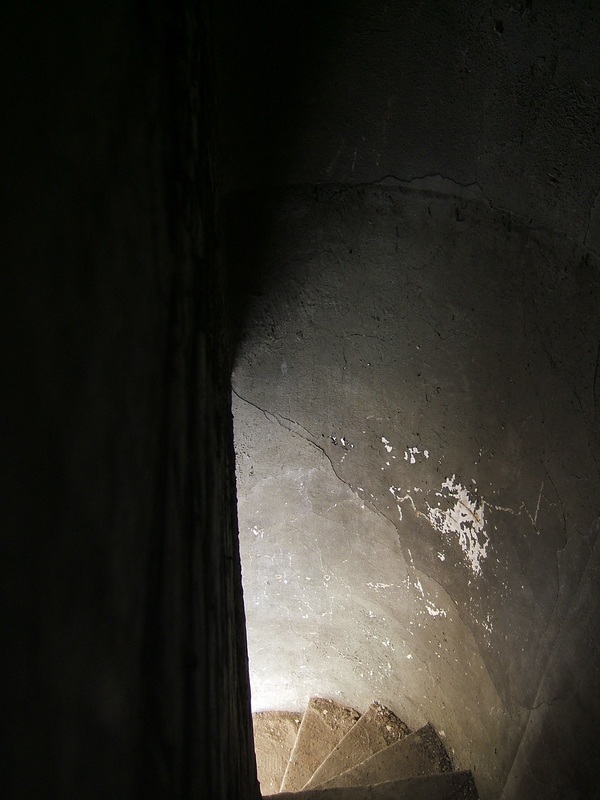 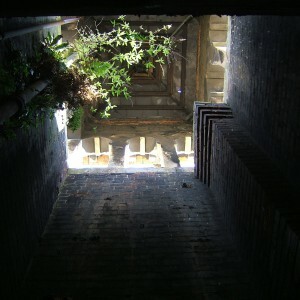 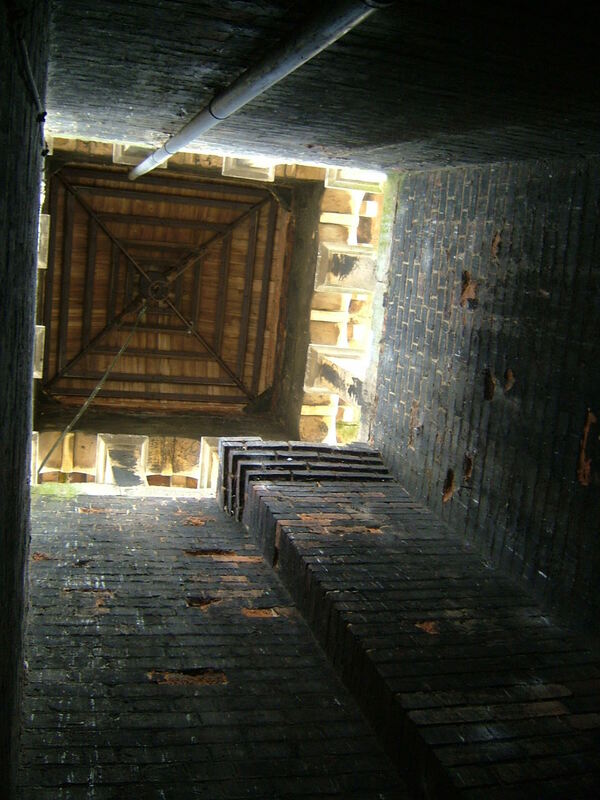 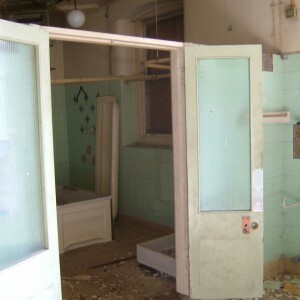 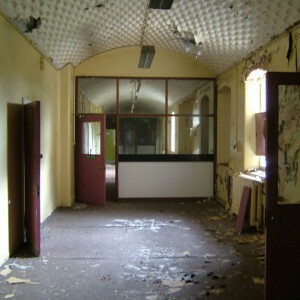 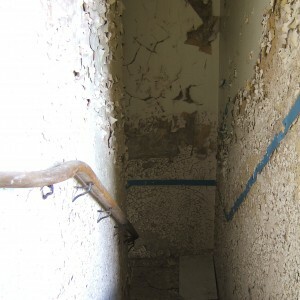 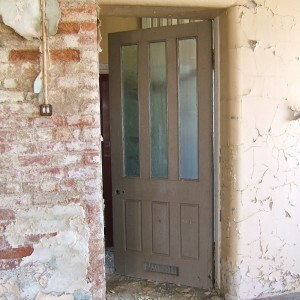 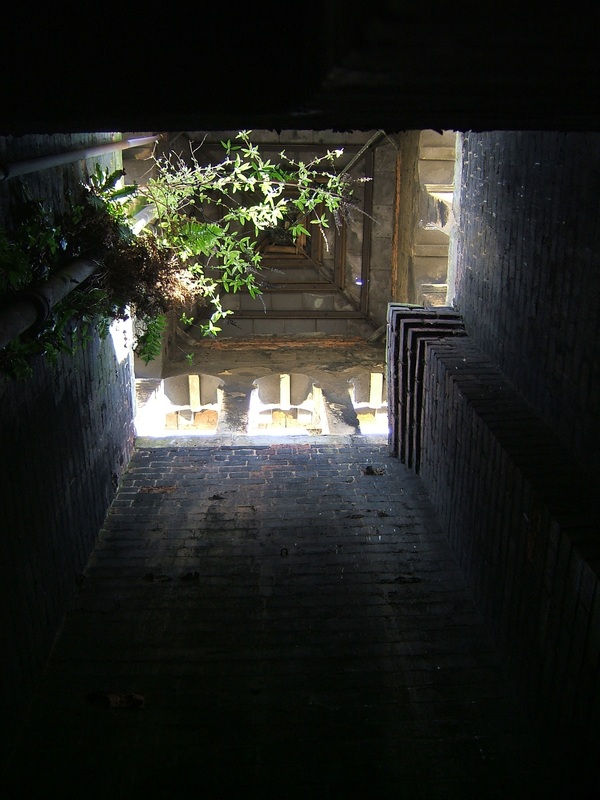 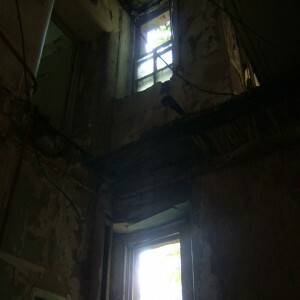 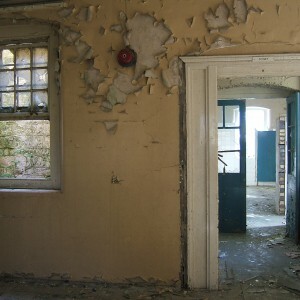 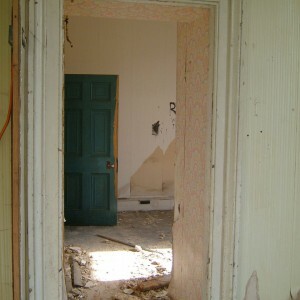 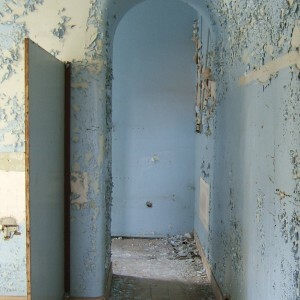 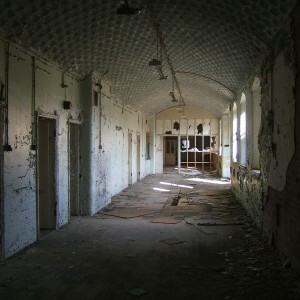 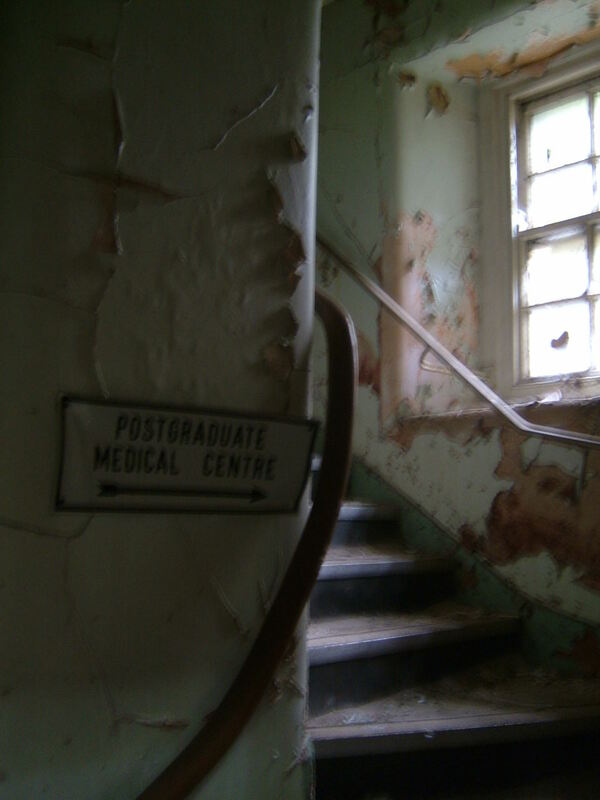 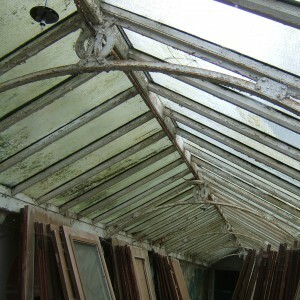 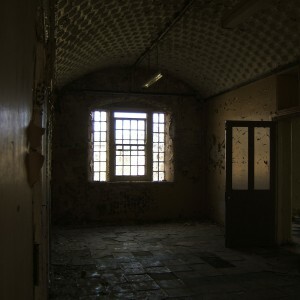 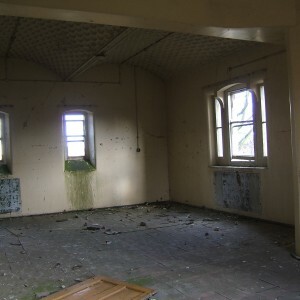 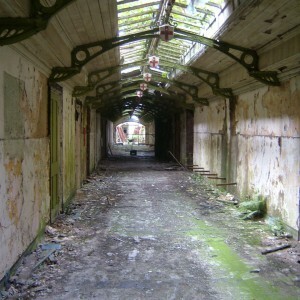 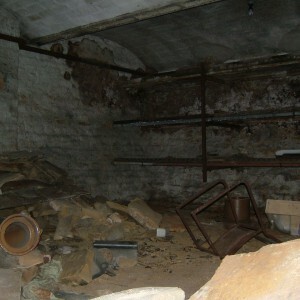 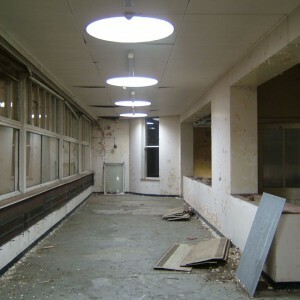 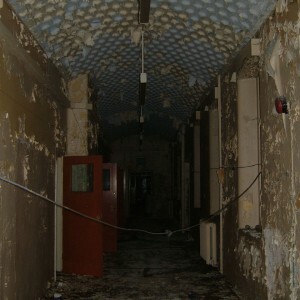 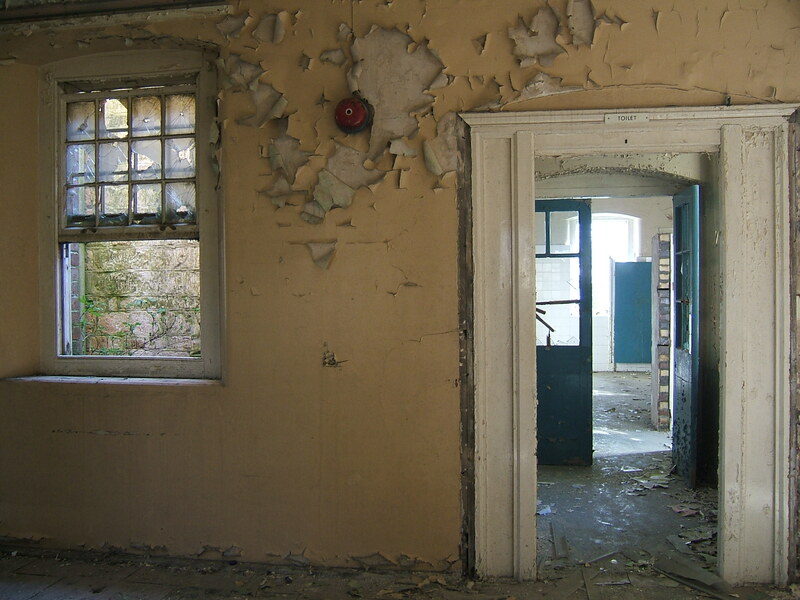 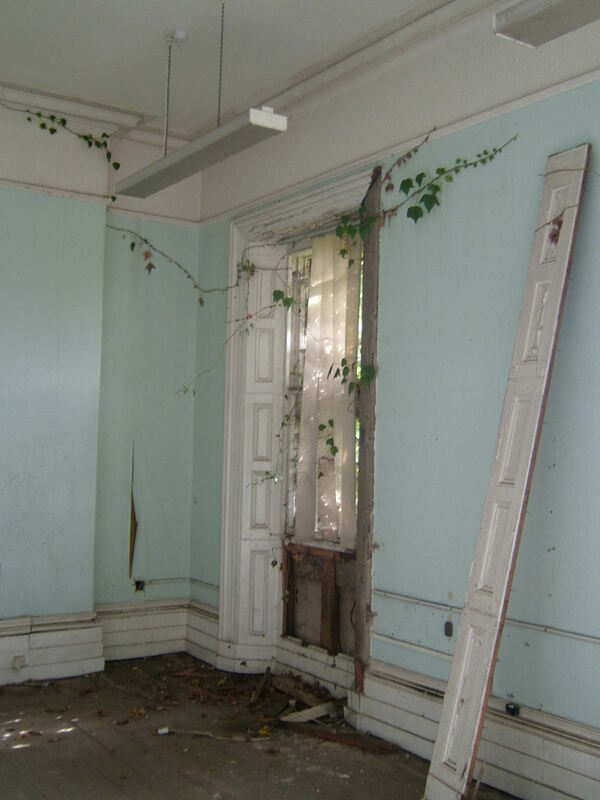 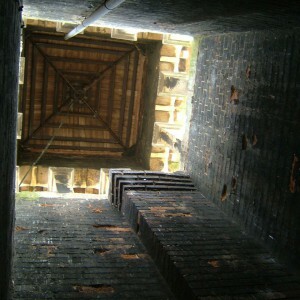 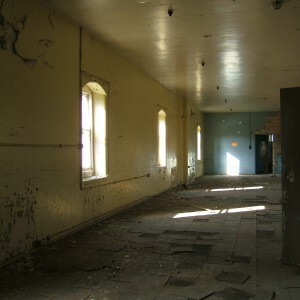 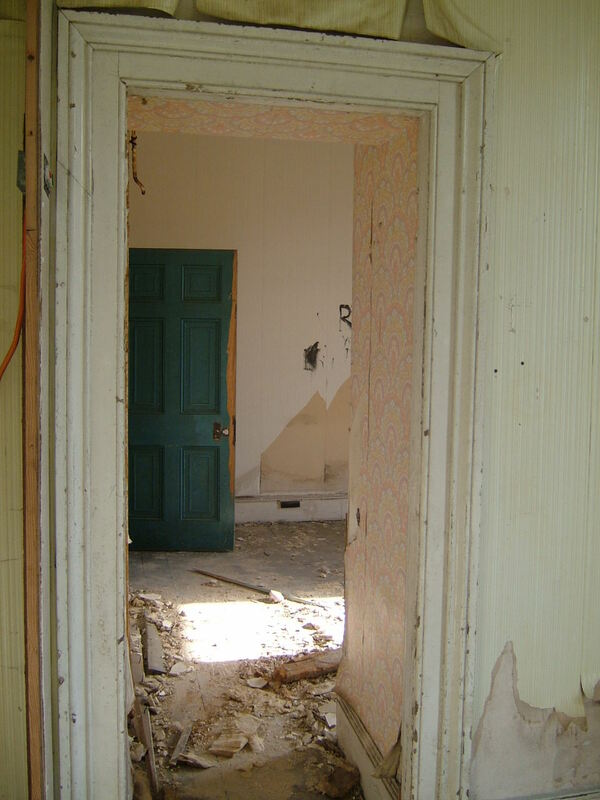 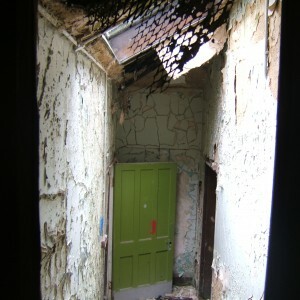 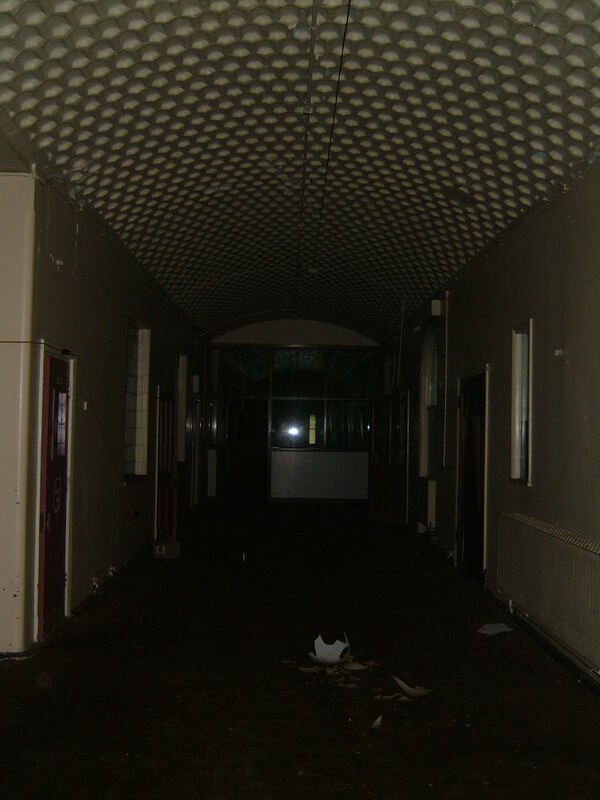 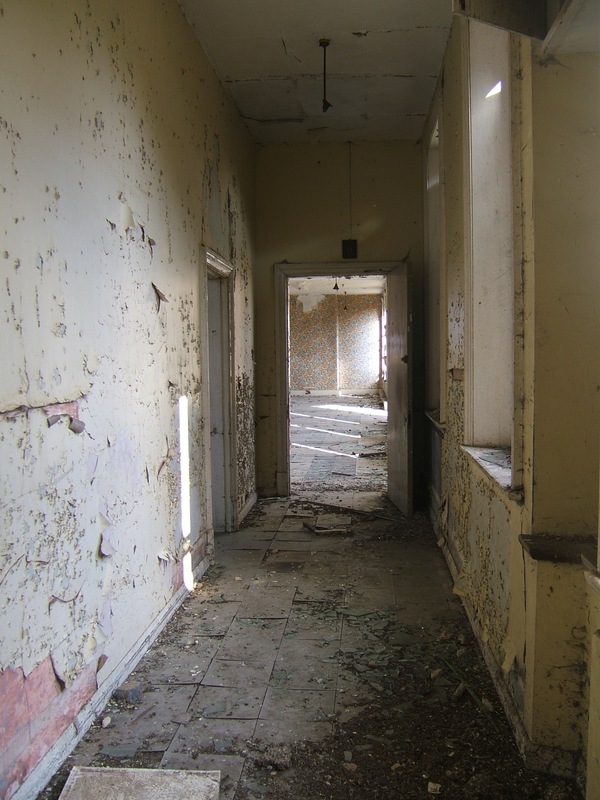 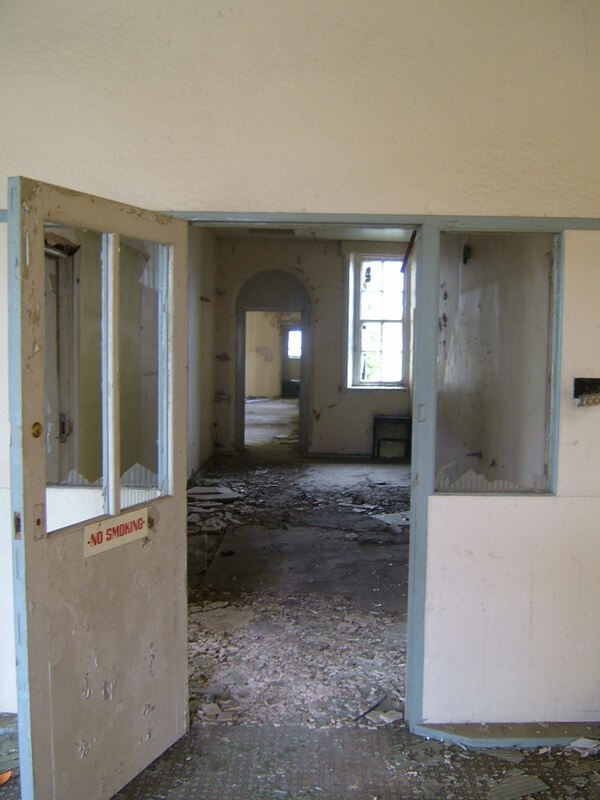 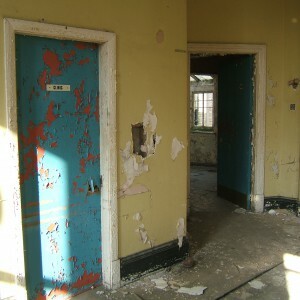 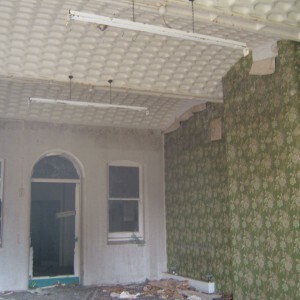 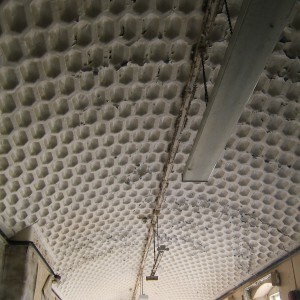 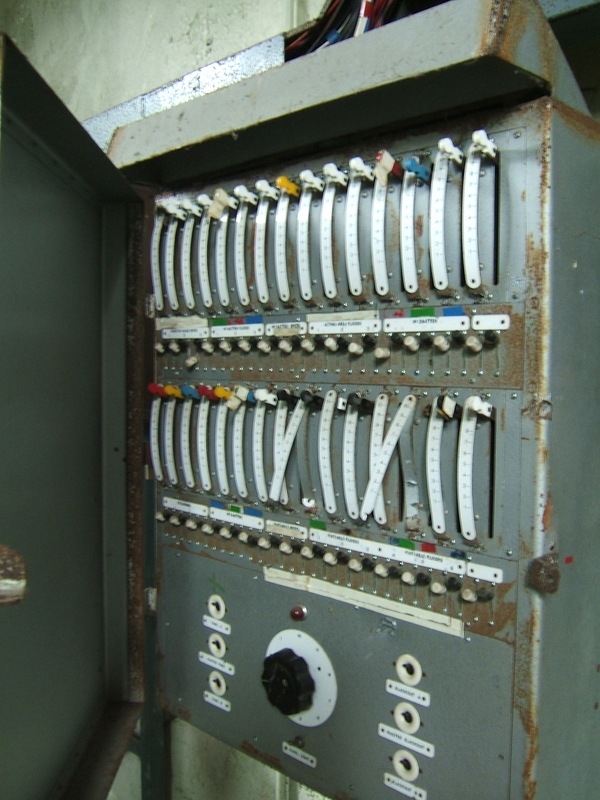 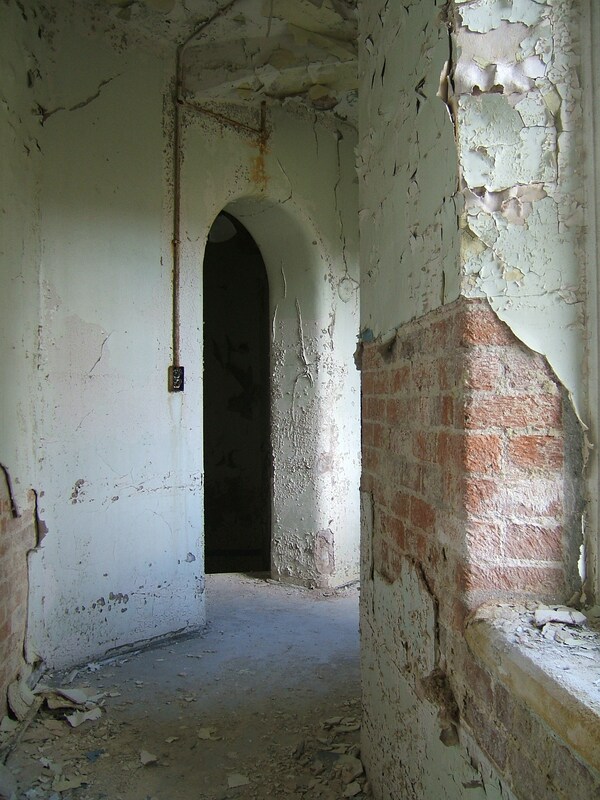 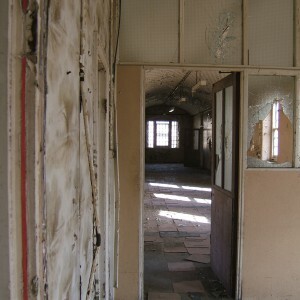 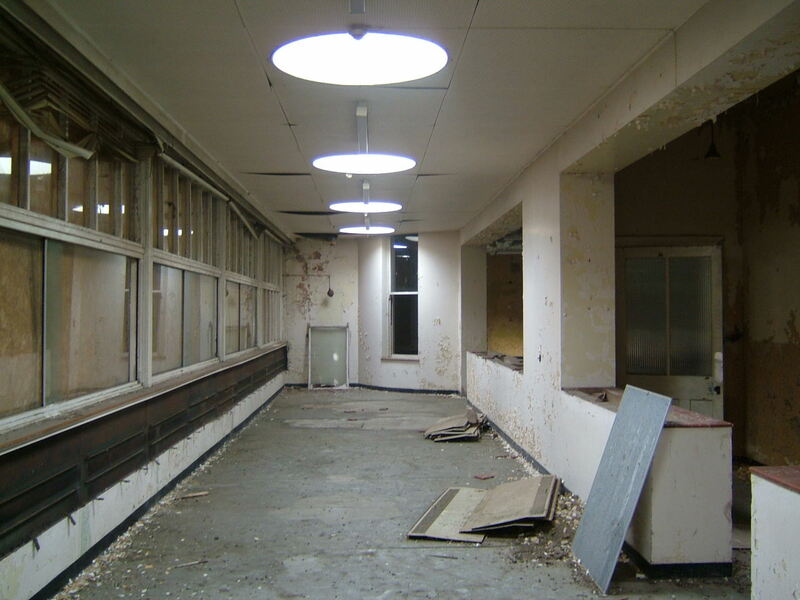 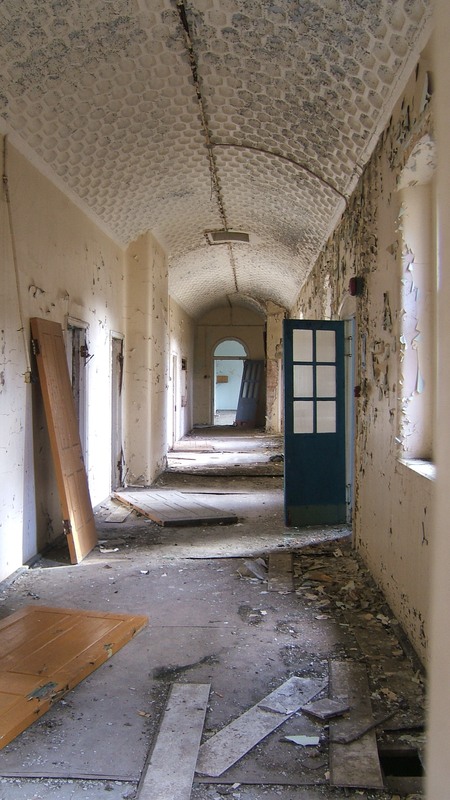 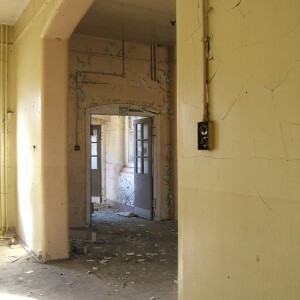 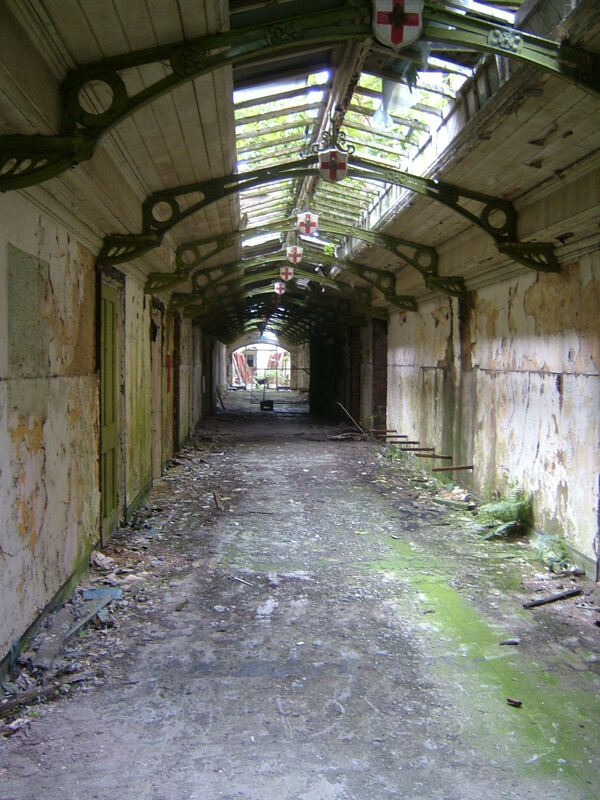 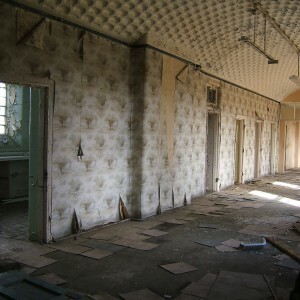 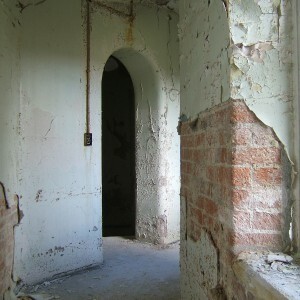 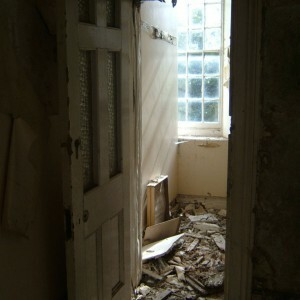 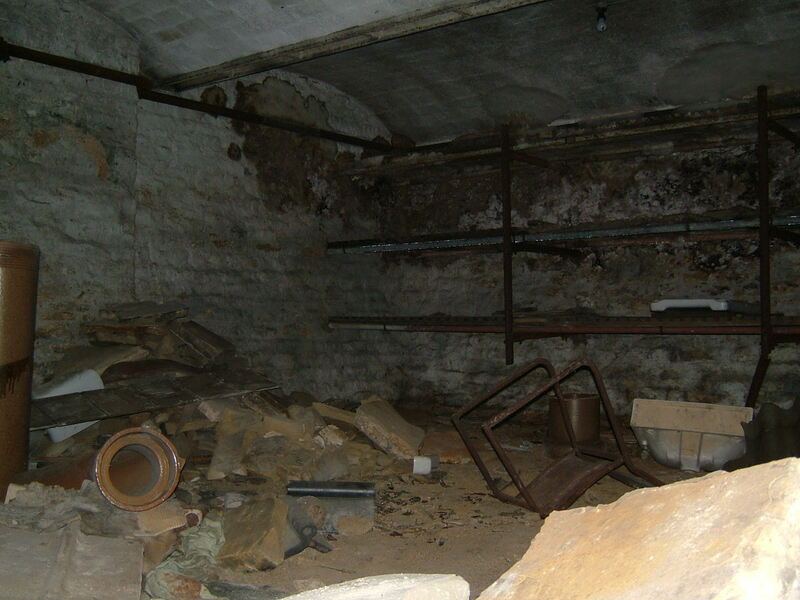 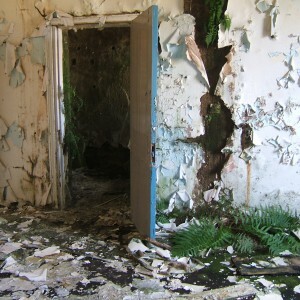 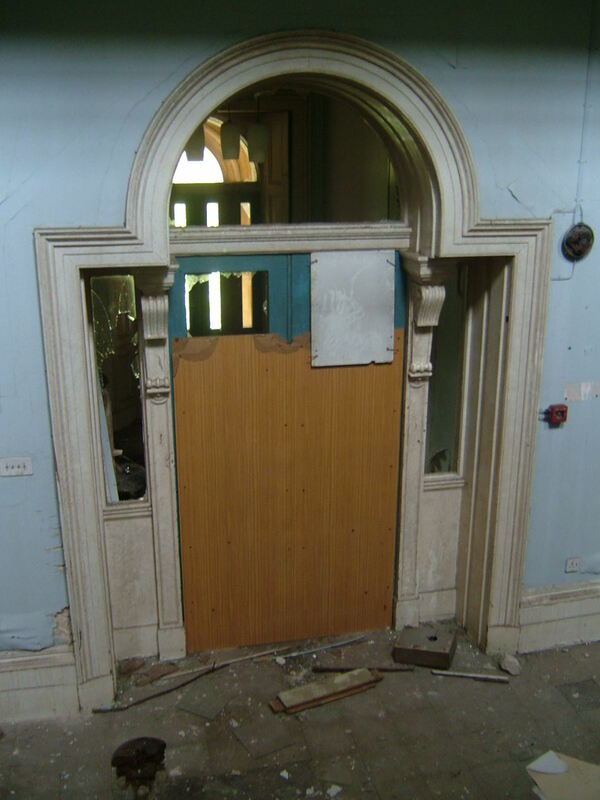 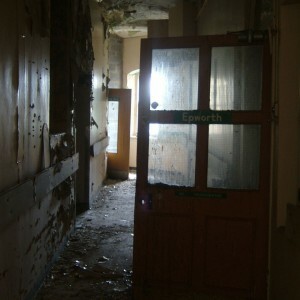 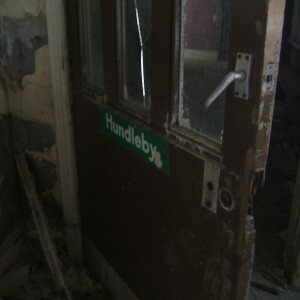 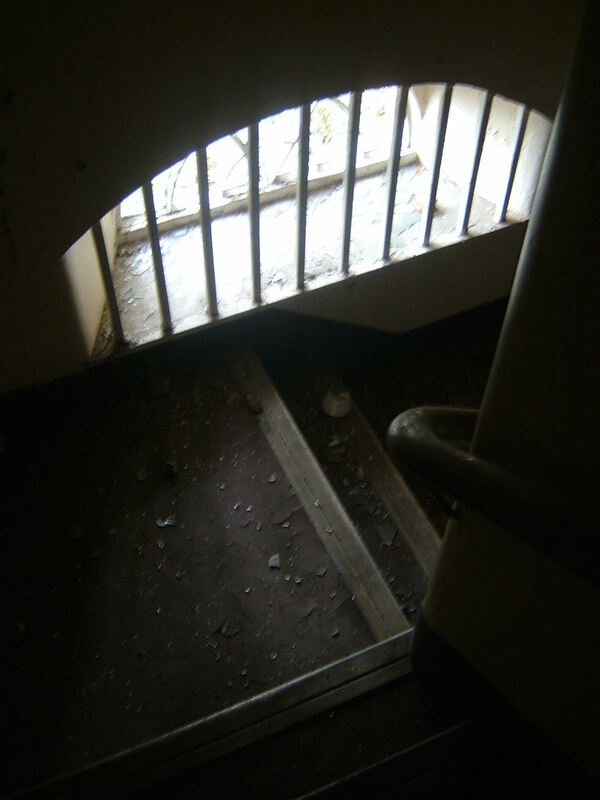 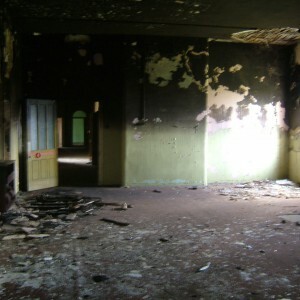 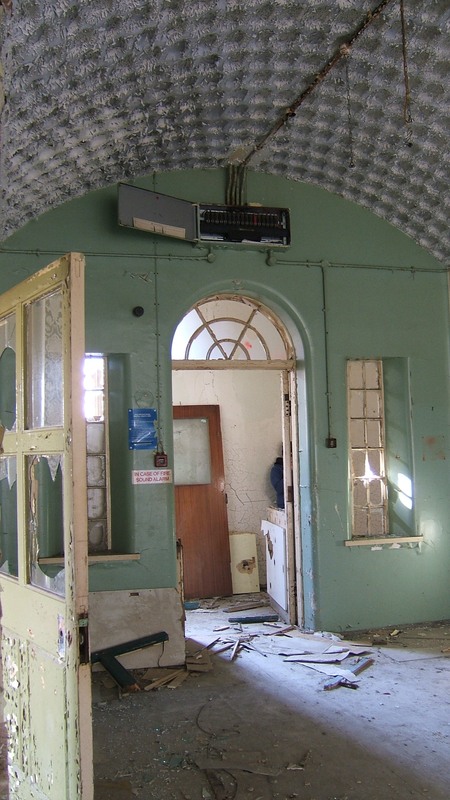 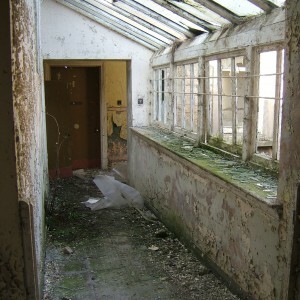 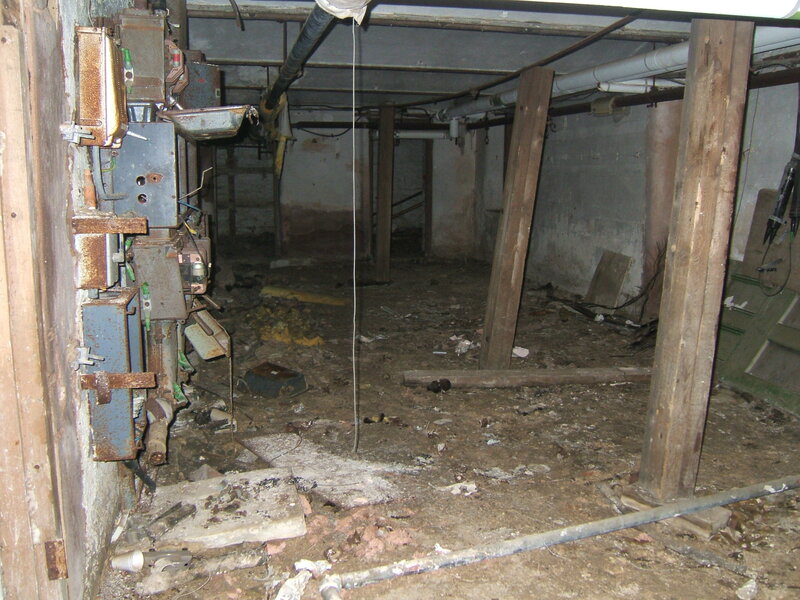 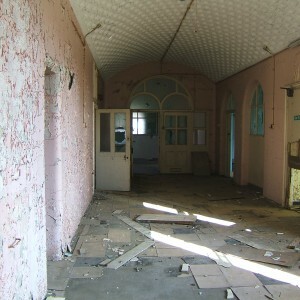 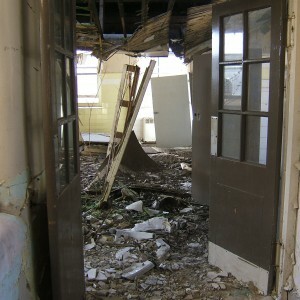 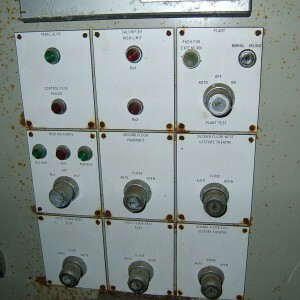 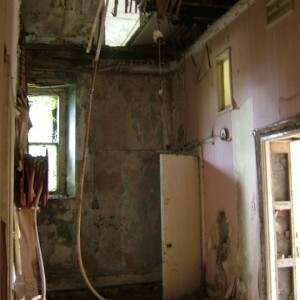 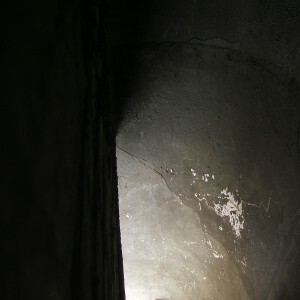 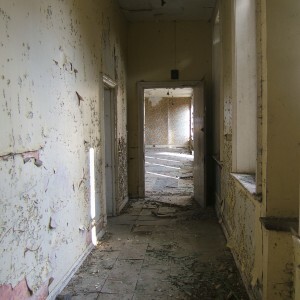 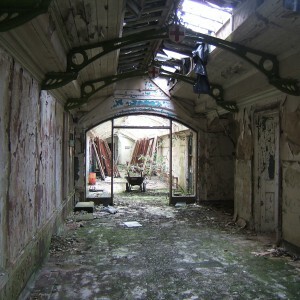 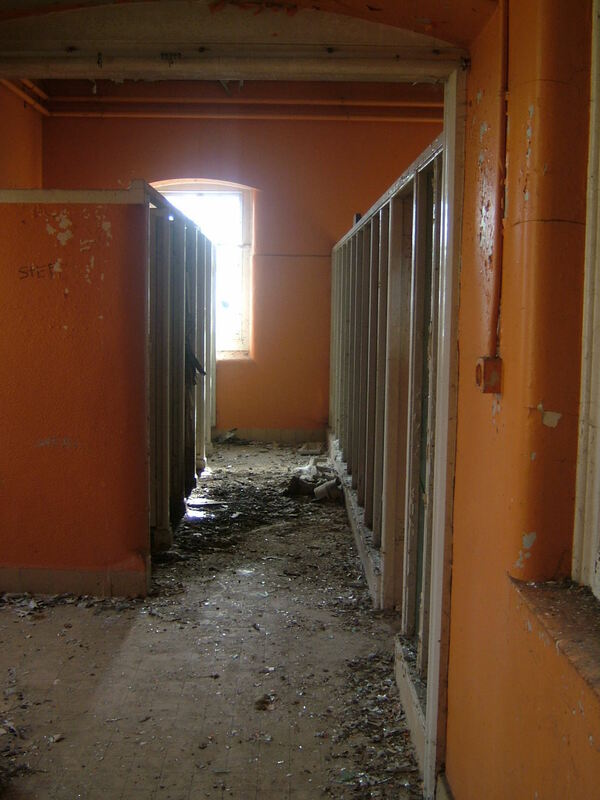 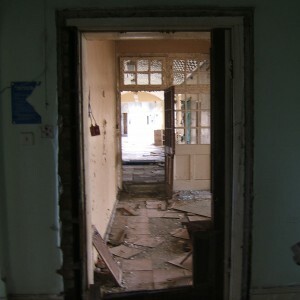 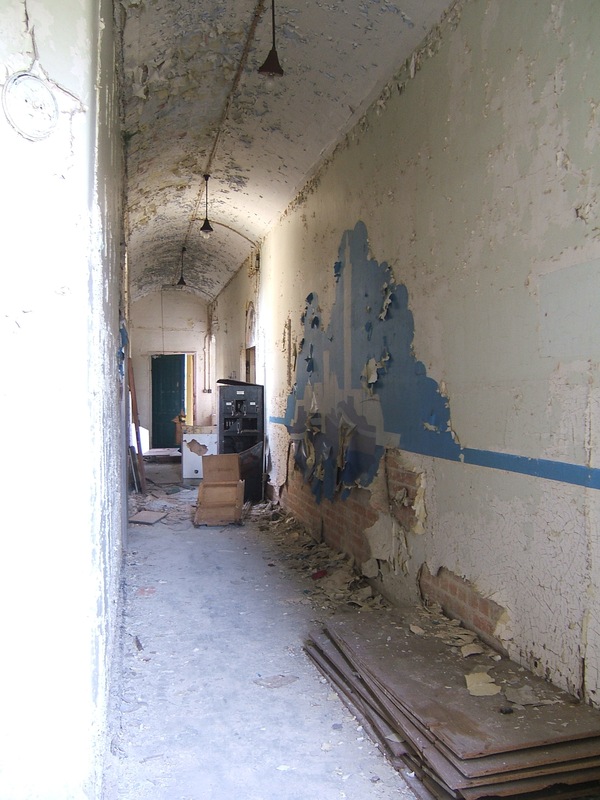 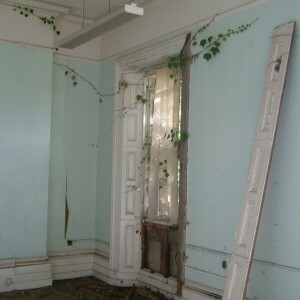 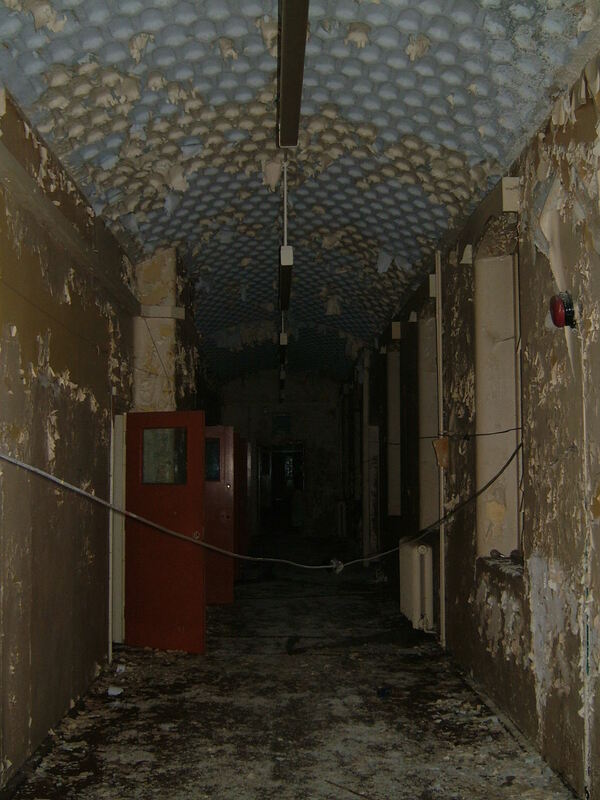 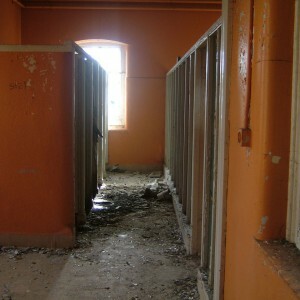 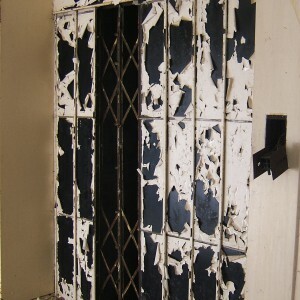 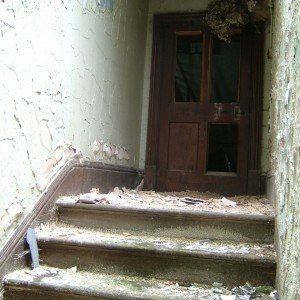 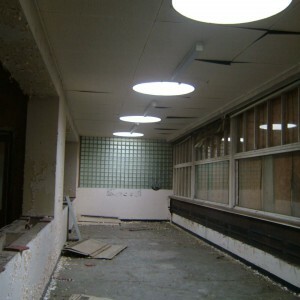 A communicating corridor was inserted between this and the original building avoiding the need to pass through the wards. 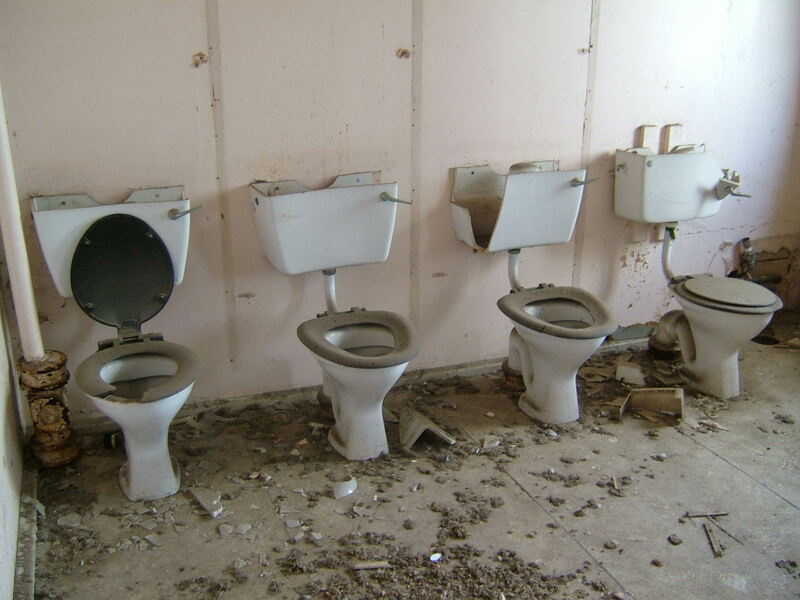 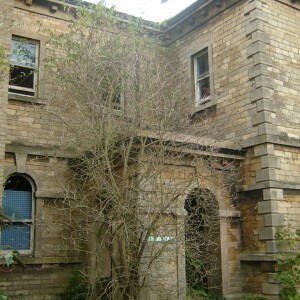 Either side of this new complex were sited accommodation for male and female attendants. 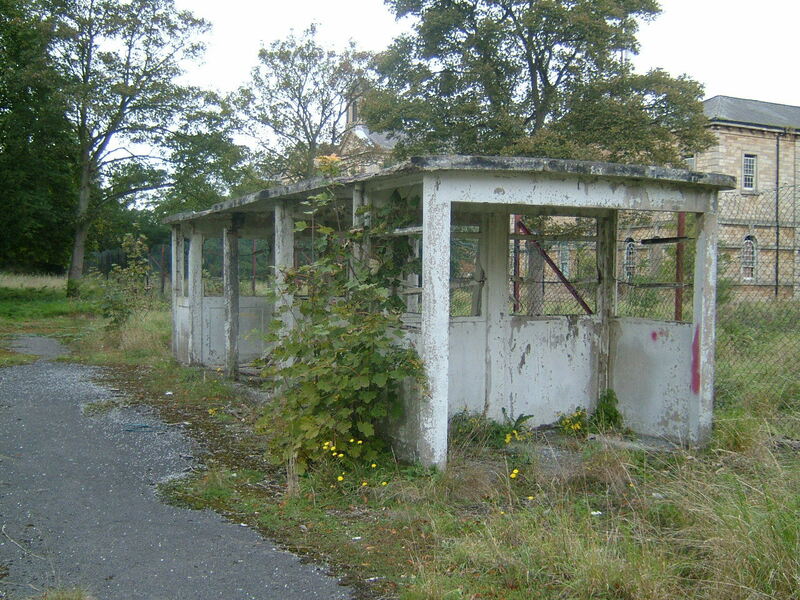 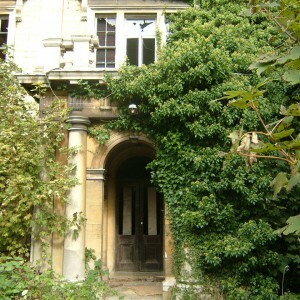 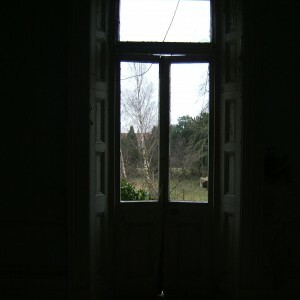 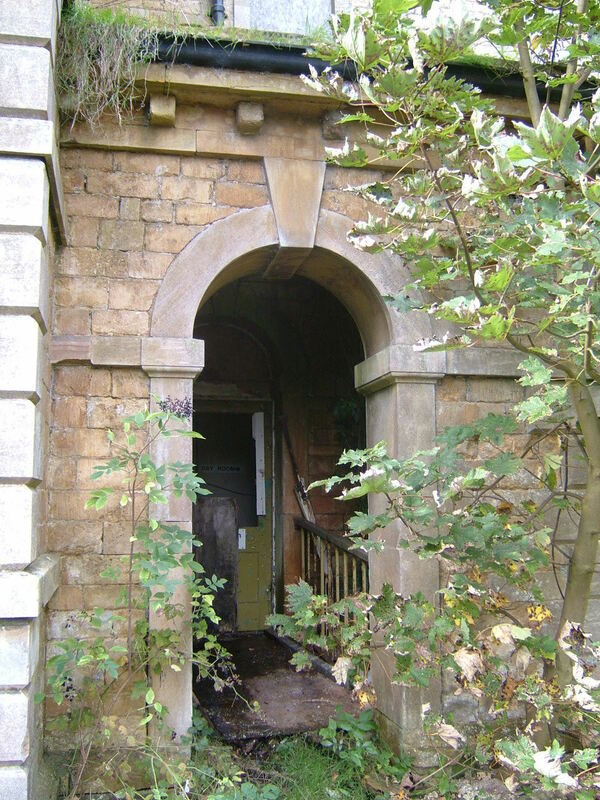 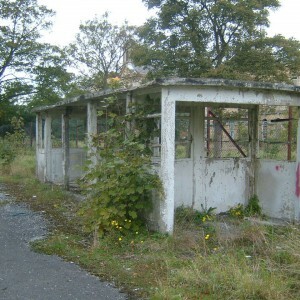 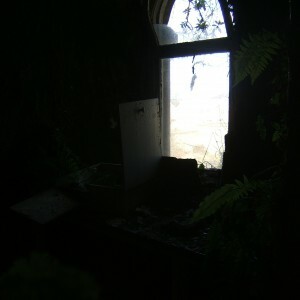 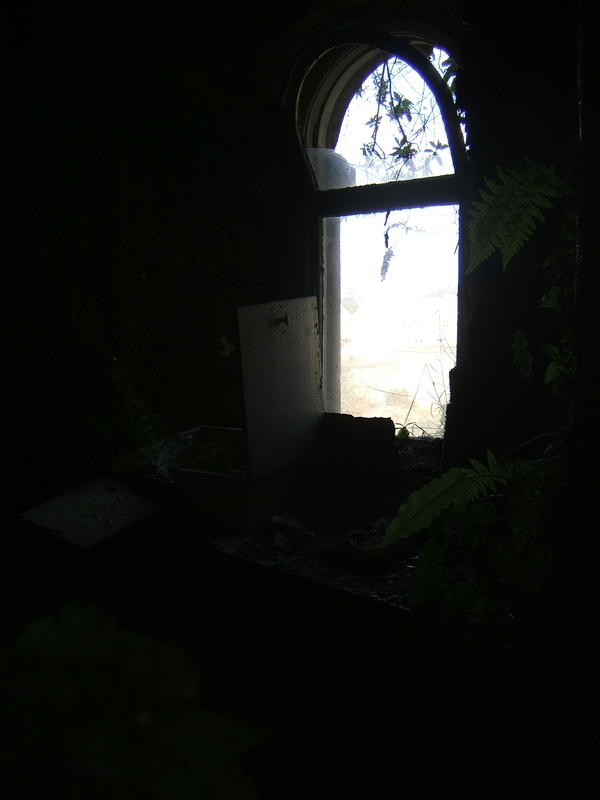 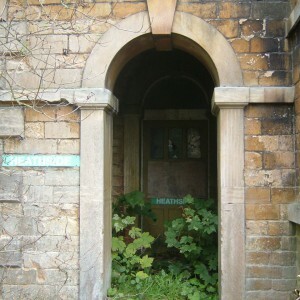 Further senior staff were accomodated to the east of the drive between the lodge and chapel. 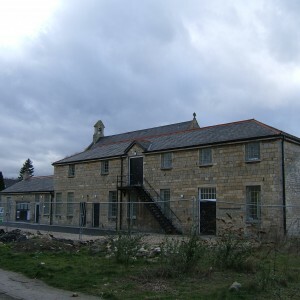 A new workshop complex was created south of the chapel. 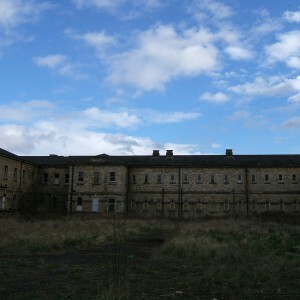 Further additions to the south ends of the outer-most blocks was interrupted by World War I and only that on the female side was completed by 1915, the equivalent site on the male side remaining undeveloped. 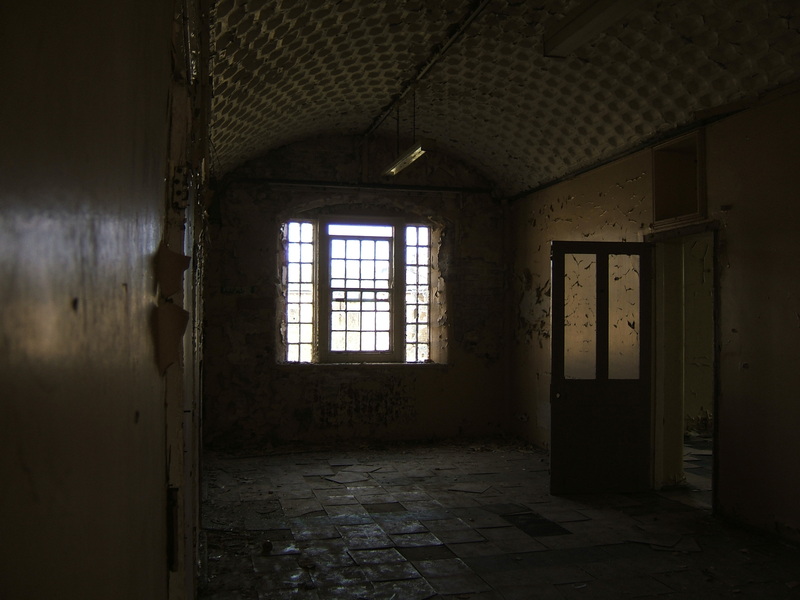 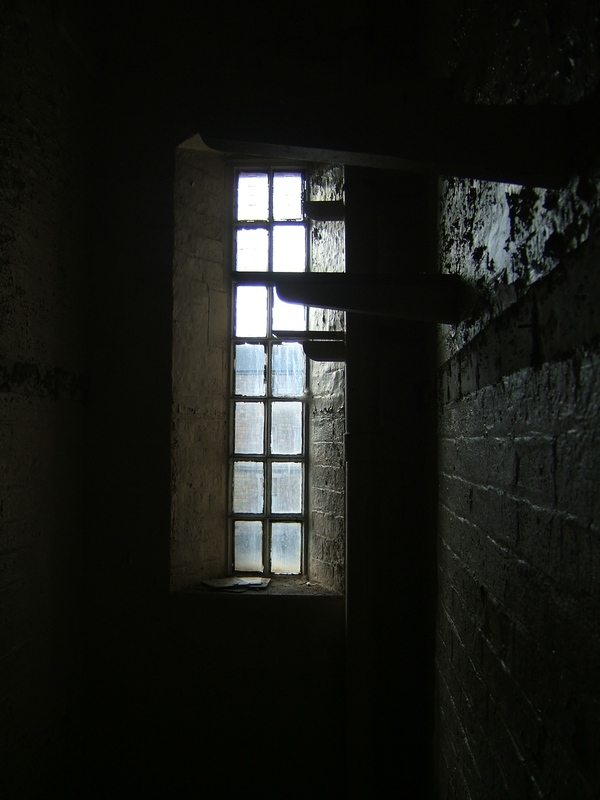 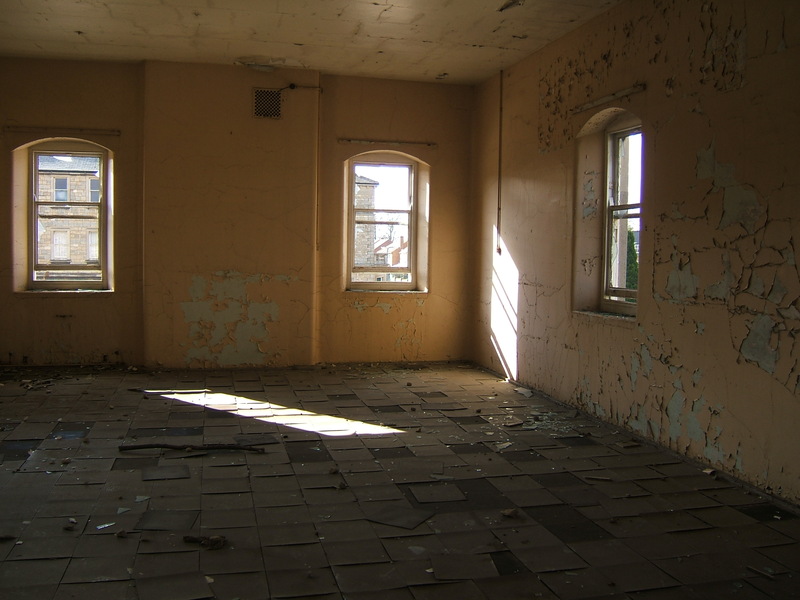 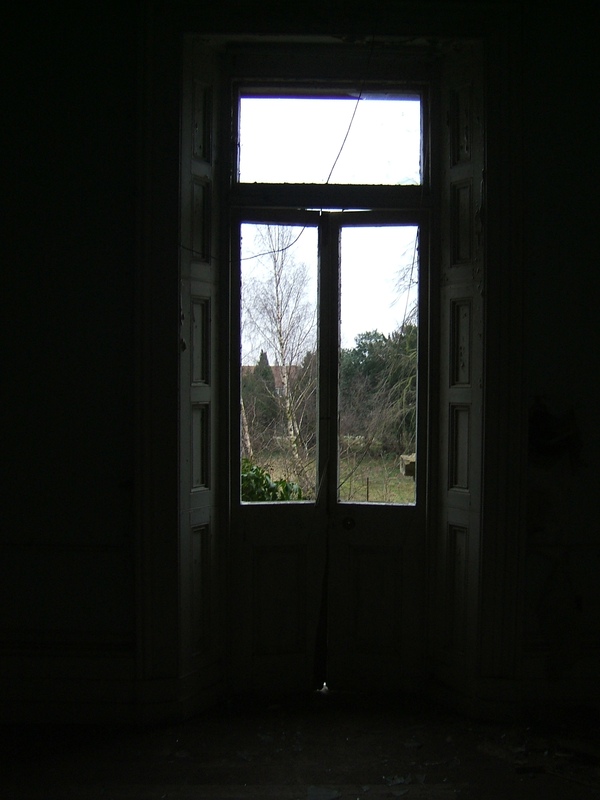 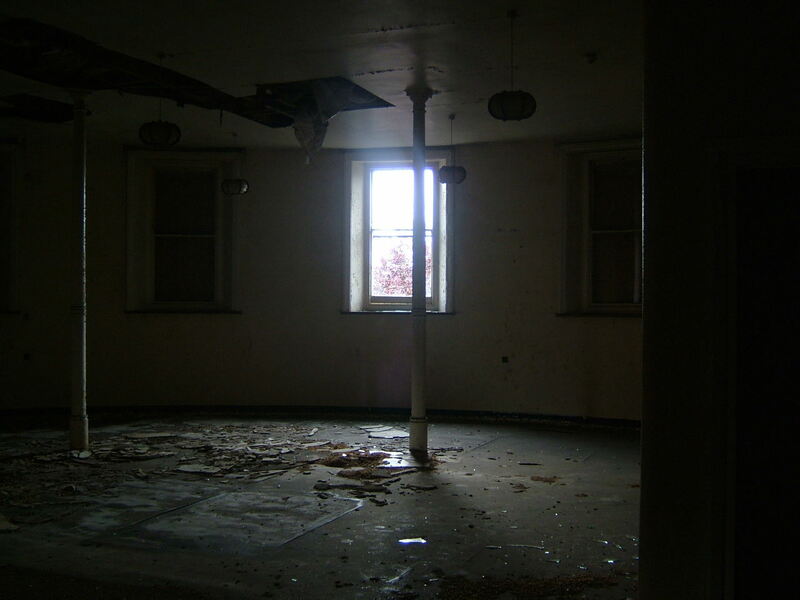 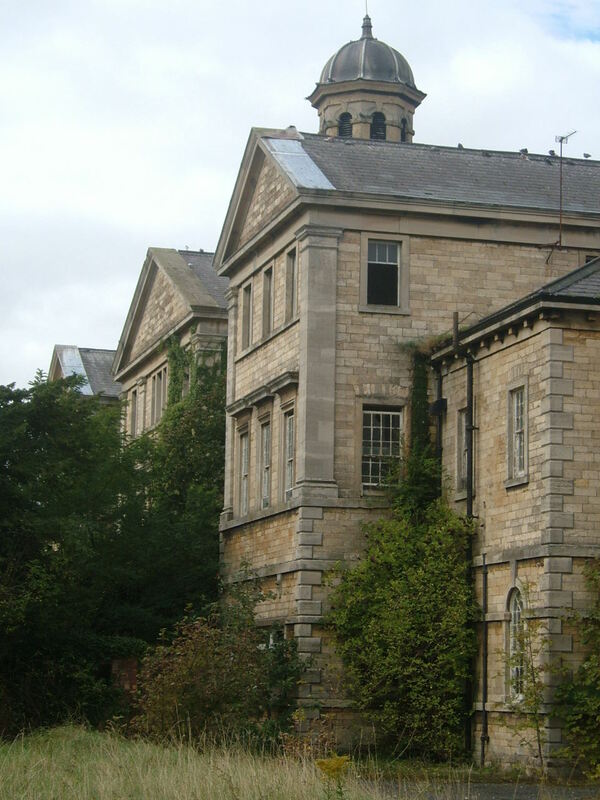 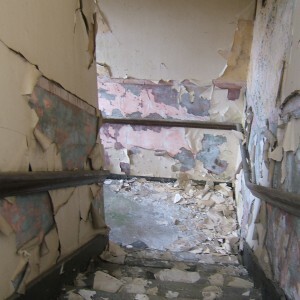 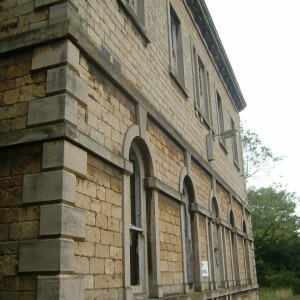 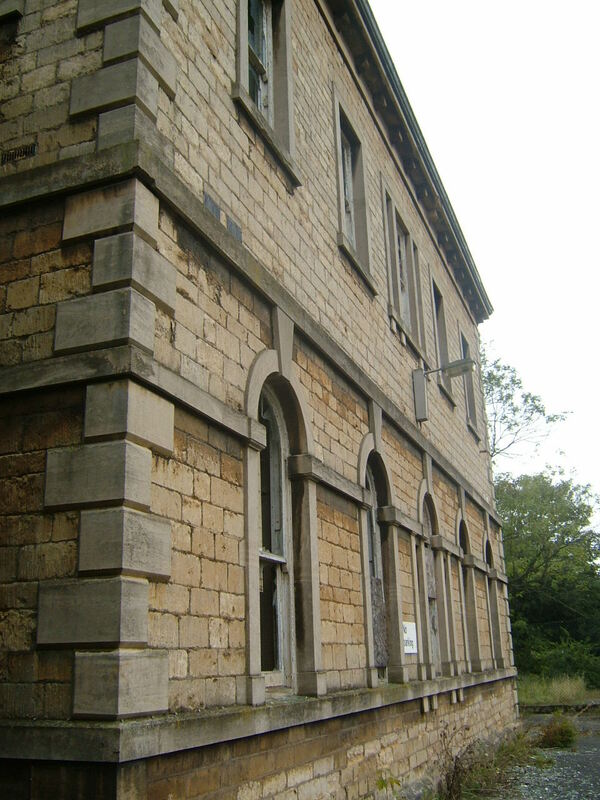 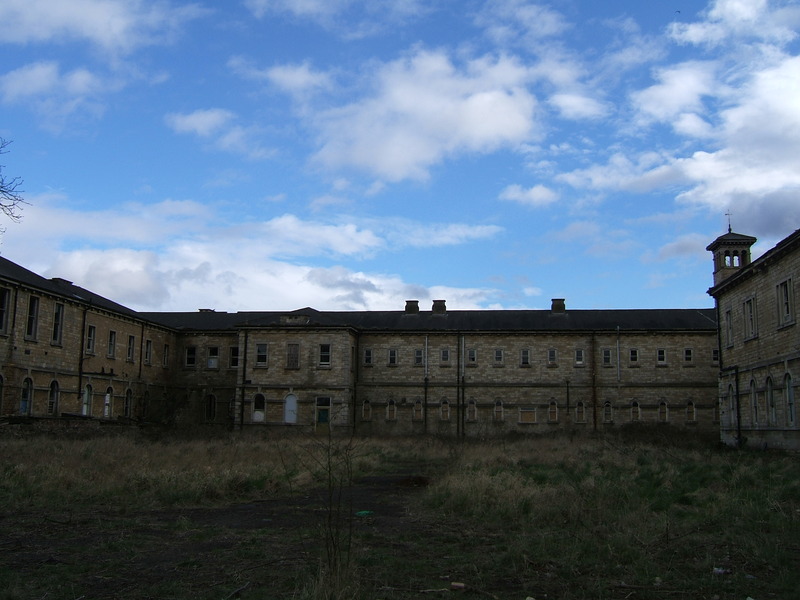 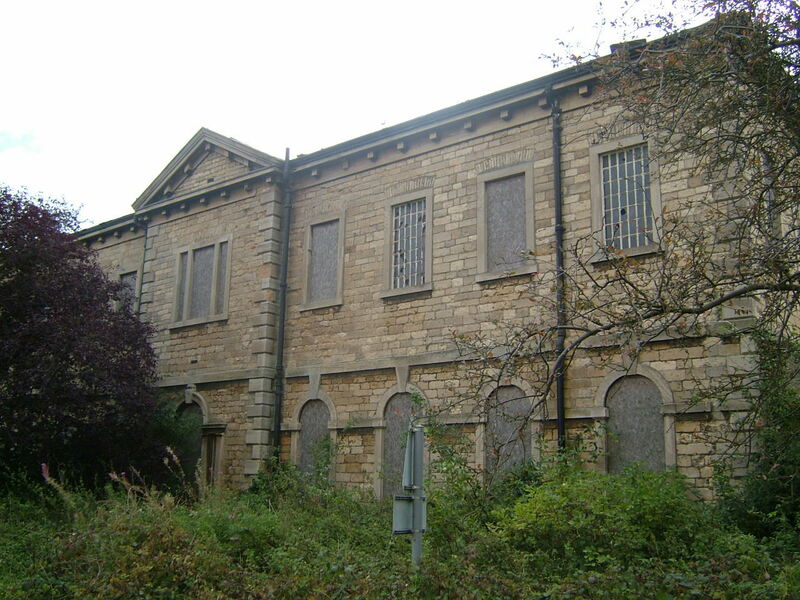 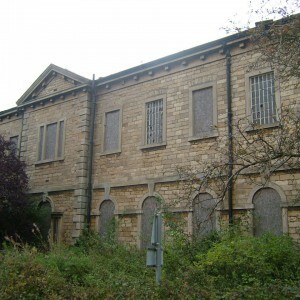 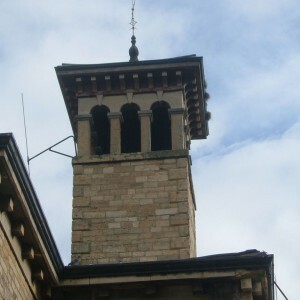 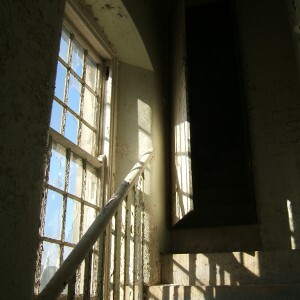 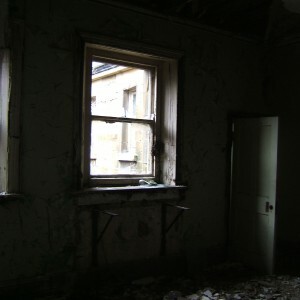 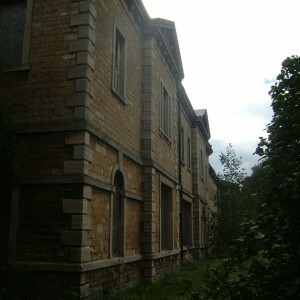 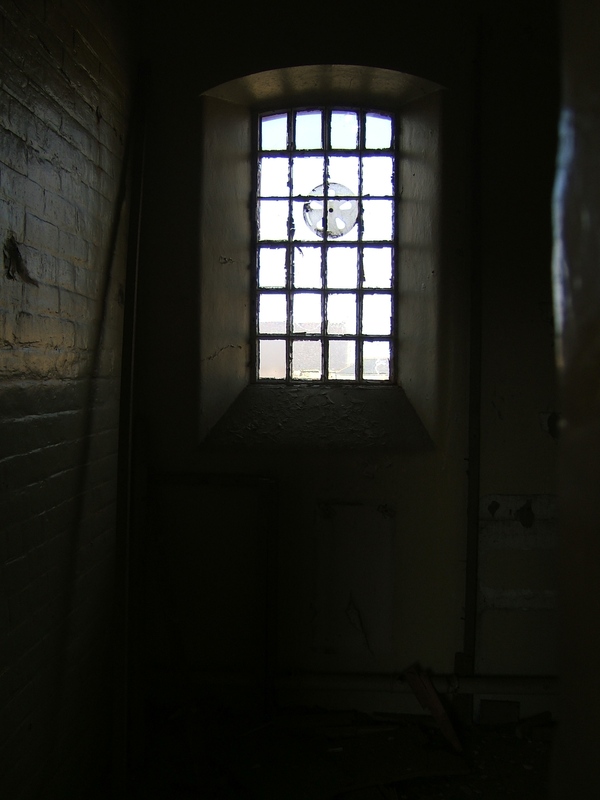 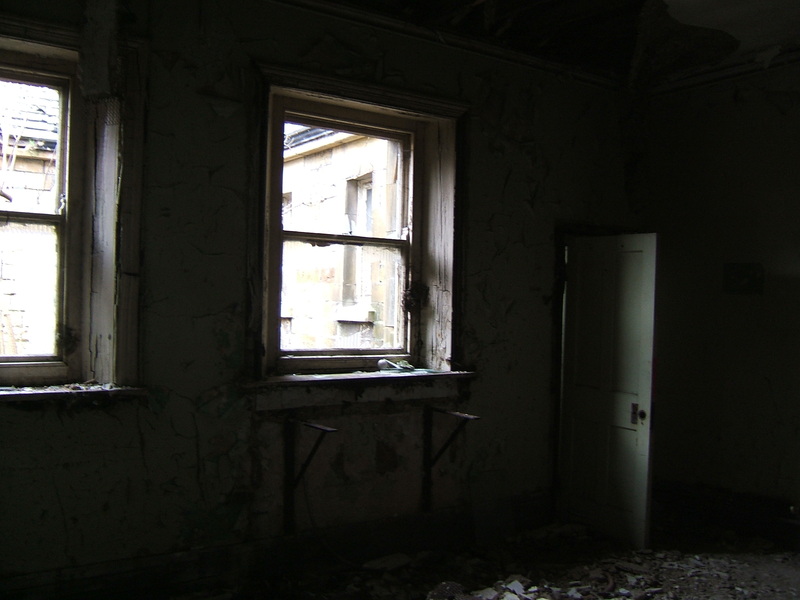 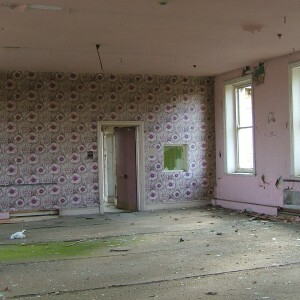 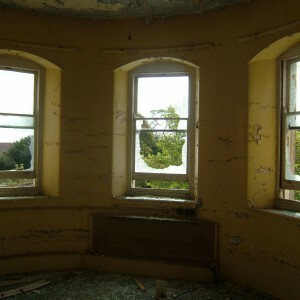 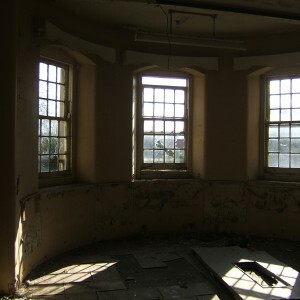 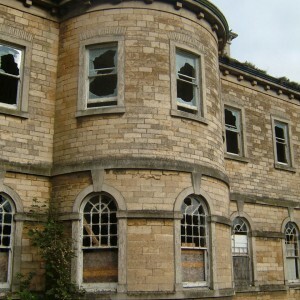 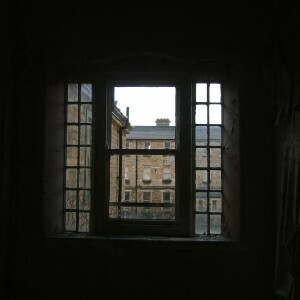 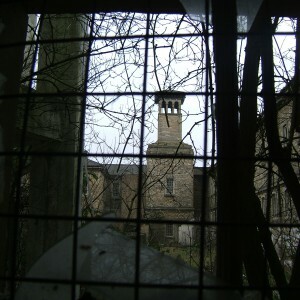 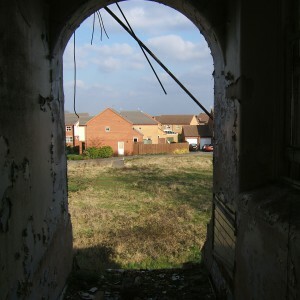 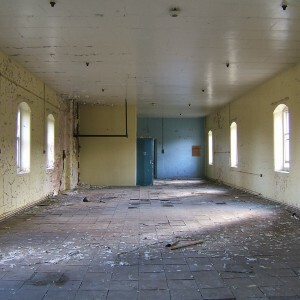 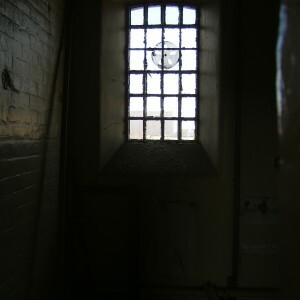 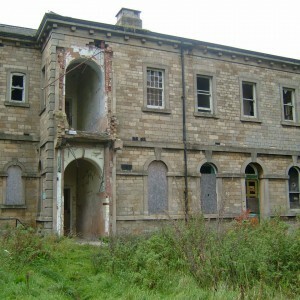 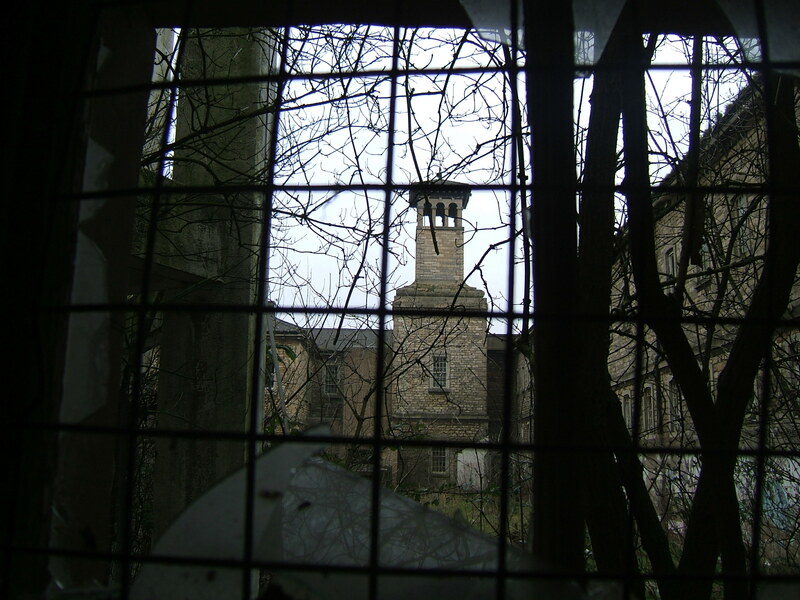 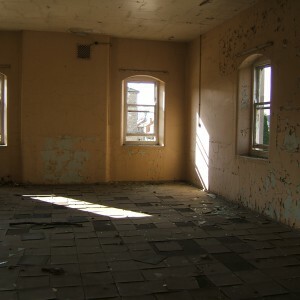 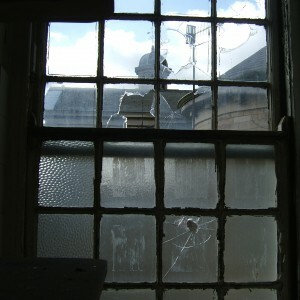 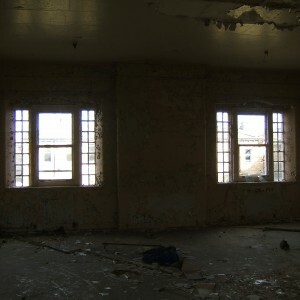 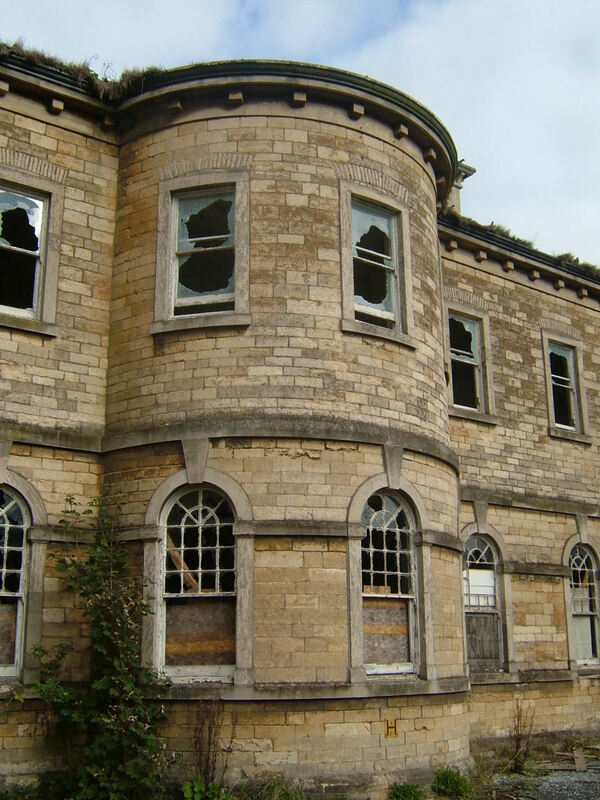 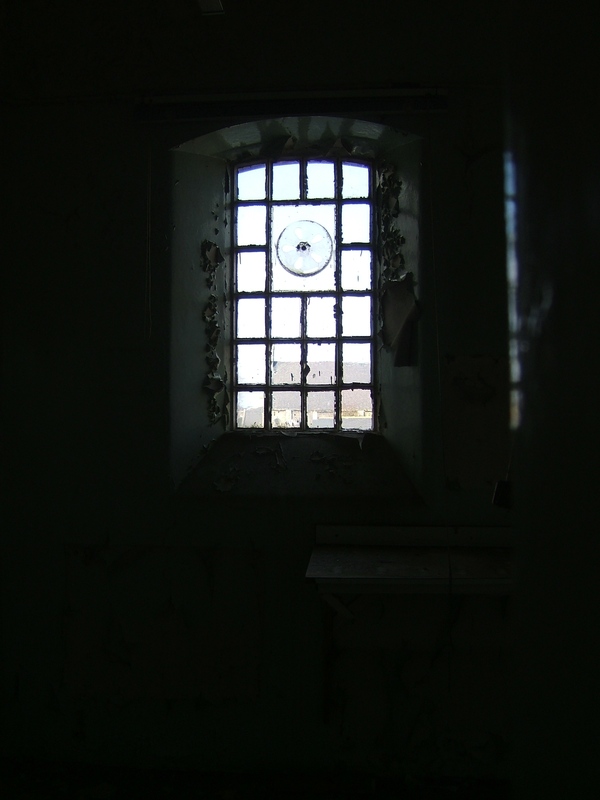 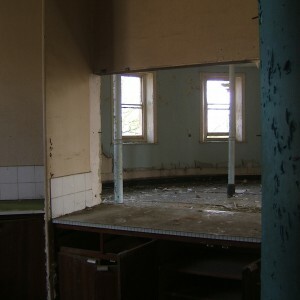 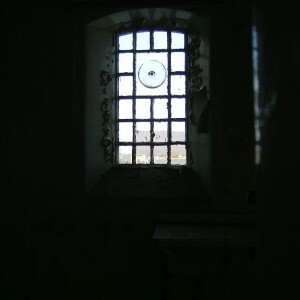 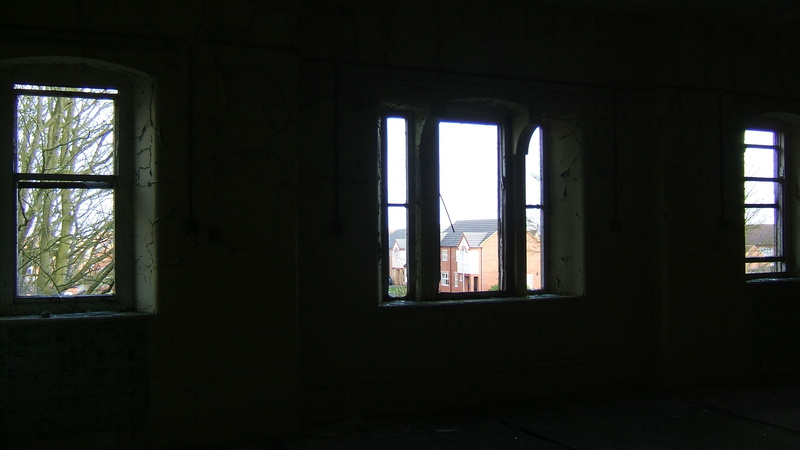 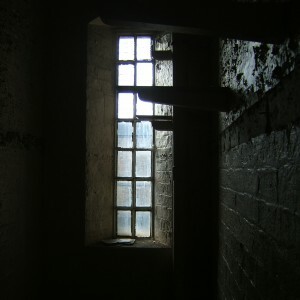 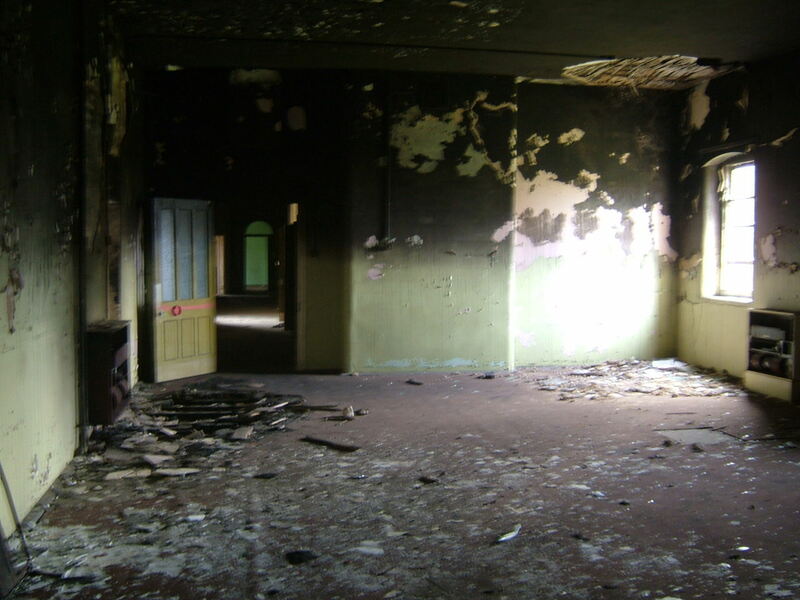 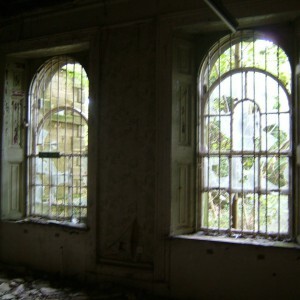 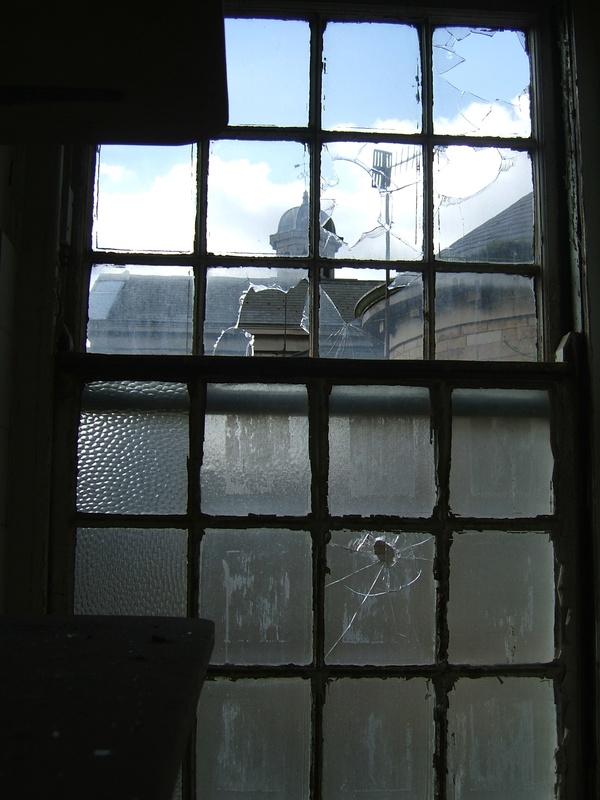 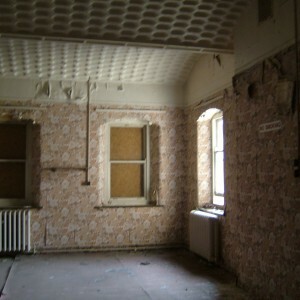 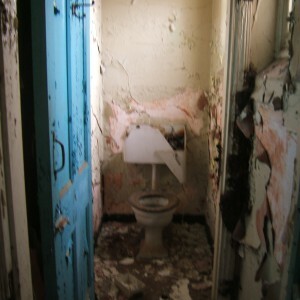 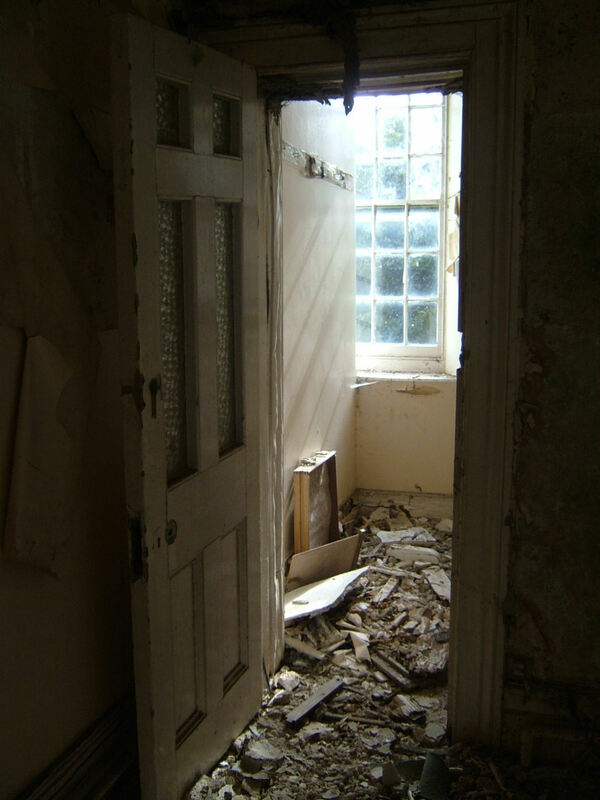 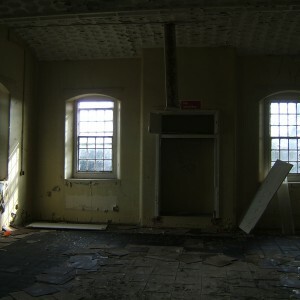 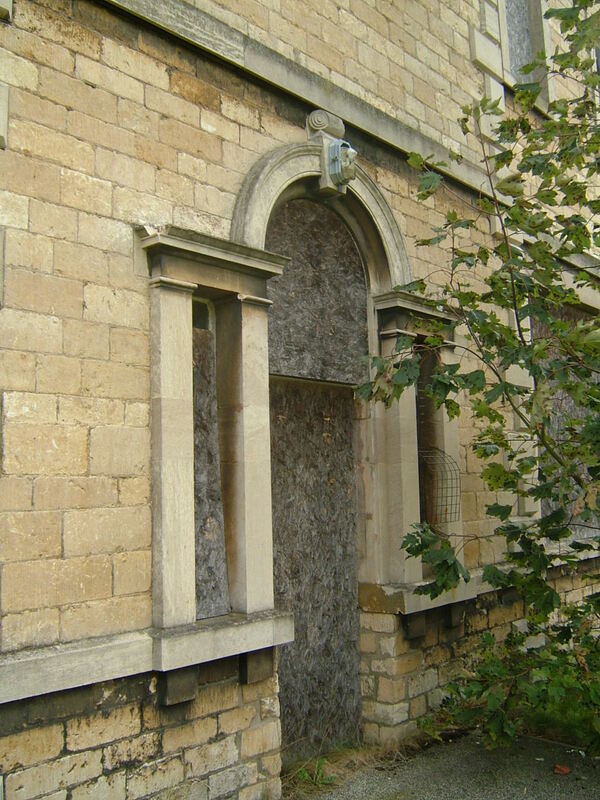 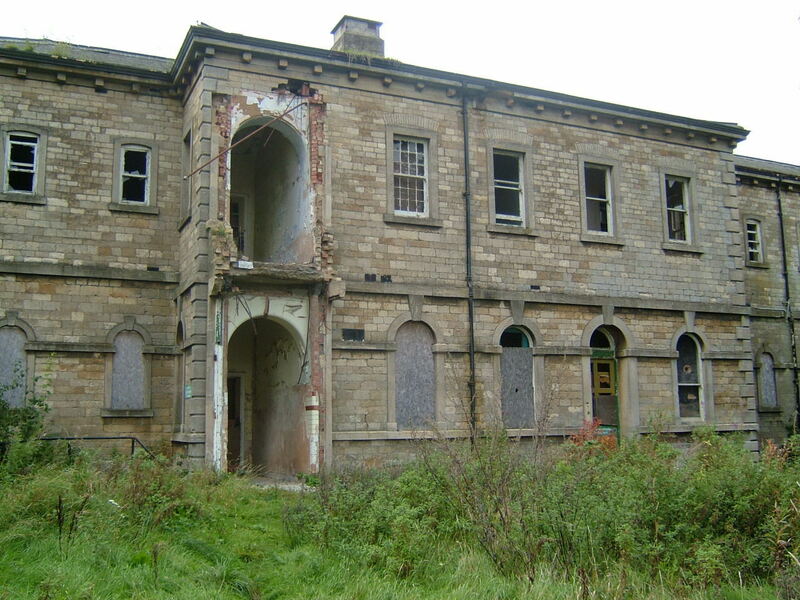 The asylum was linked with others in the East Midlands area, across which the inmates of the Notts County Asylum at Radcliffe on Trent were redistributed for the duration of the conflict and for some time after. 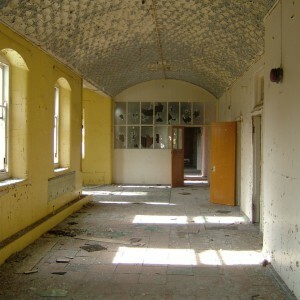 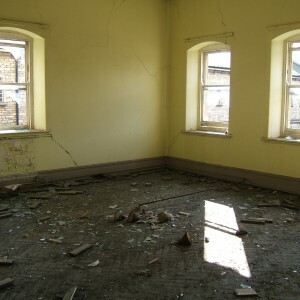 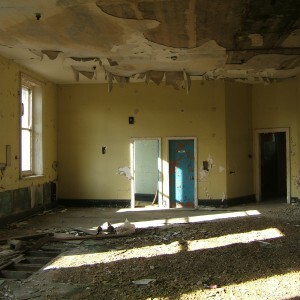 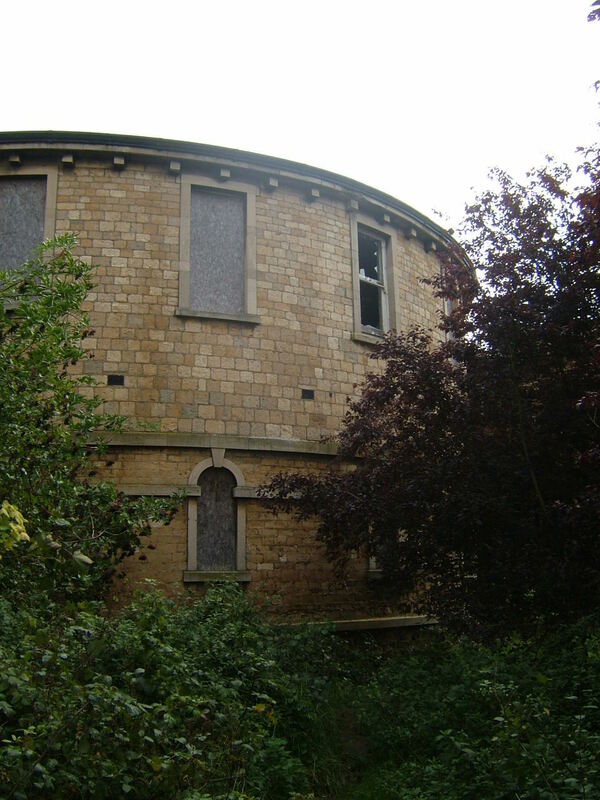 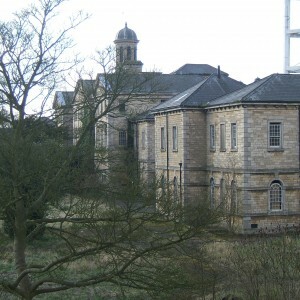 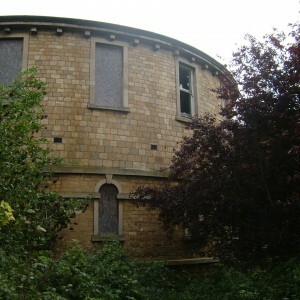 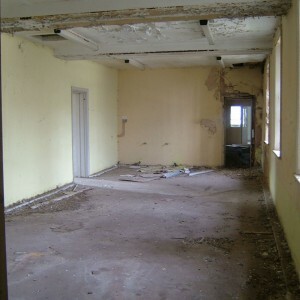 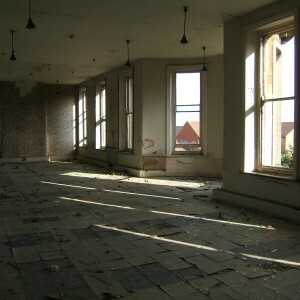 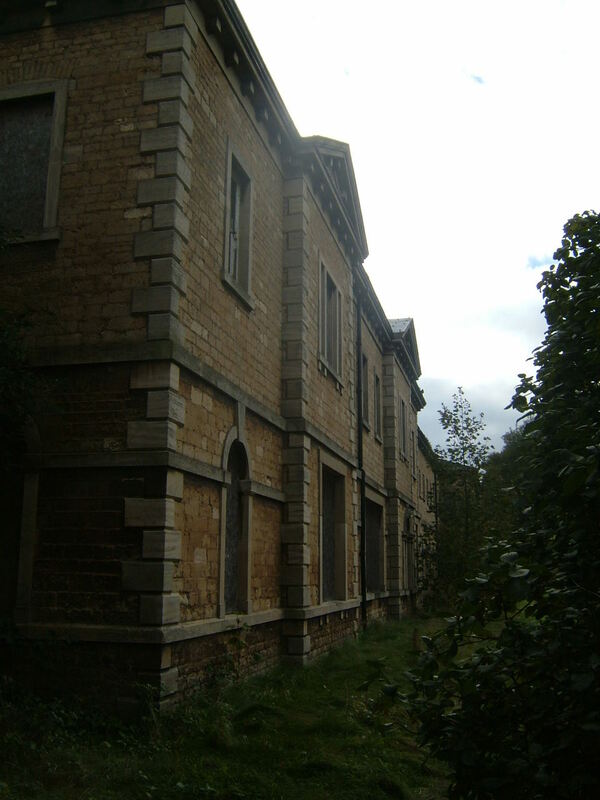 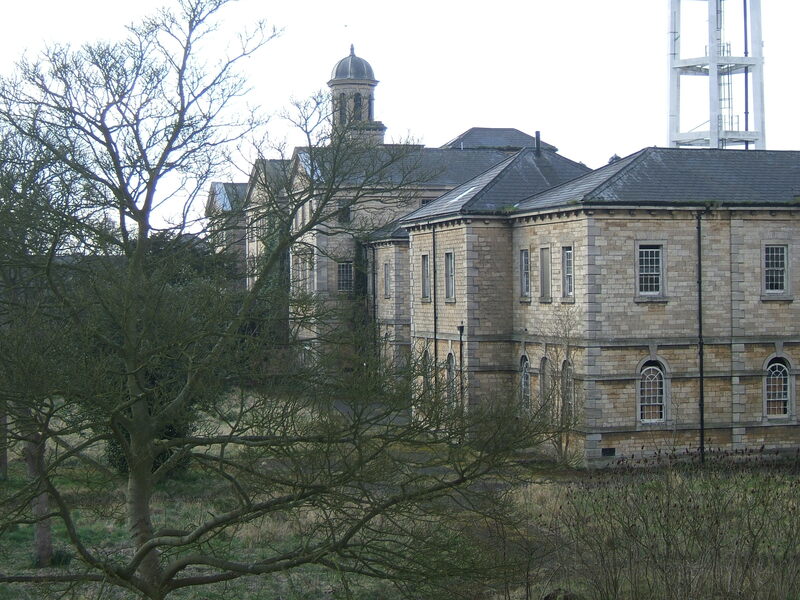 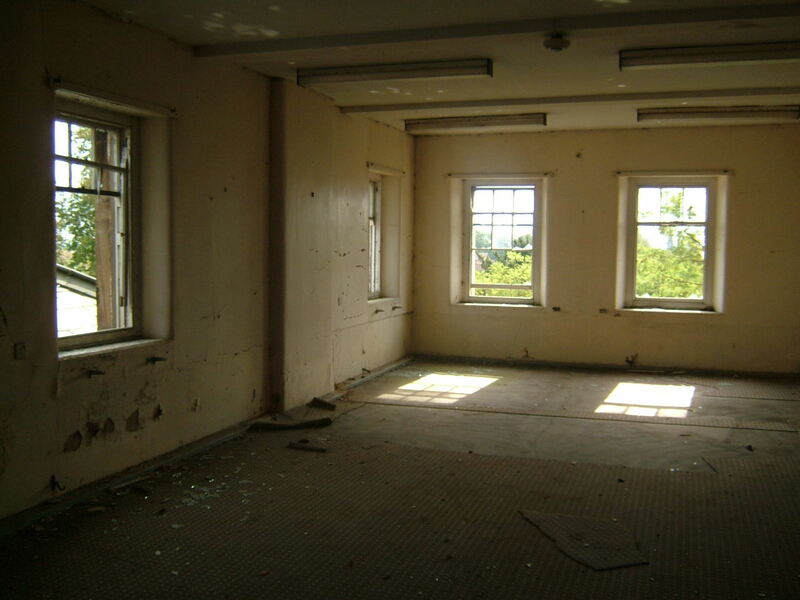 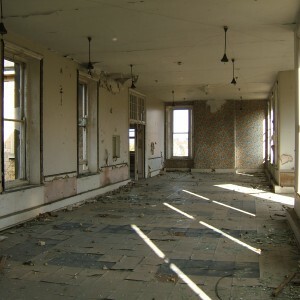 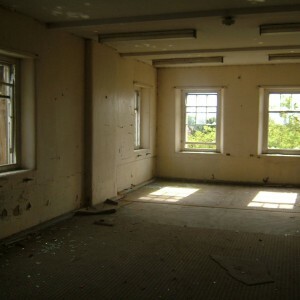 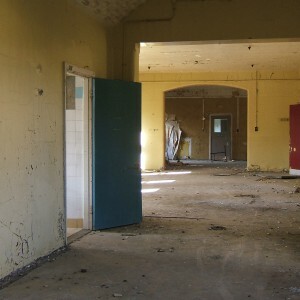 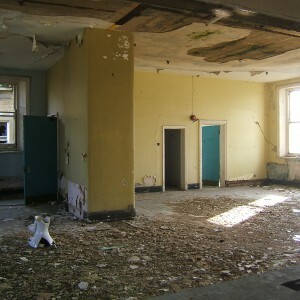 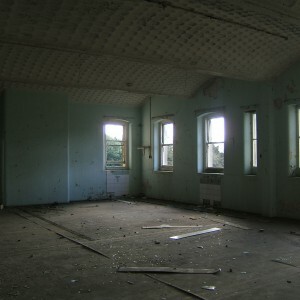 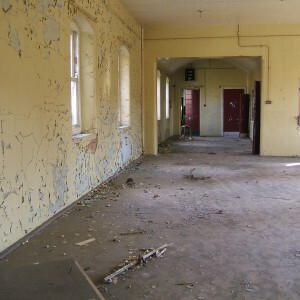 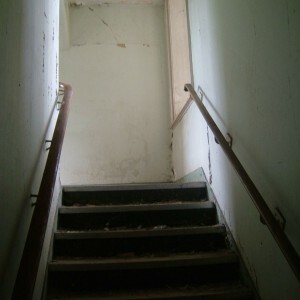 Pressure for space was further exacerbated by the subsequent military use from 1916 of the Northants County Asylum at Duston. 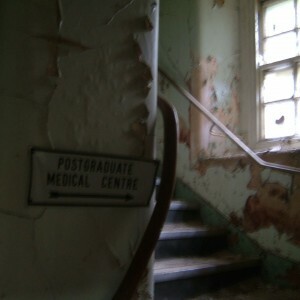 Peace time brought a return of such patients to their home asylums as well as some of the staff who had left to join the war effort. 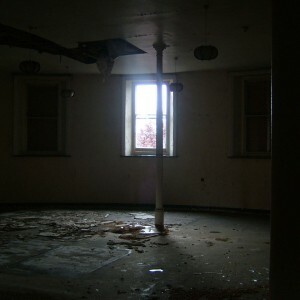 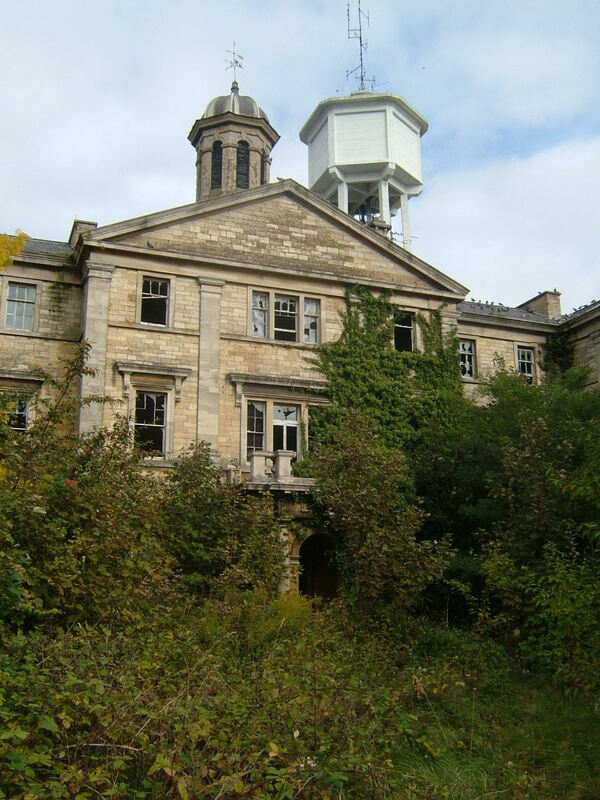 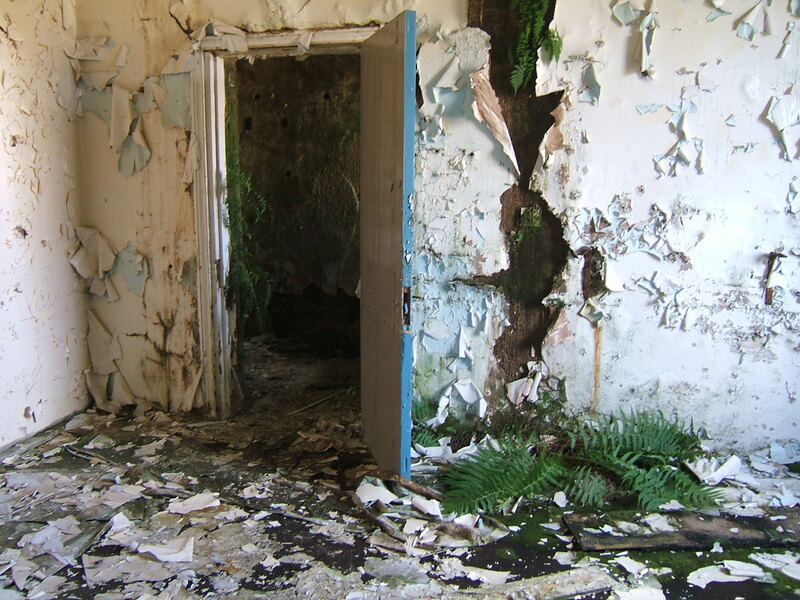 The interwar period also brought a change of Identity as many institutions attempted to shed stigma by removing the term asylum, with the site becoming Bracebridge Mental Hospital. 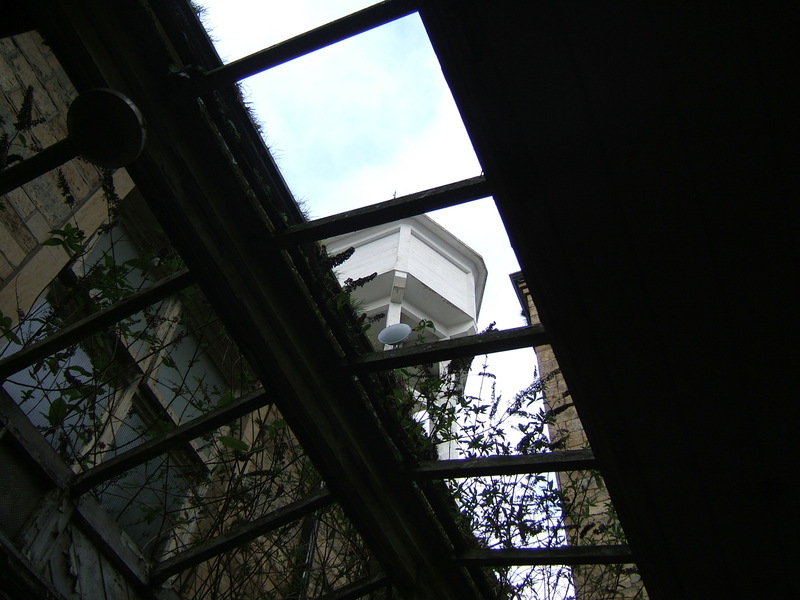 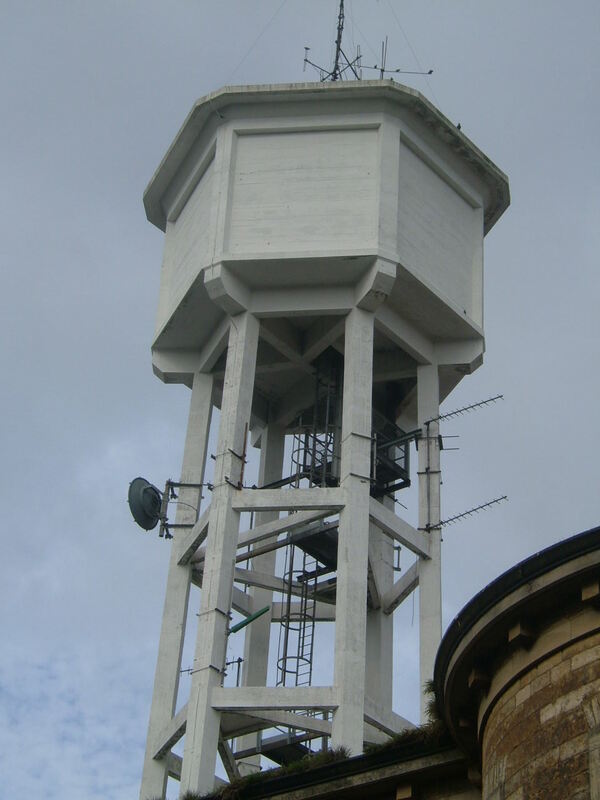 The skyline was dominated from the mid 1920’s by the erection of a concrete water tower by Charles Horobin of the Indented Bar and Concrete Engineering Company, which became a landmark of the site or nearly 90 years. 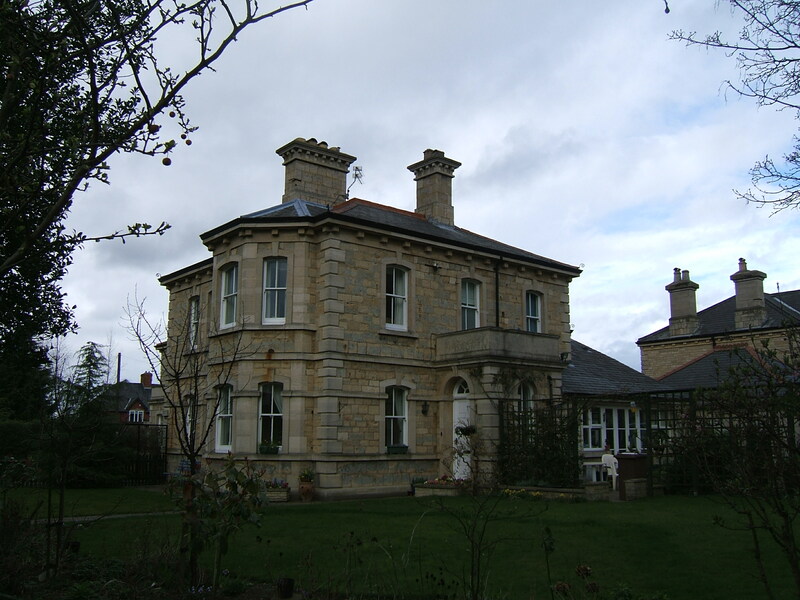 Further additions in 1928 between the south frontage and cemetery comprised detached male and female villas for working chronic patients designed by Harold S Hall who was later also responsible for the hospital’s nurses home in 1938. 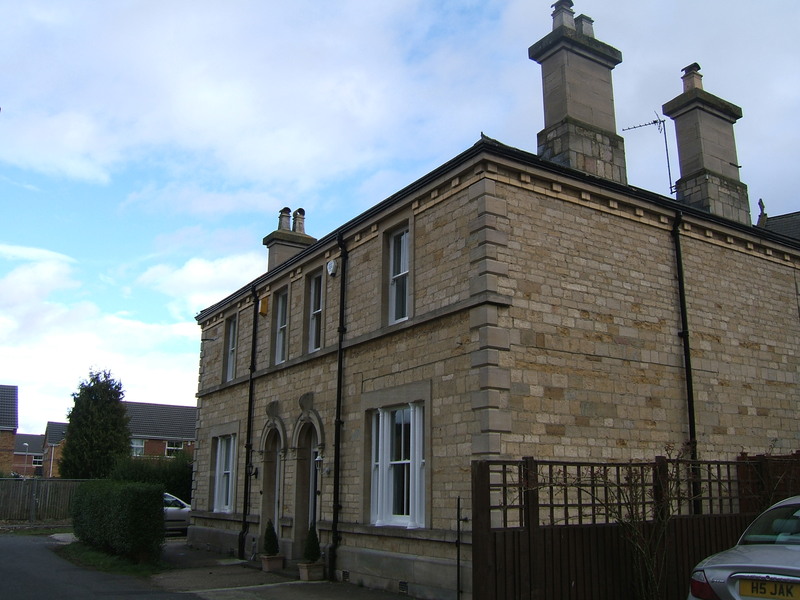 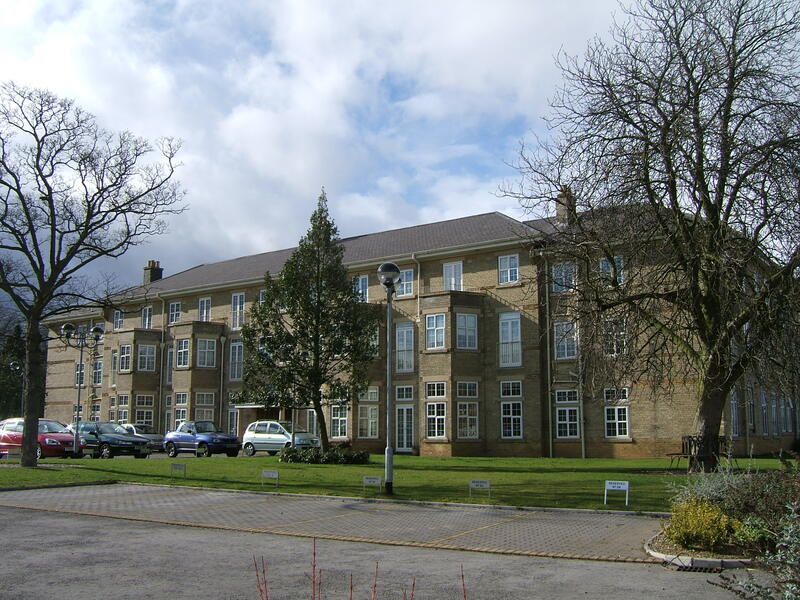 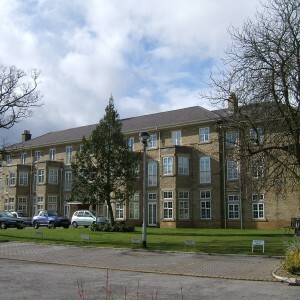 A larger programme of expansion designed by A. Riichmond and Sons, of Retford took place during the 1930’s with the building of an admissions hospital and staff housing on farmland west of the main grounds and adjacent to the isolation hospital. 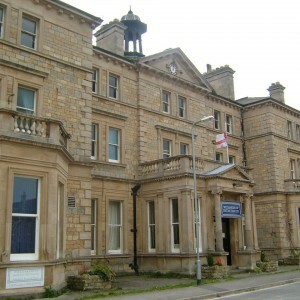 This was intended to be considered as a largely separate unit from the main asylum with its own entrance and lodge onto Canwick avenue. 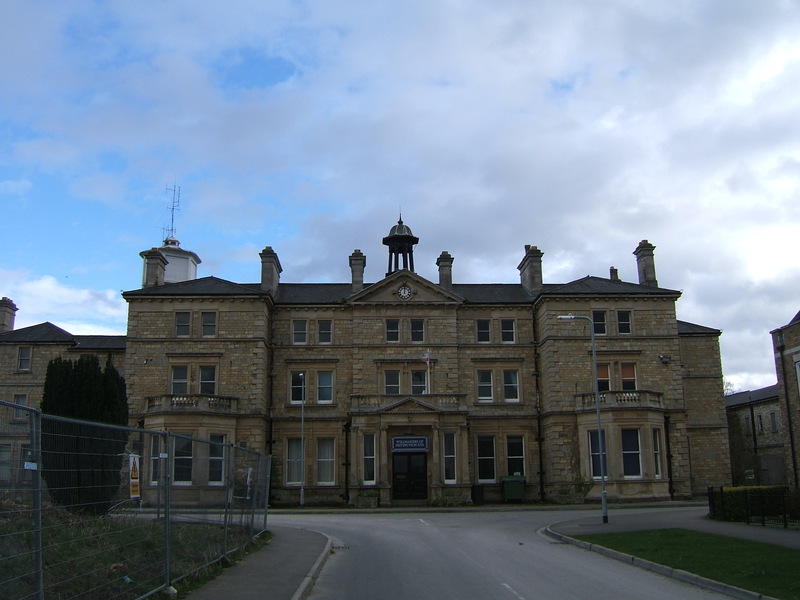 The aim was for patients to admitted and treated in the acute phase of their illness which was when they were perceived to be most curable, in the hope that they should never require admission to the main building. 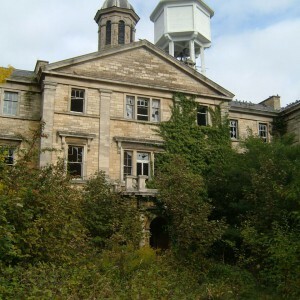 The nearby village of Harmston was chosen as the site for the counties’ new mental deficiency colony with the existing manor as its hub. 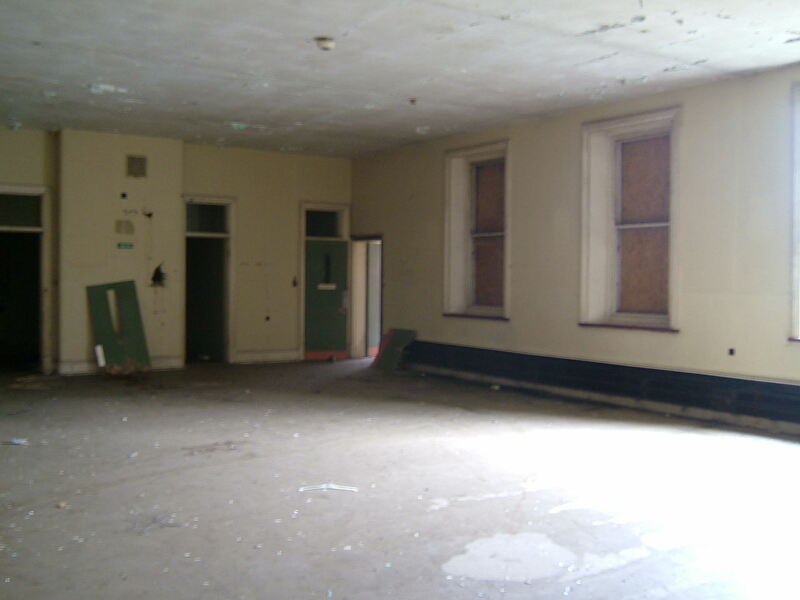 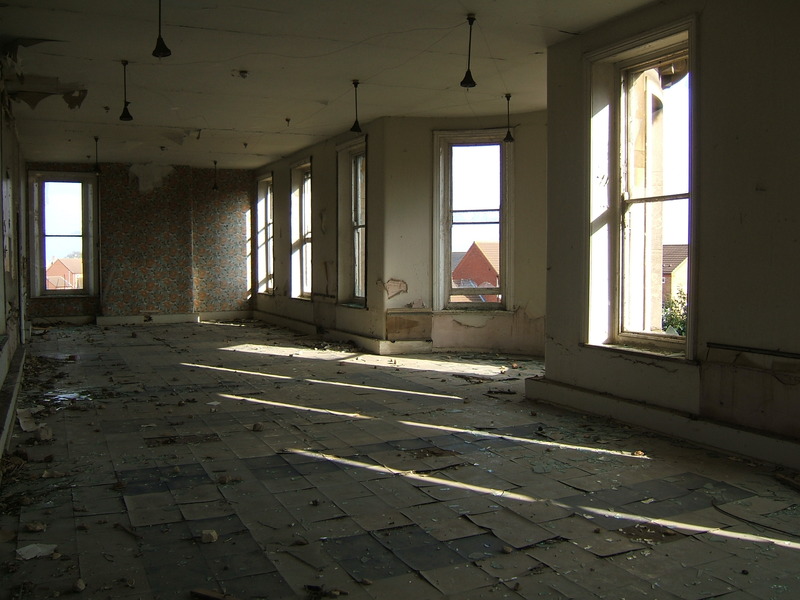 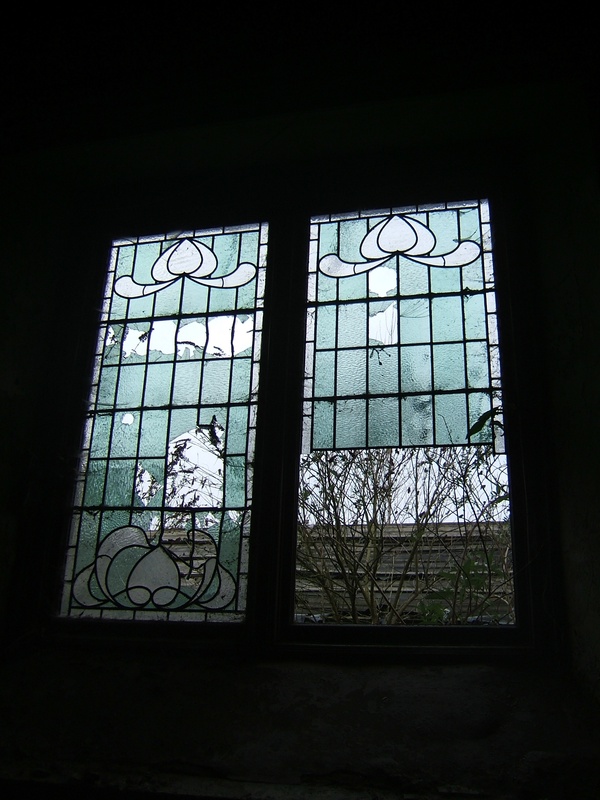 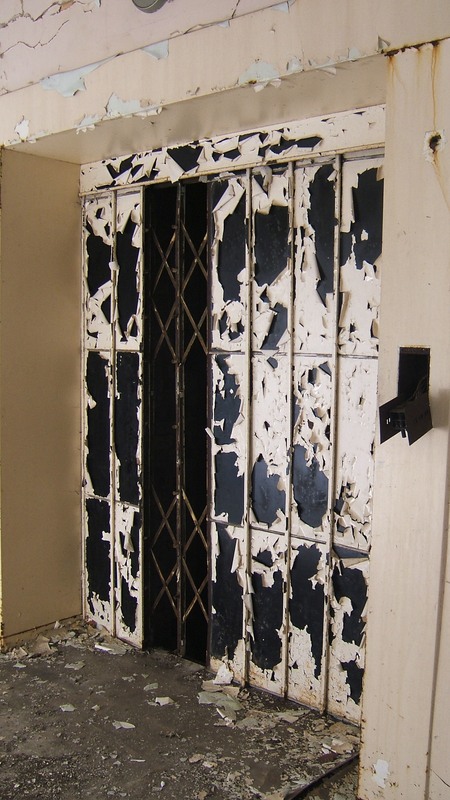 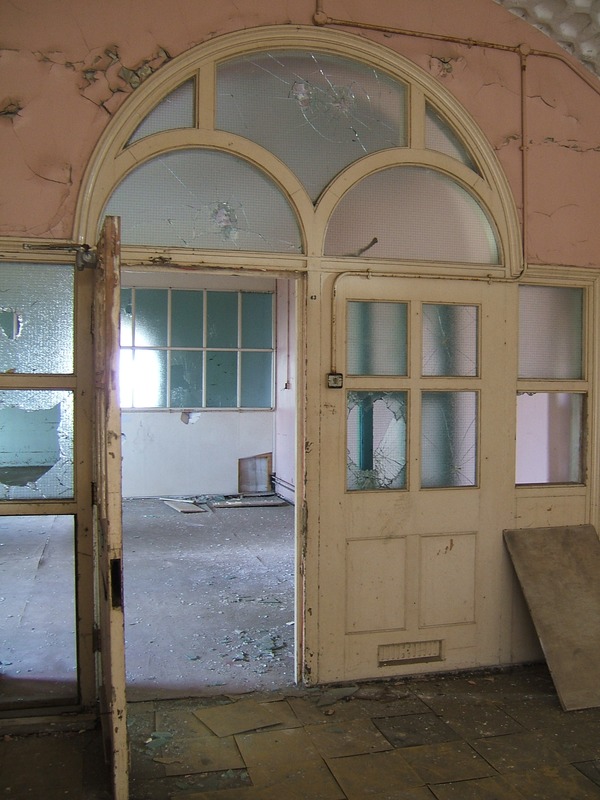 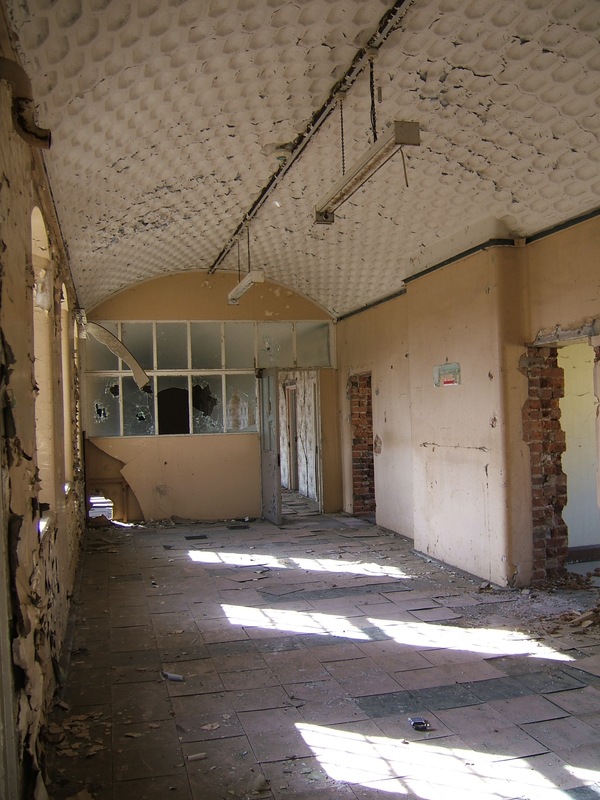 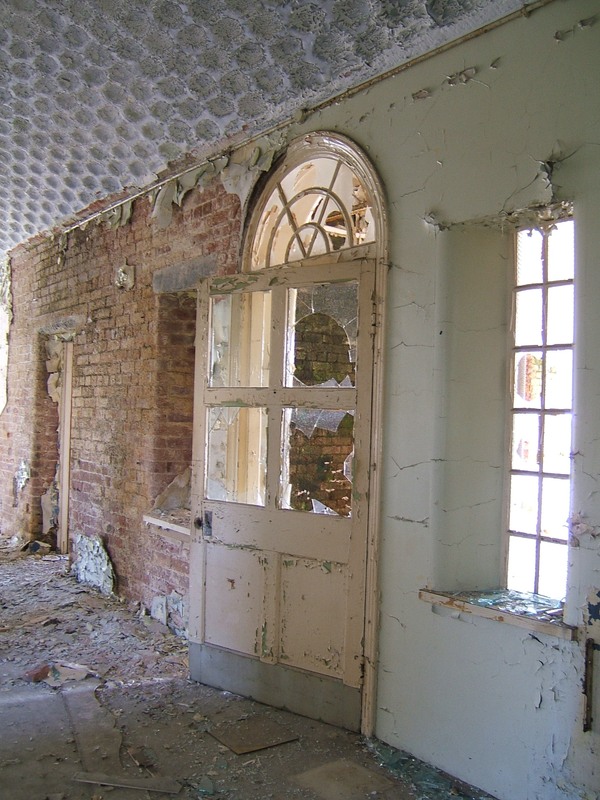 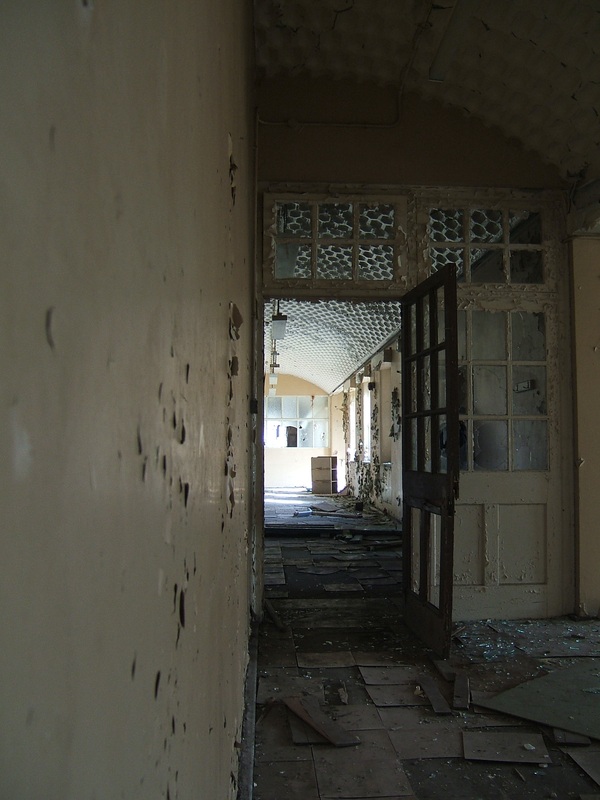 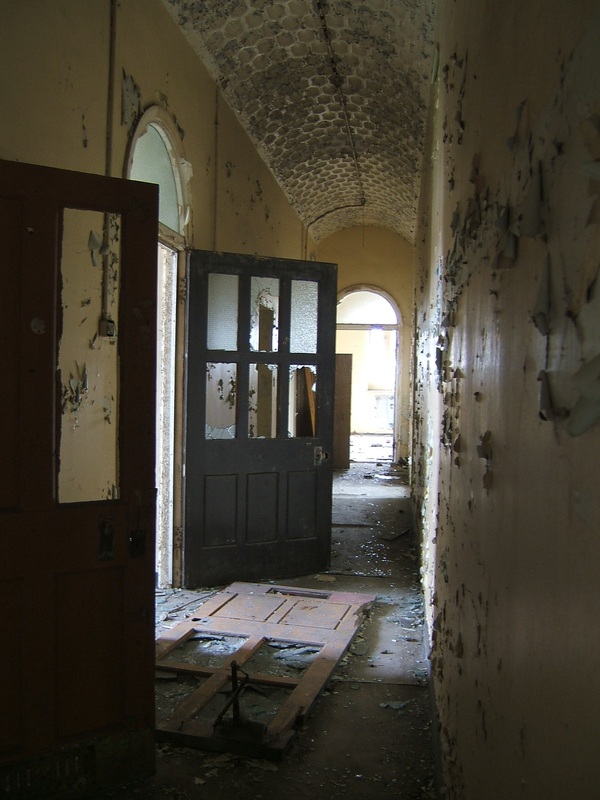 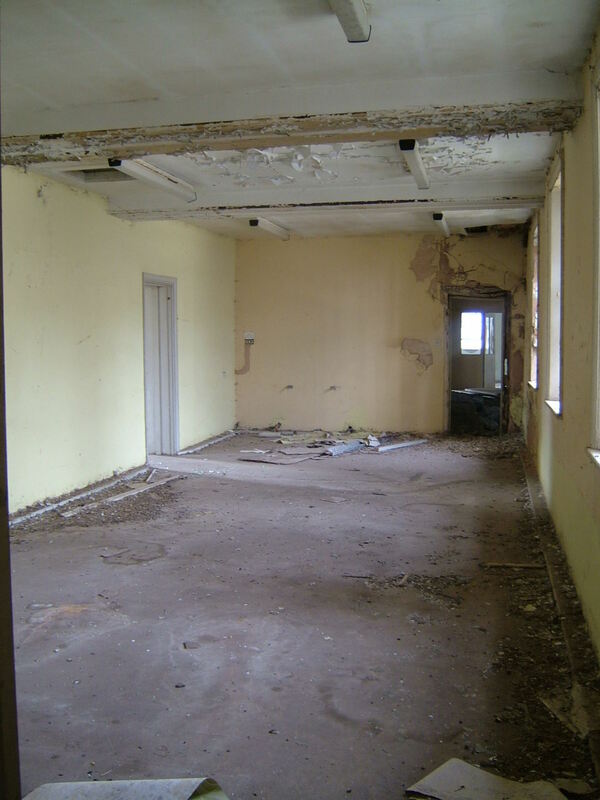 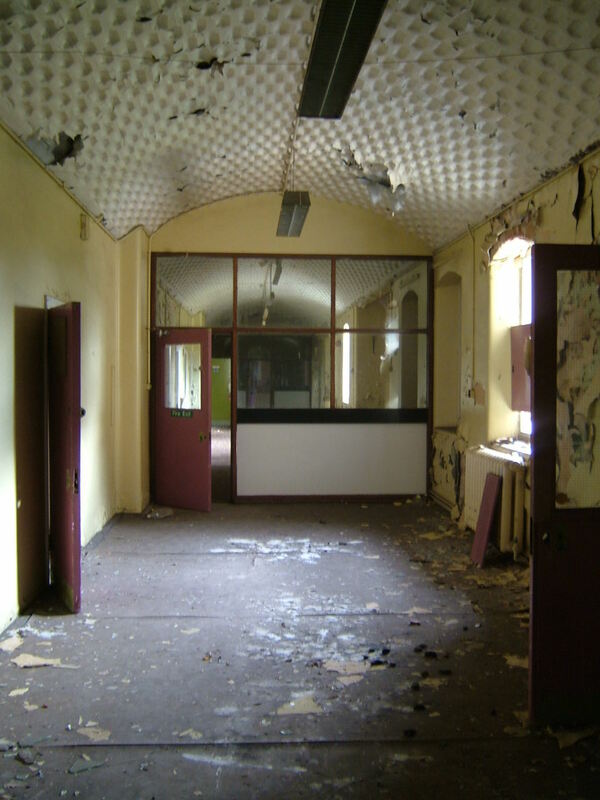 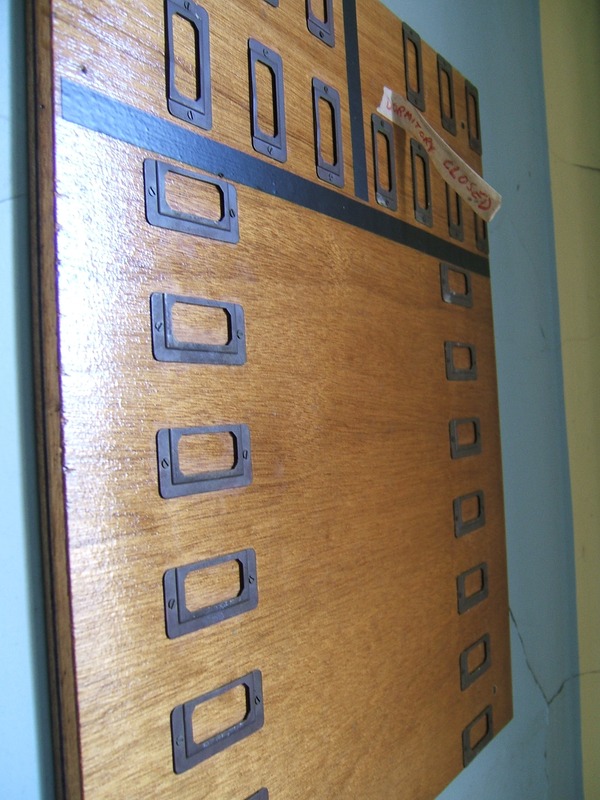 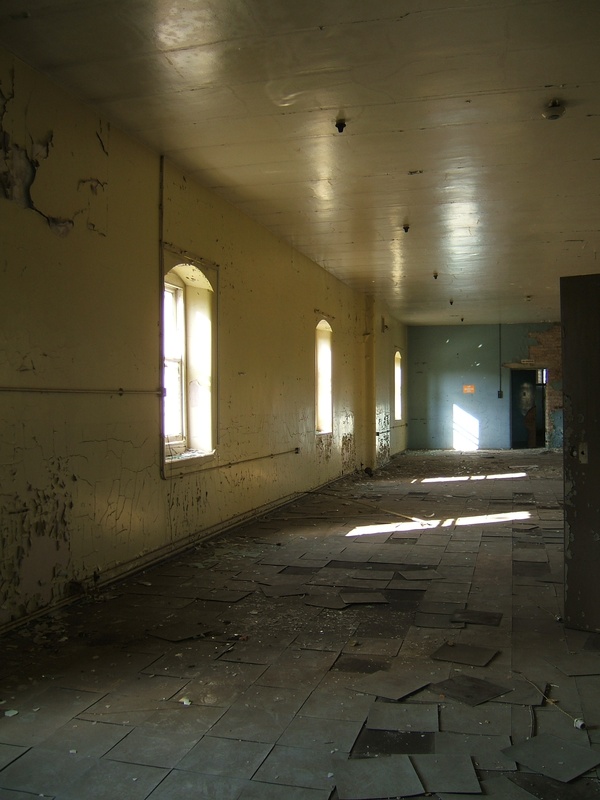 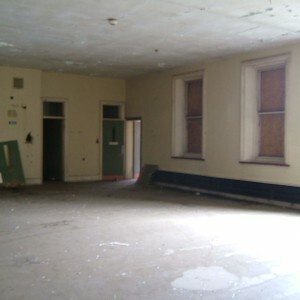 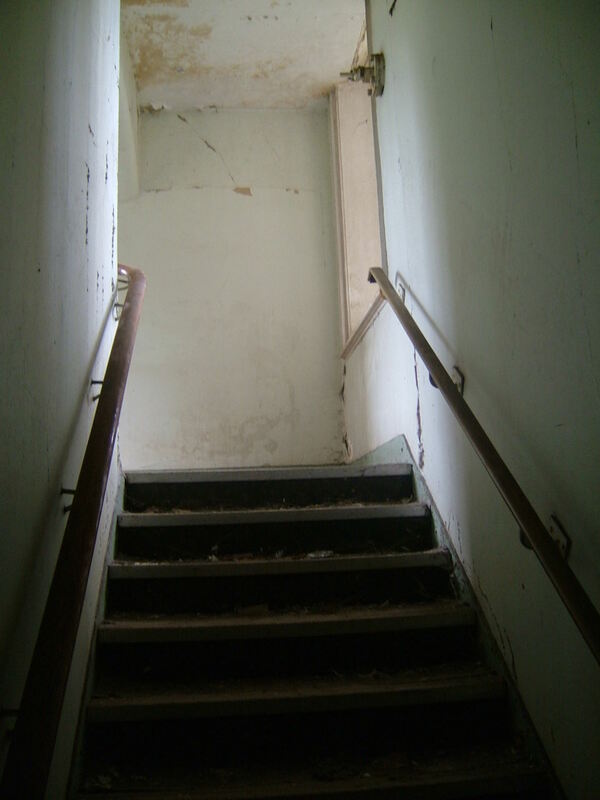 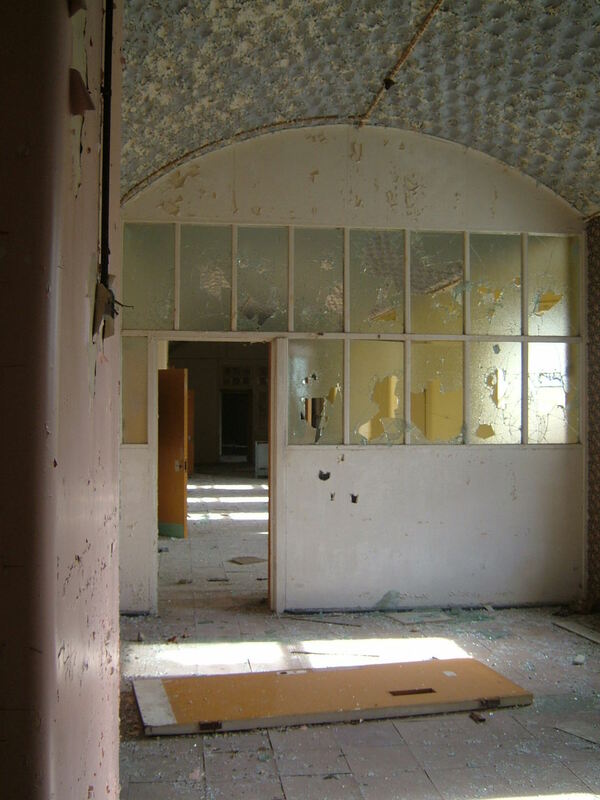 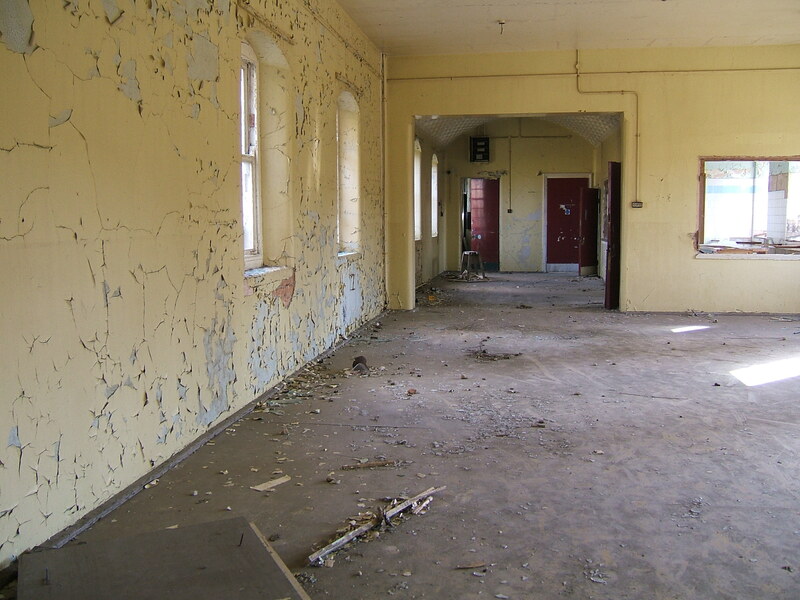 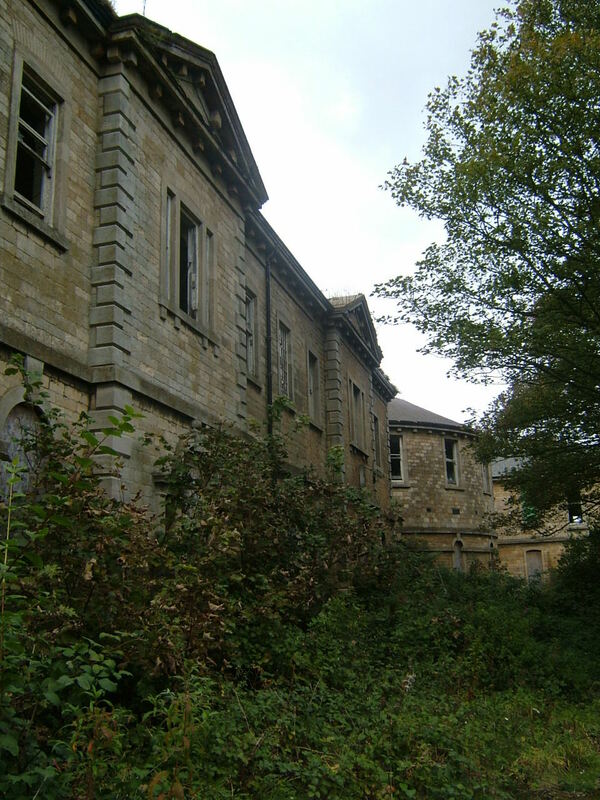 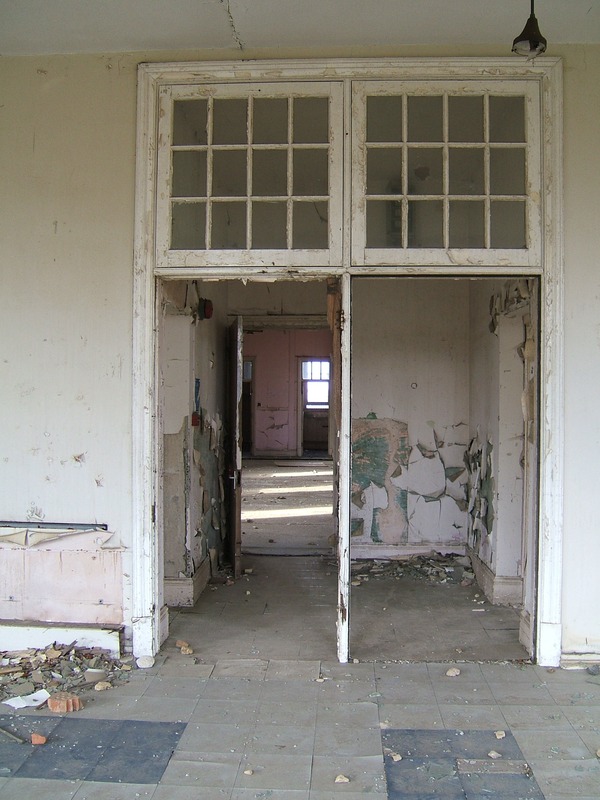 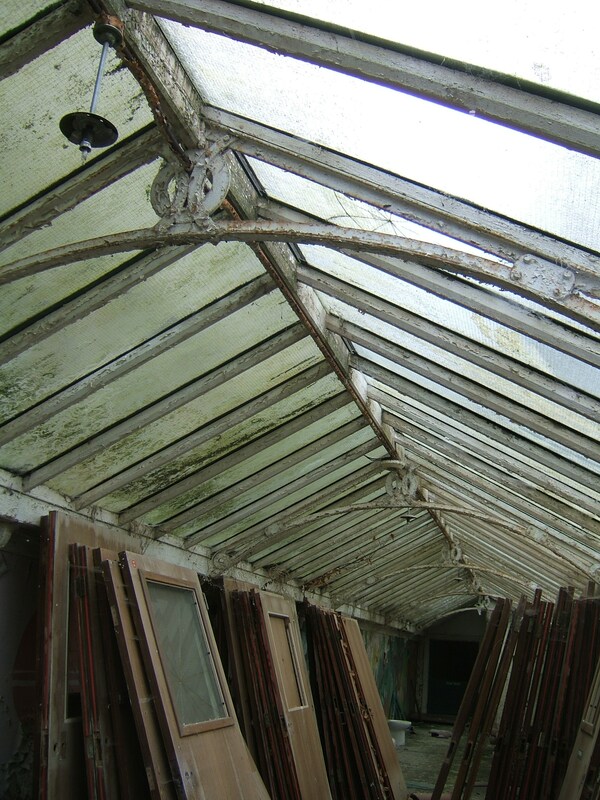 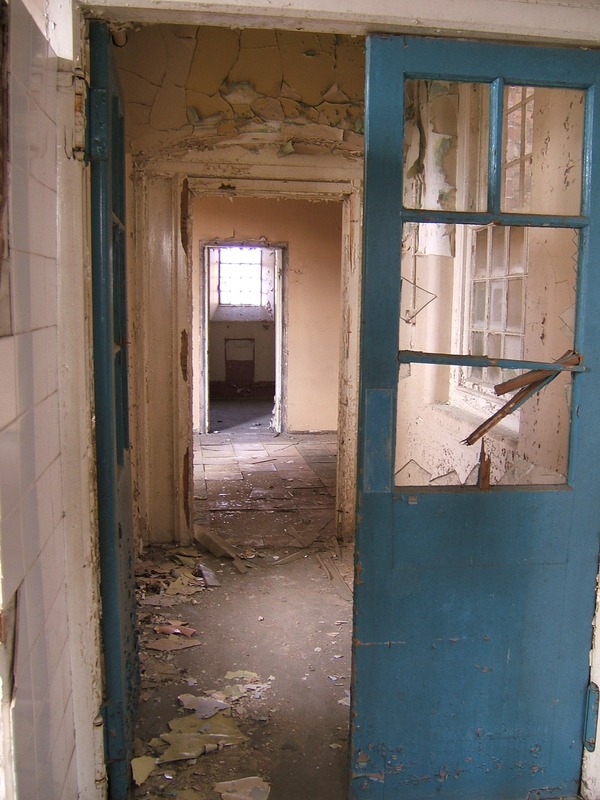 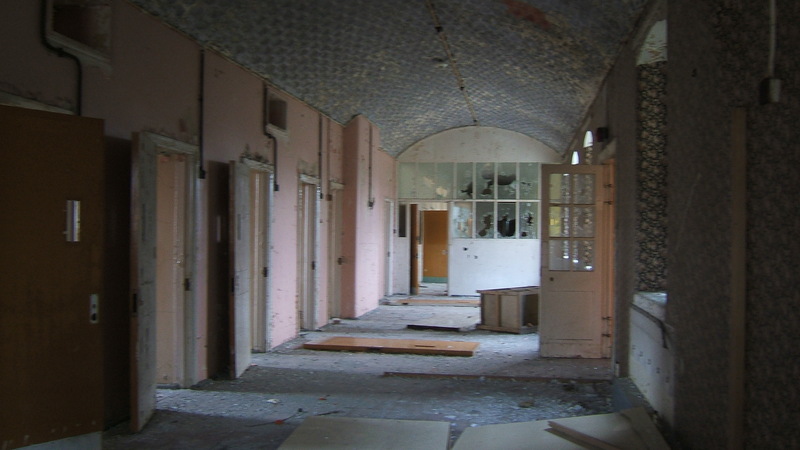 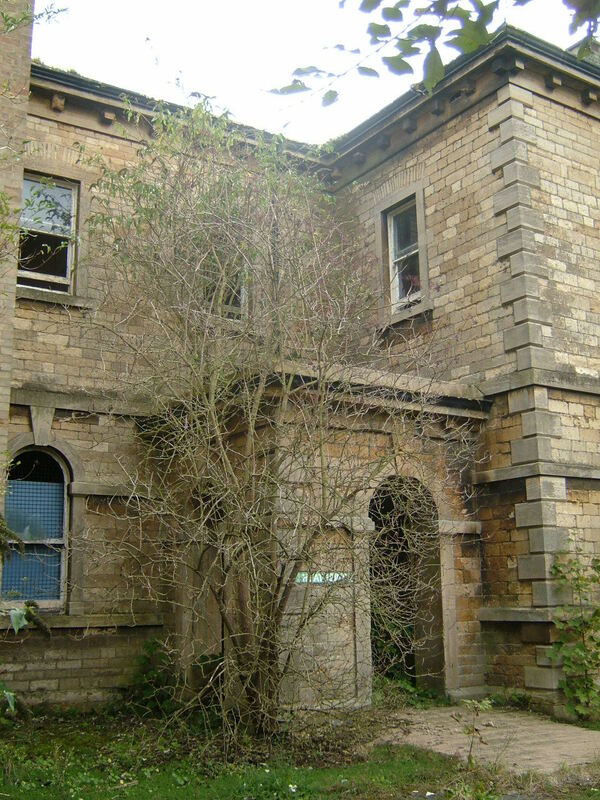 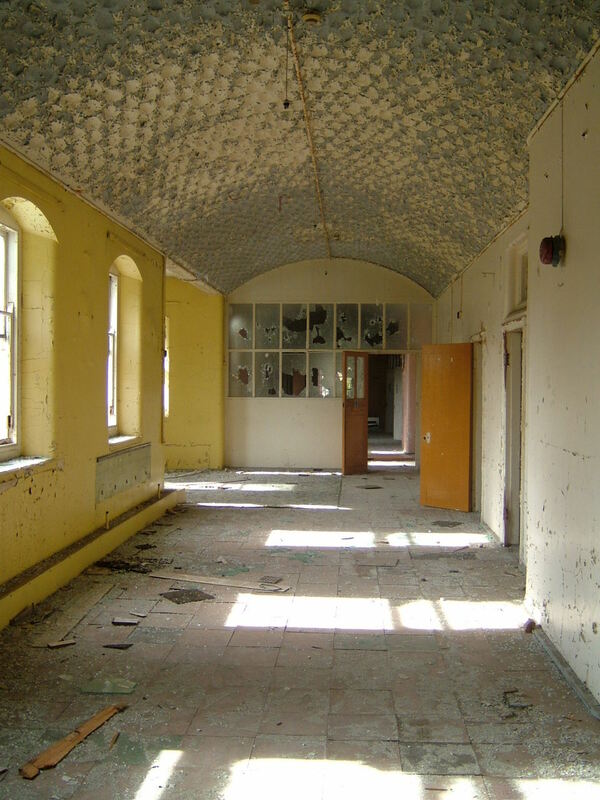 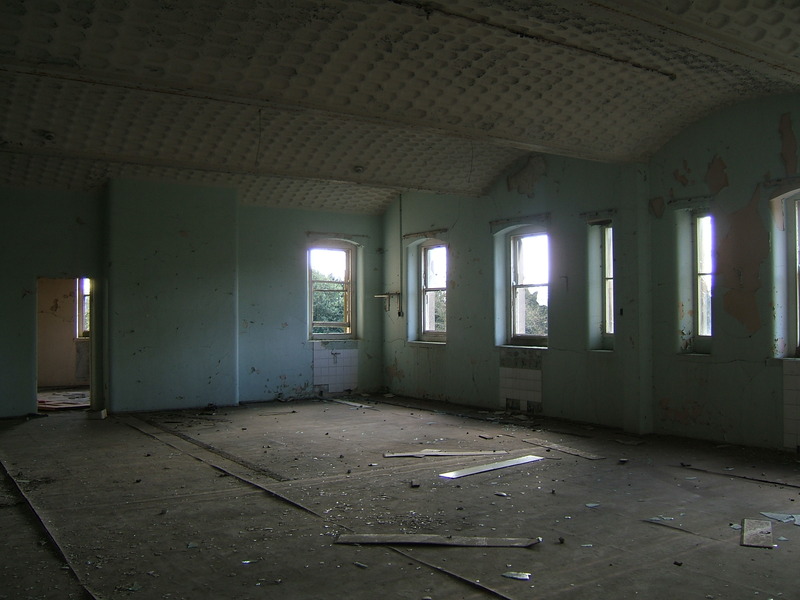 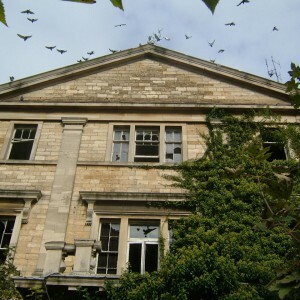 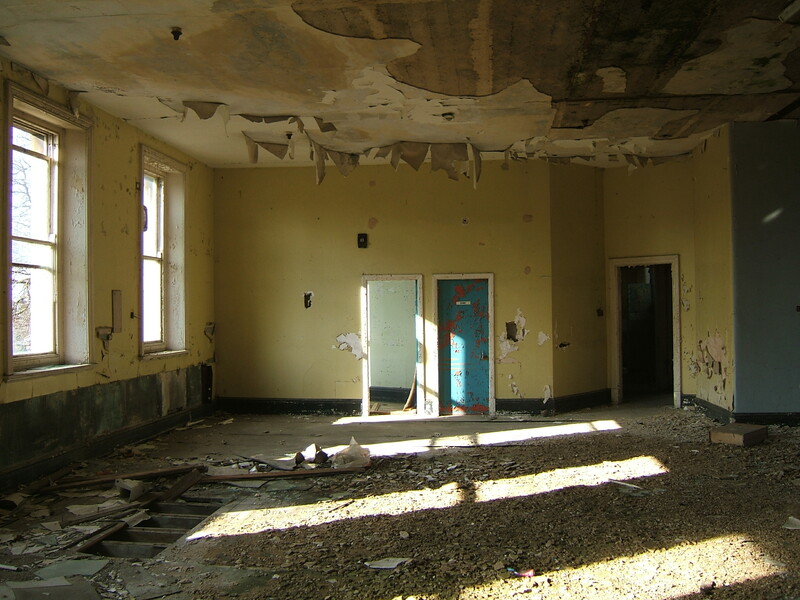 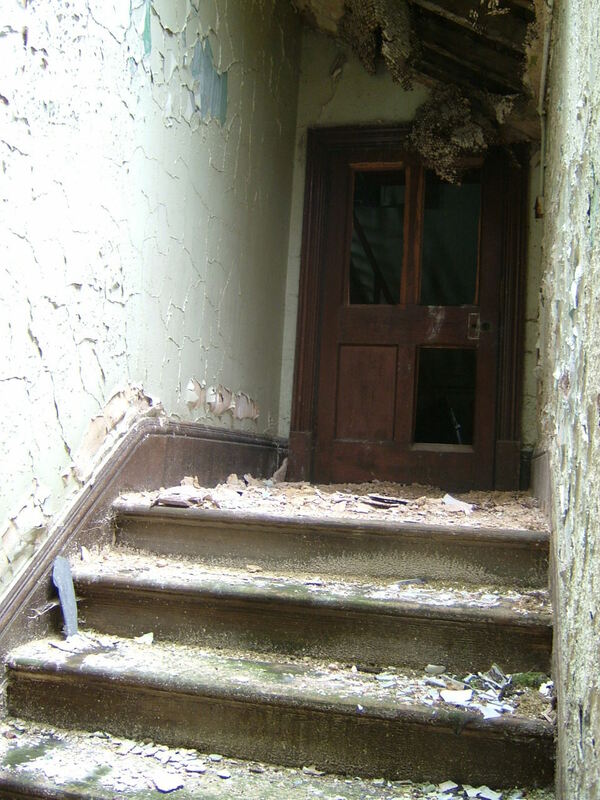 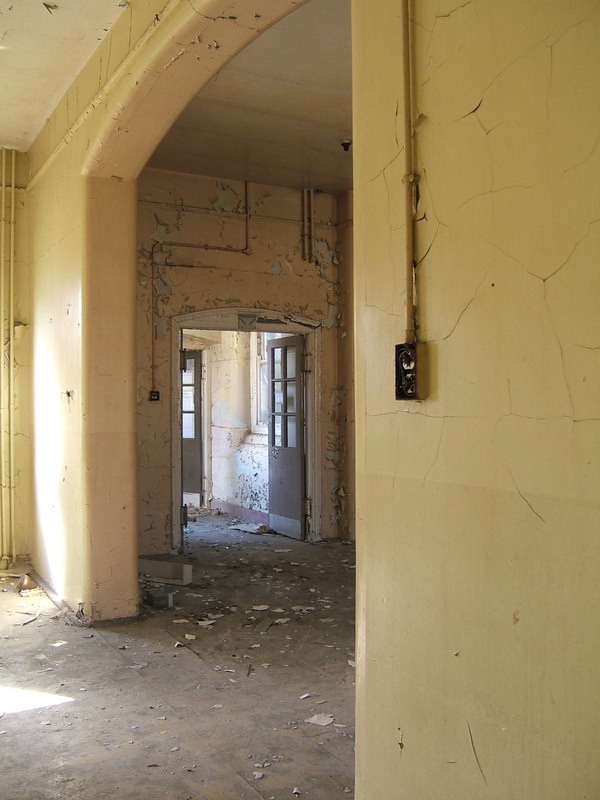 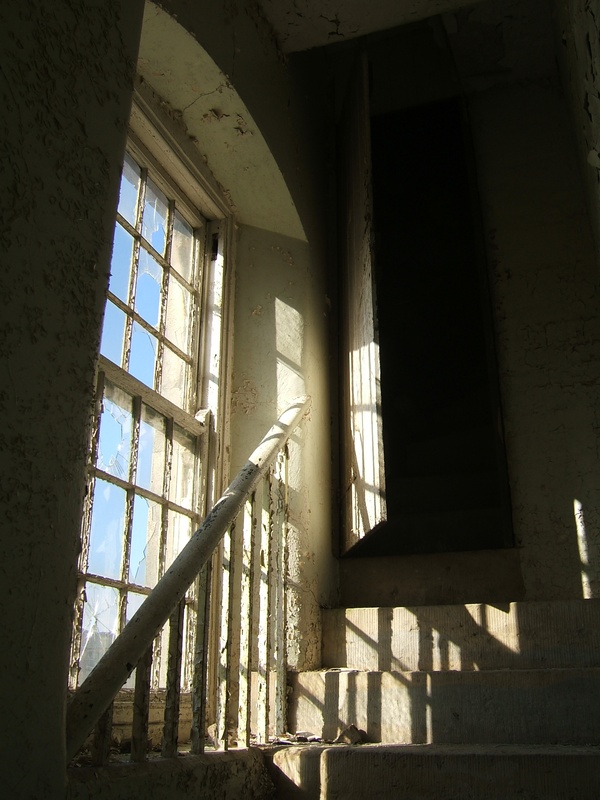 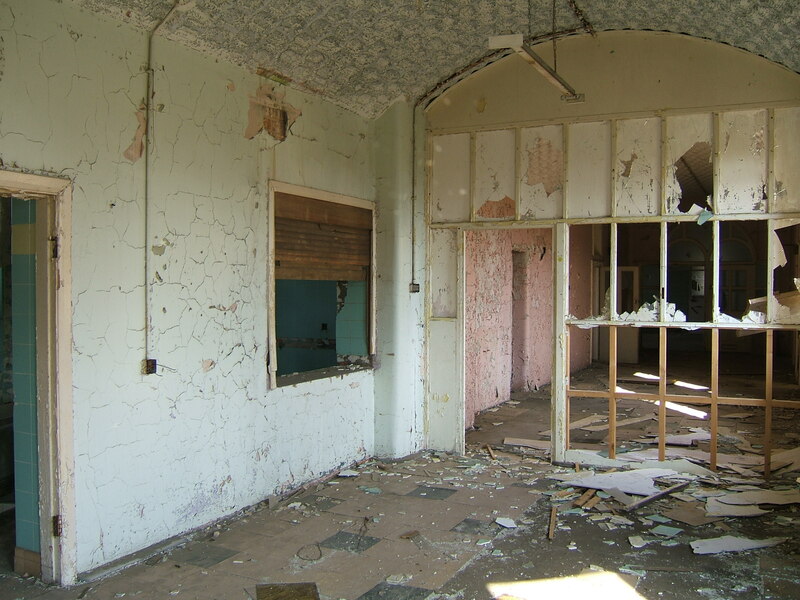 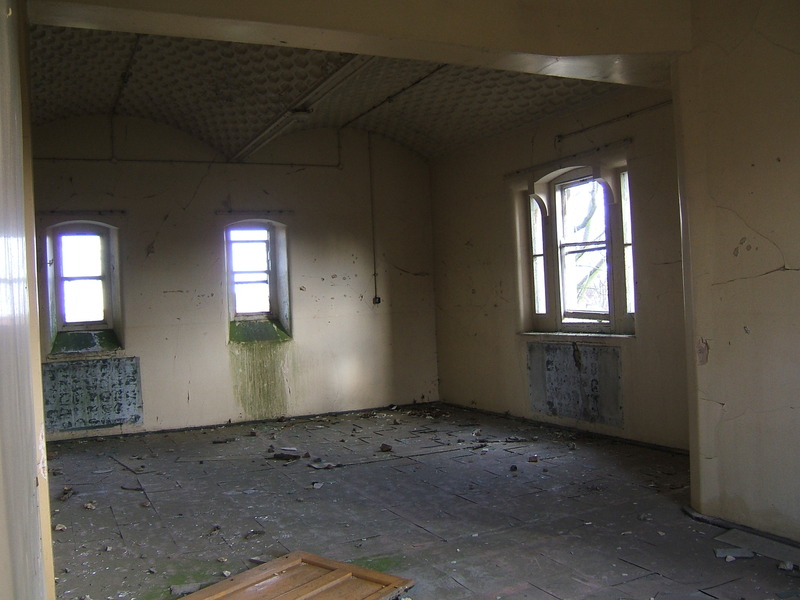 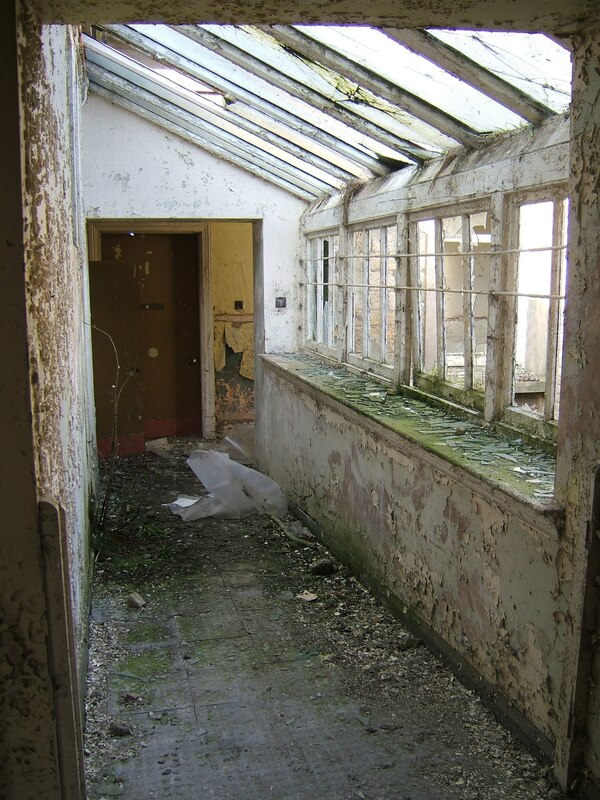 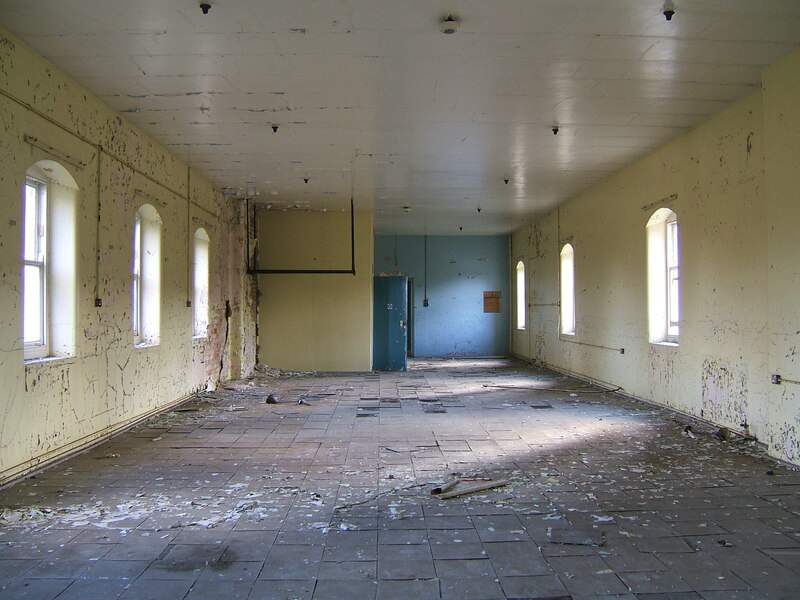 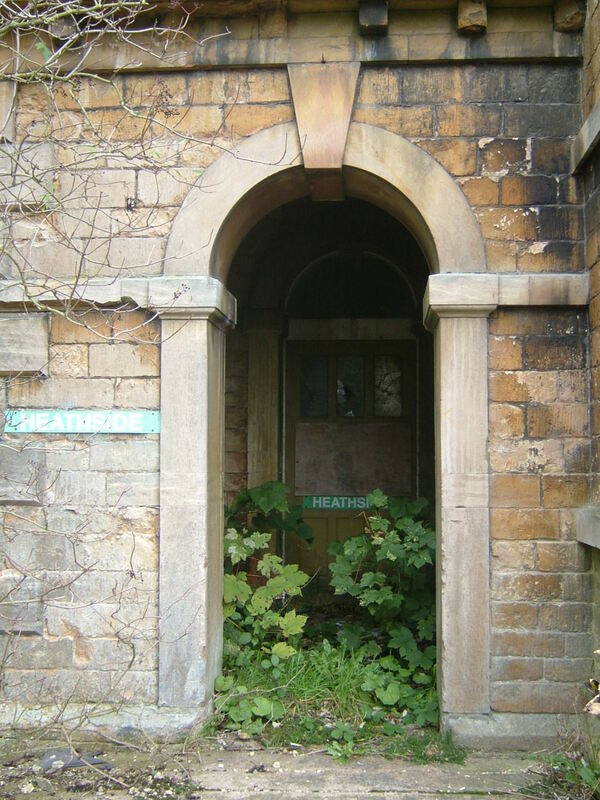 During World War II patents were received from Rauceby mental hospital when it was taken over by the Royal Air Force, for a brief time returning Kesteven and Grantham patients back with the other Lincolnshire constituents at Bracebridge Heath. 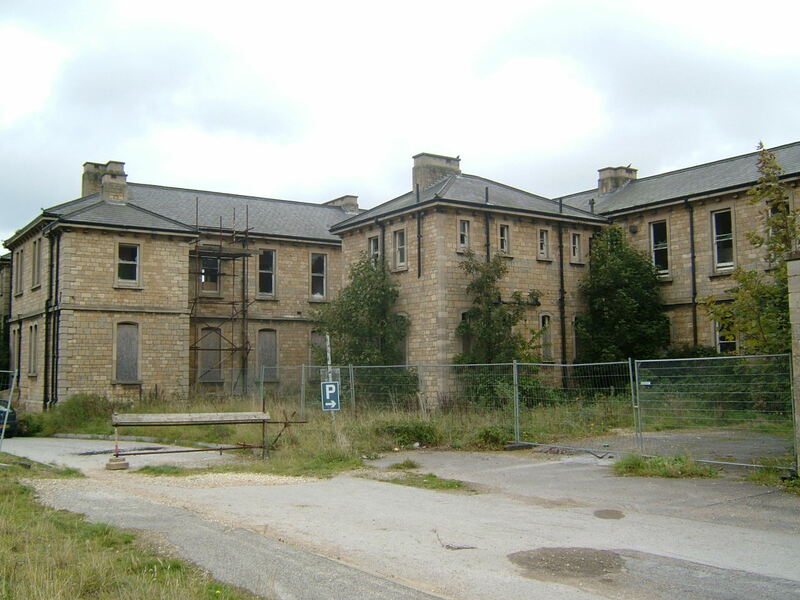 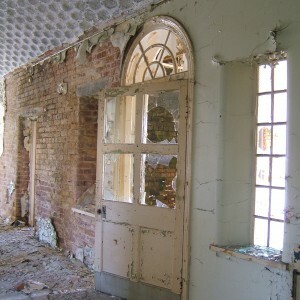 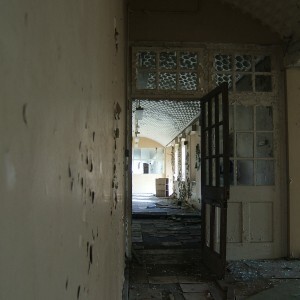 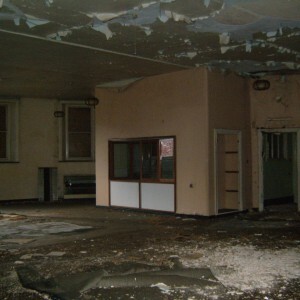 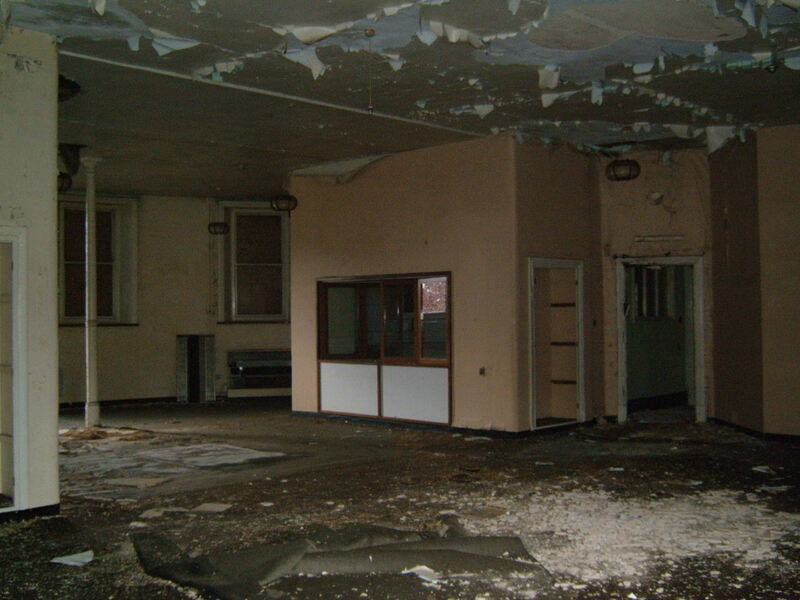 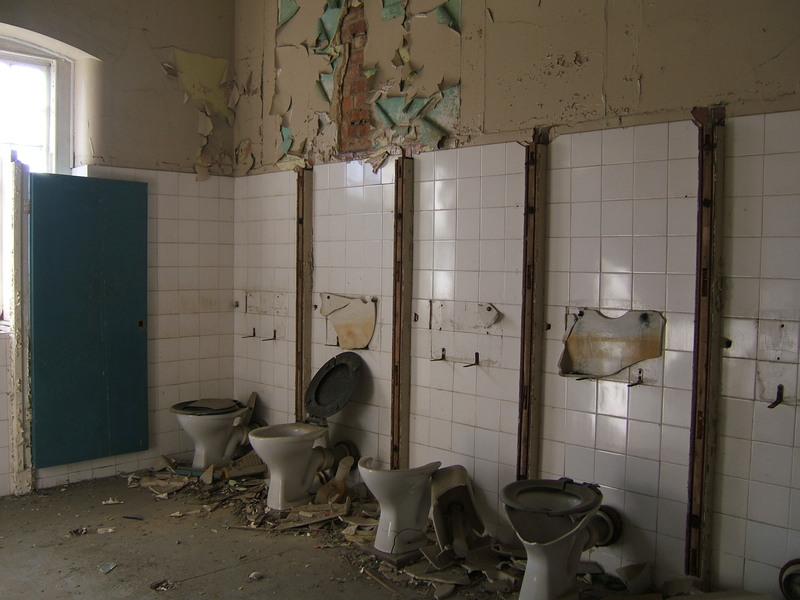 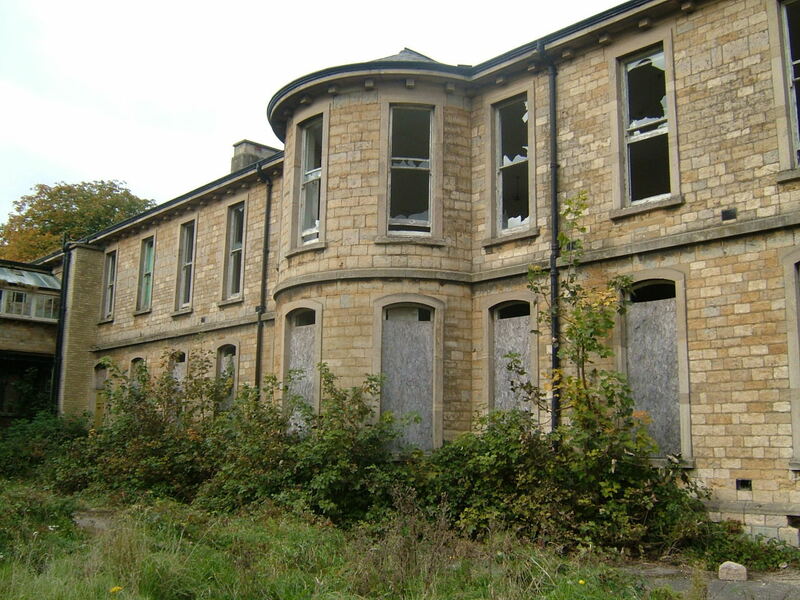 From the creation of the National Health Service, Bracebridge Heath hospital as it had become known was linked once again with the old Lincoln asylum site which had become The Lawn hospital leading to a reconfiguration of services and catchment areas for both institutions. 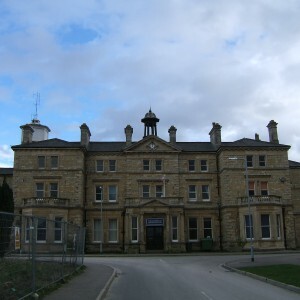 New treatments and implemented on the Bracebridge heath site such as occupational and industrial therapies and into the 1960’s the hospital looked to modernise its ageing campus and once again shed its old image and reputation by renaming itself St. John’s hospital. 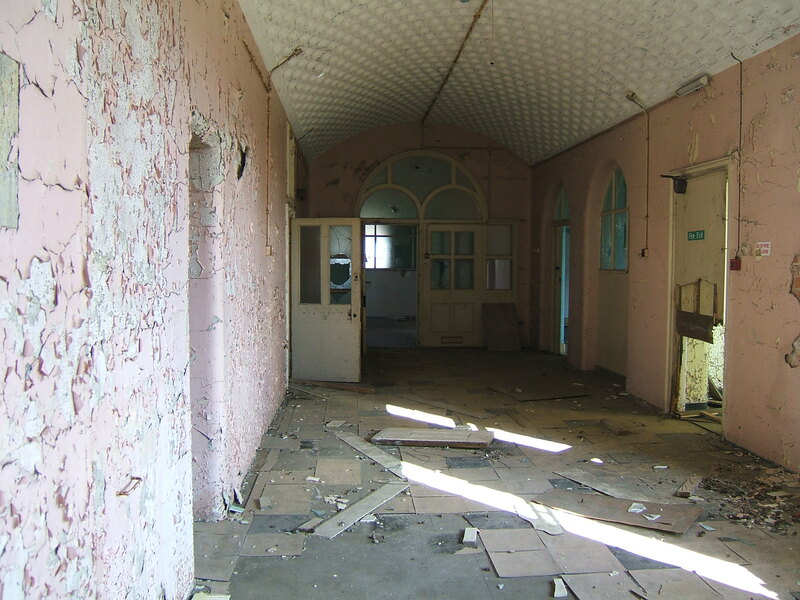 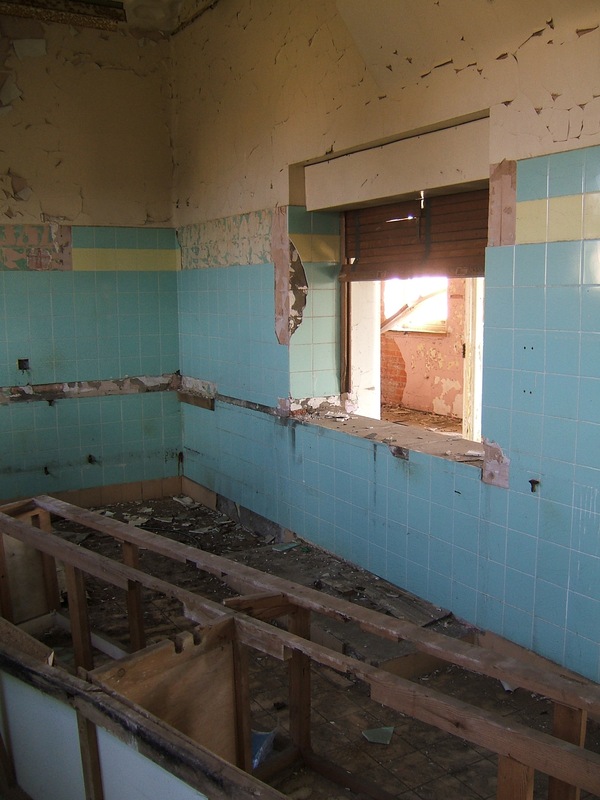 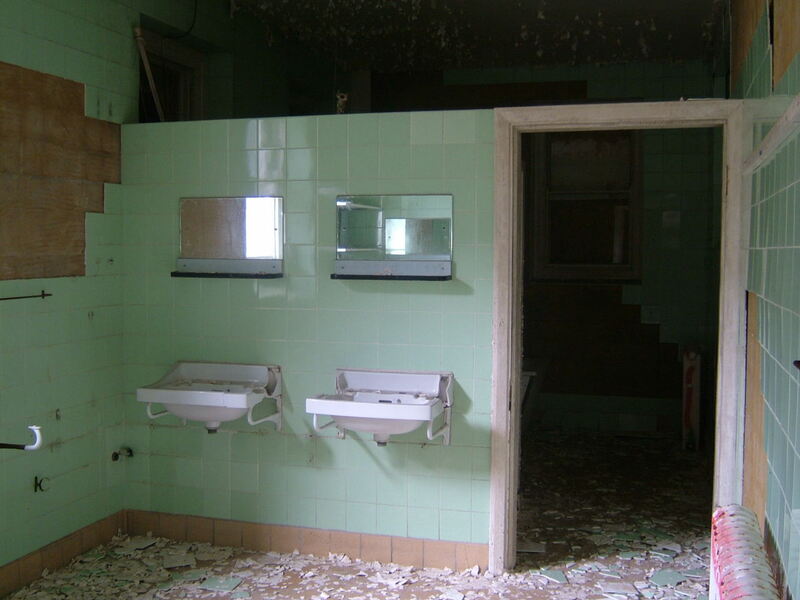 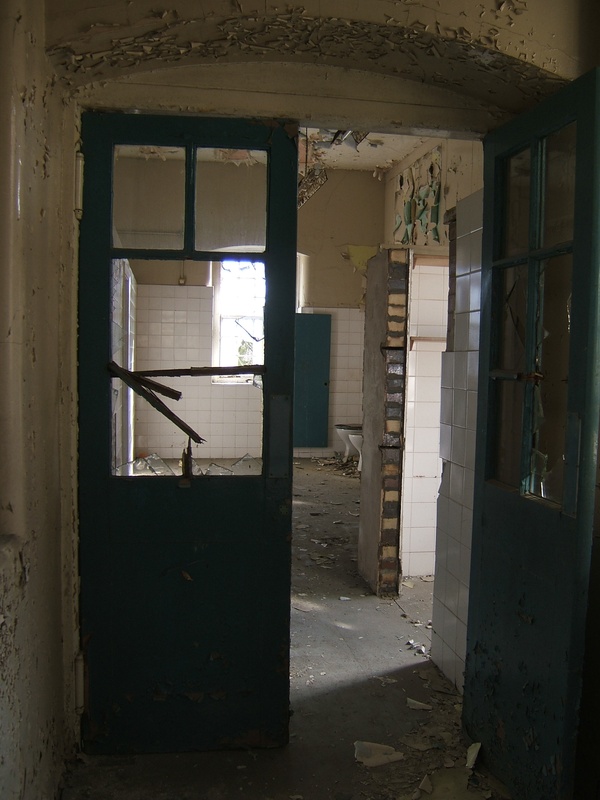 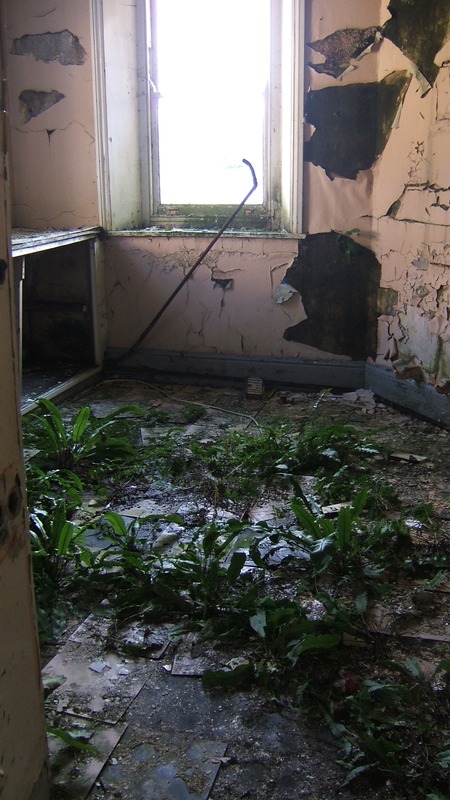 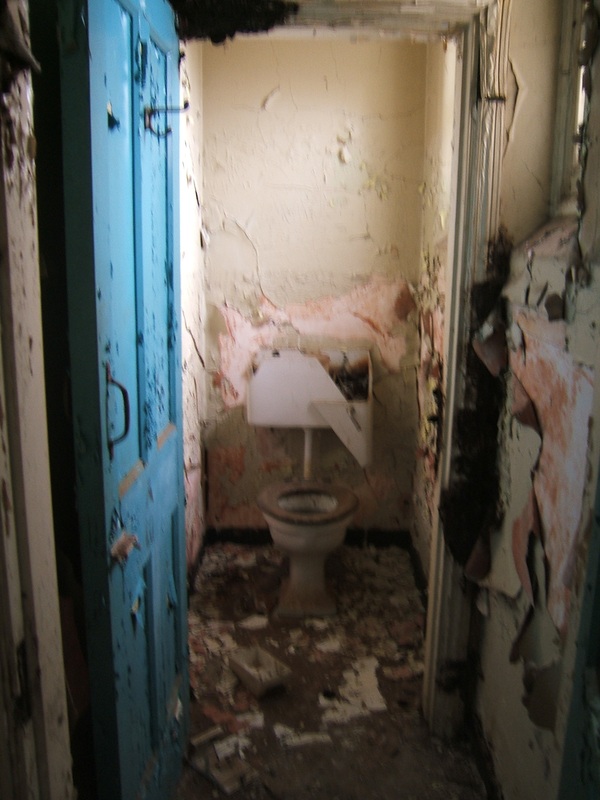 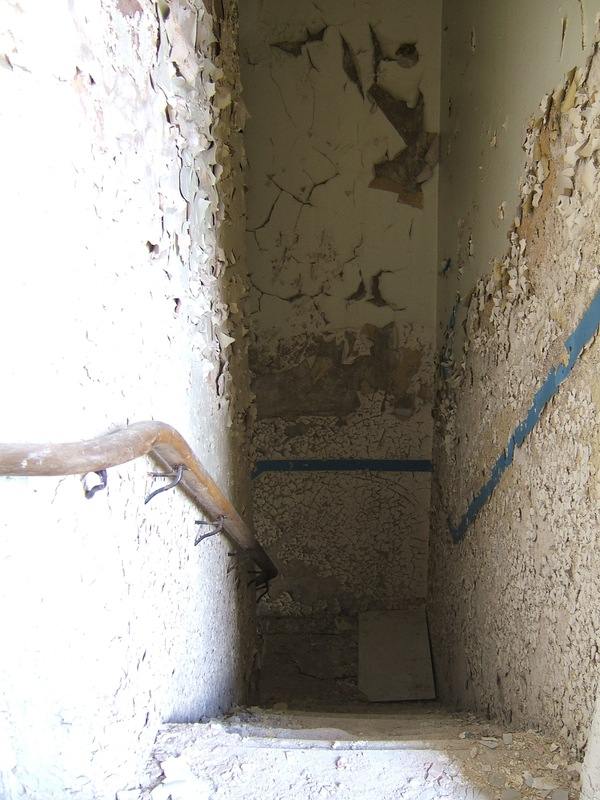 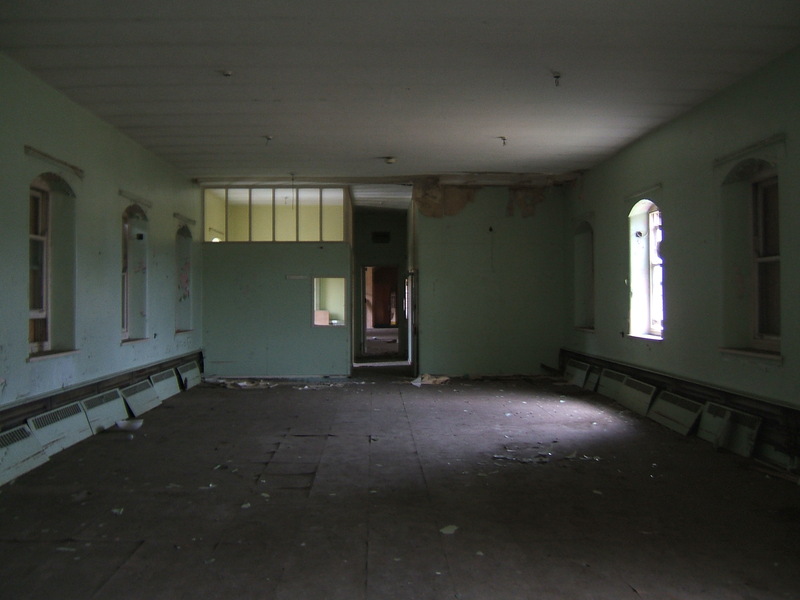 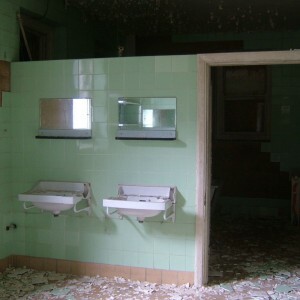 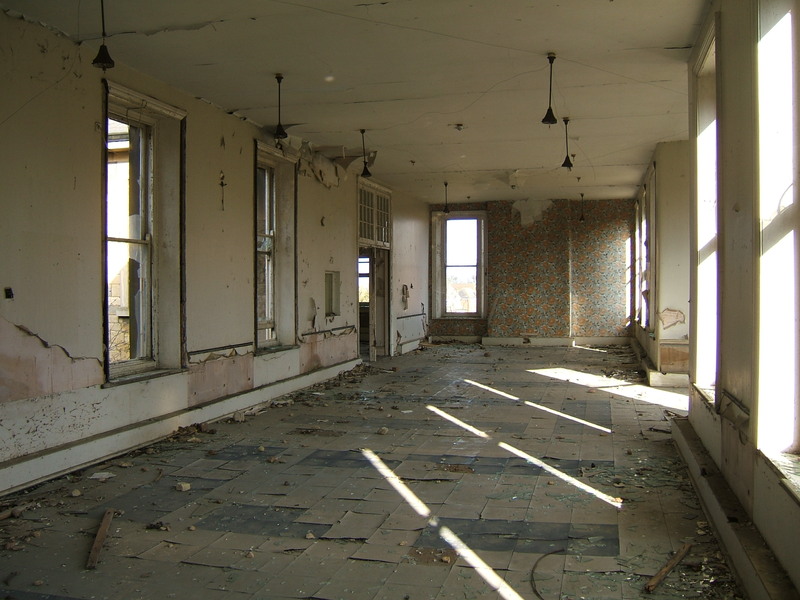 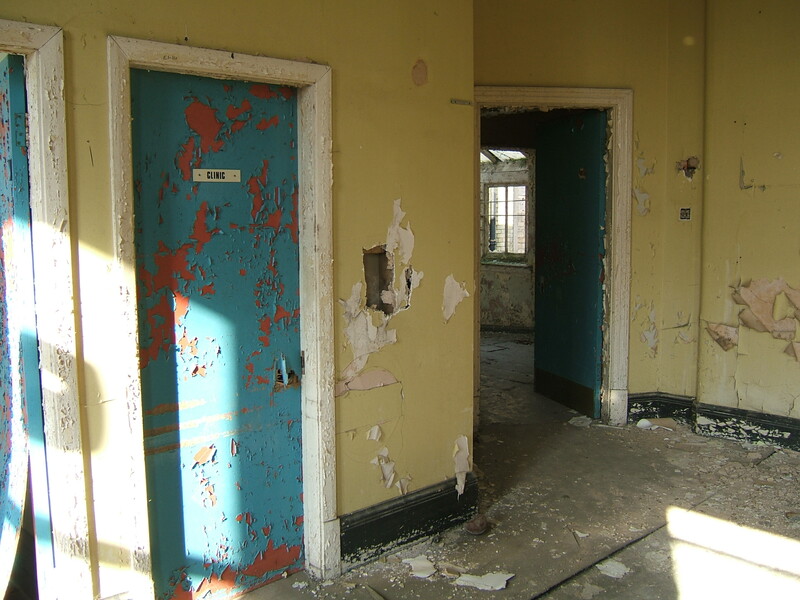 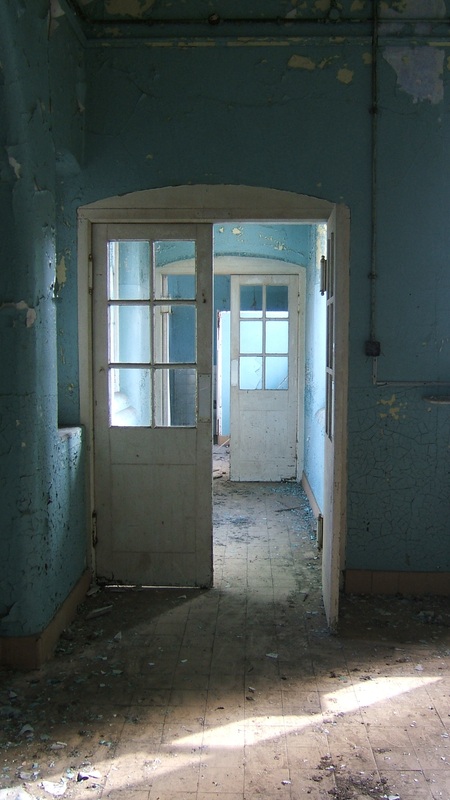 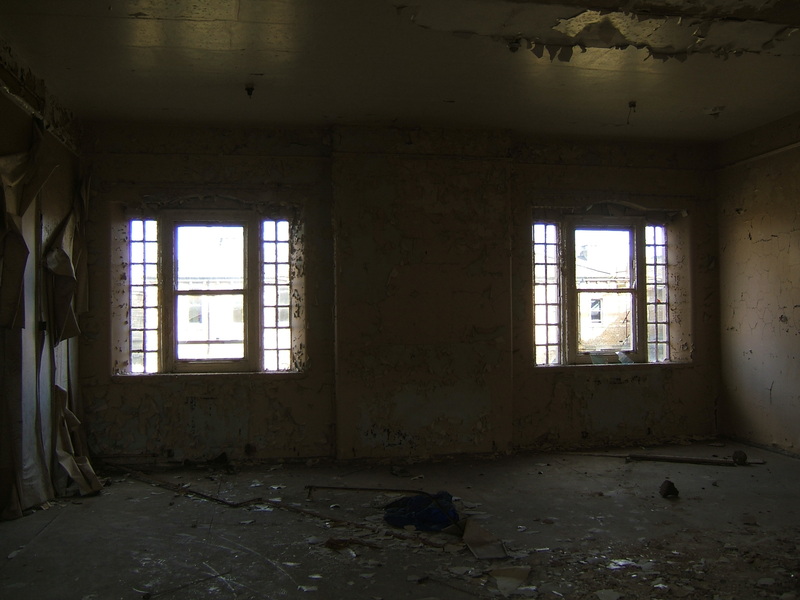 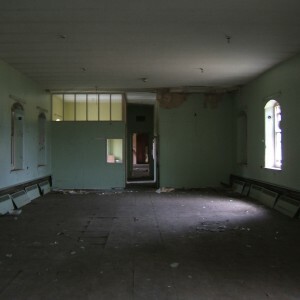 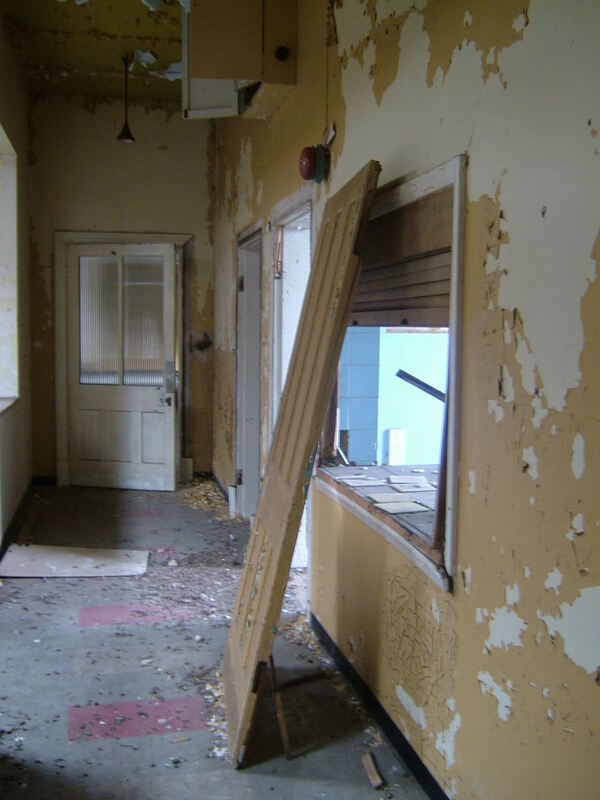 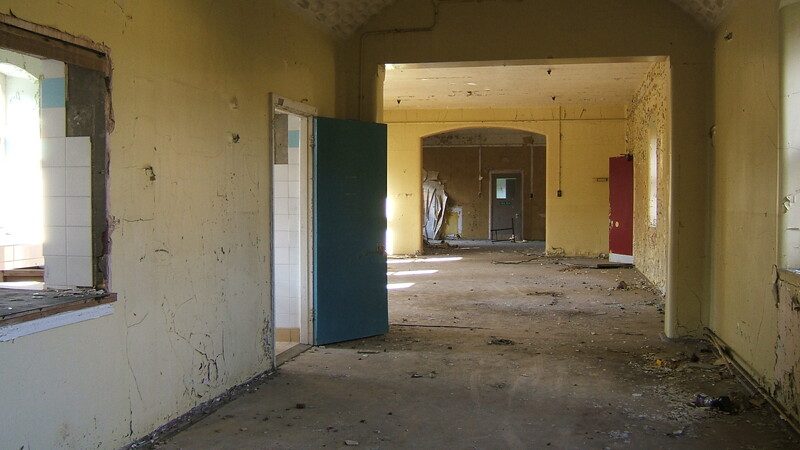 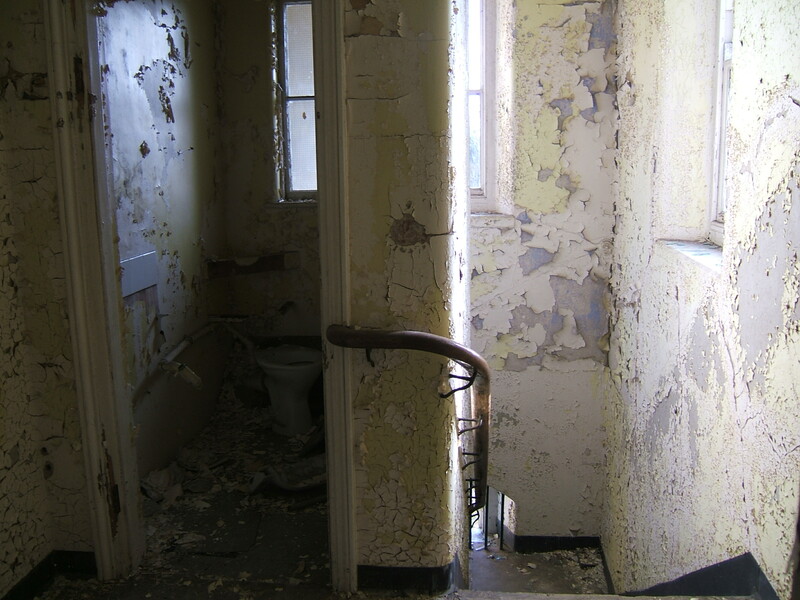 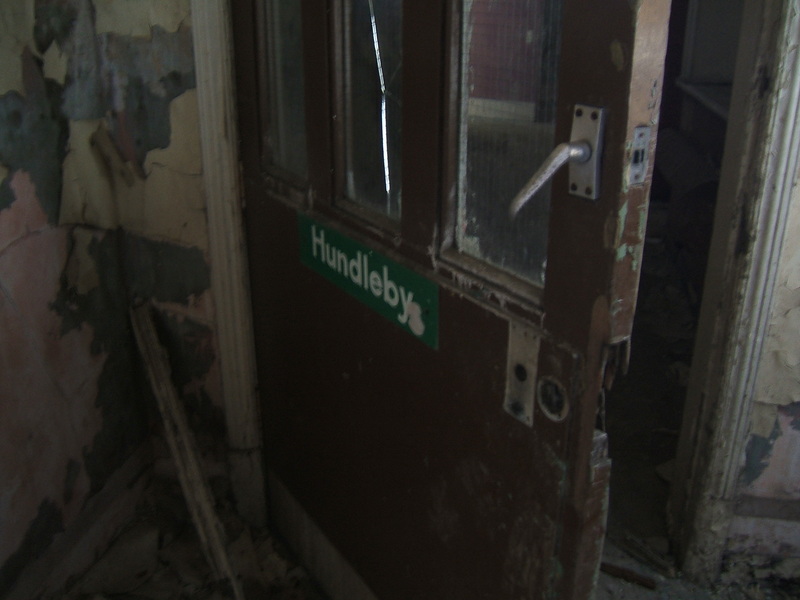 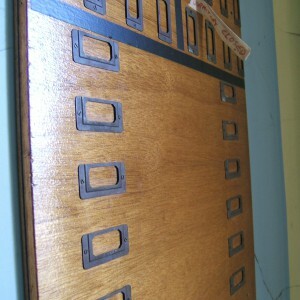 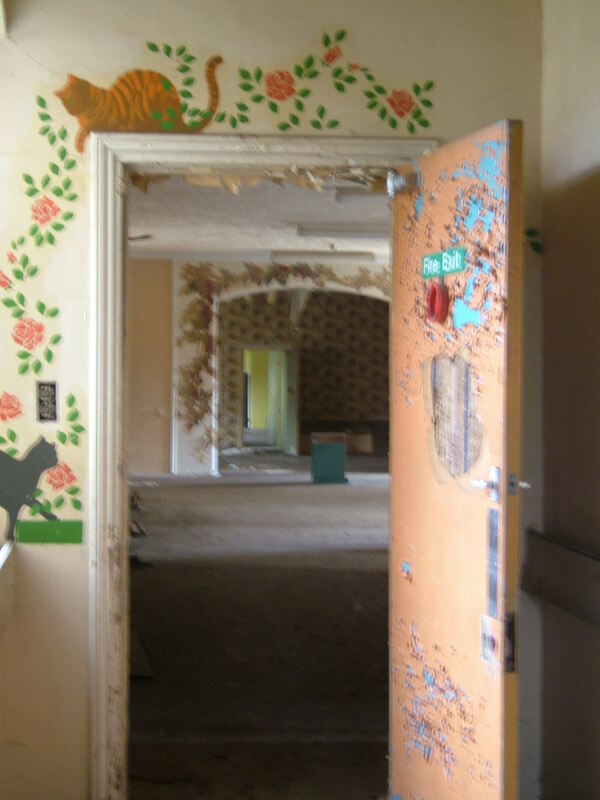 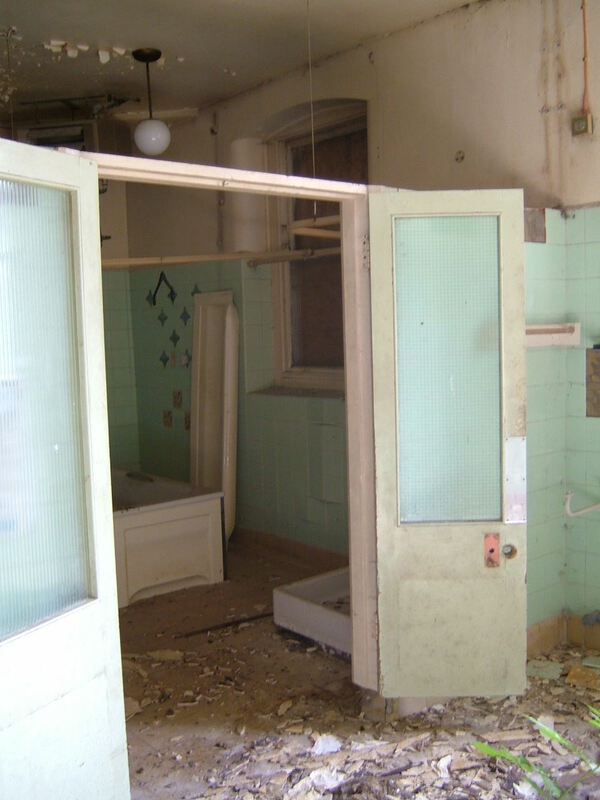 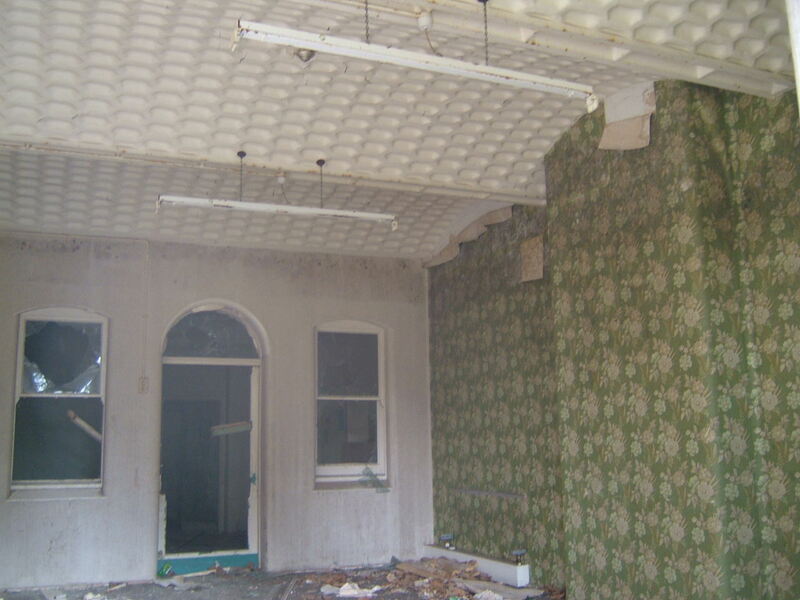 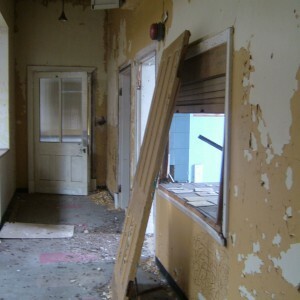 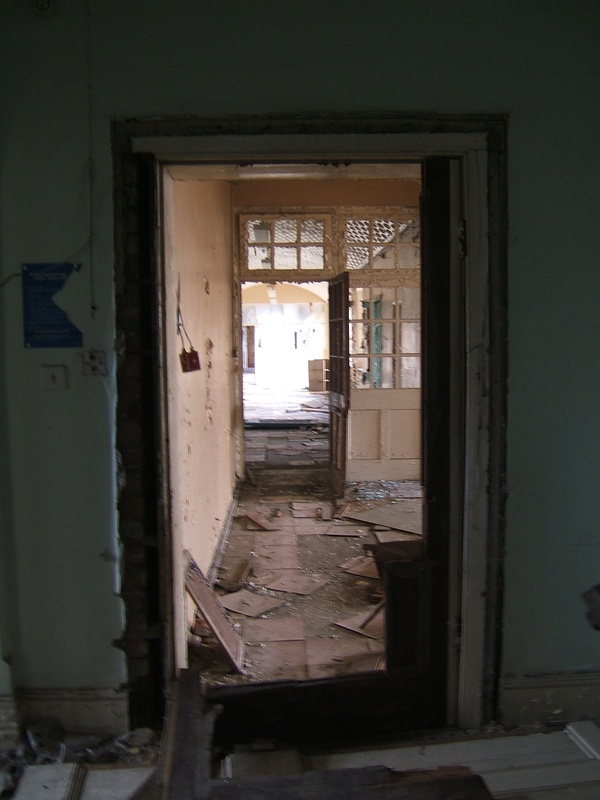 By the early 1980’s it had been possible to close outlying wards with the discharge of long stay patients through resettlement programs and a series of mental health units were developed in the district general hospitals to take on the hospitals acute admissions role. 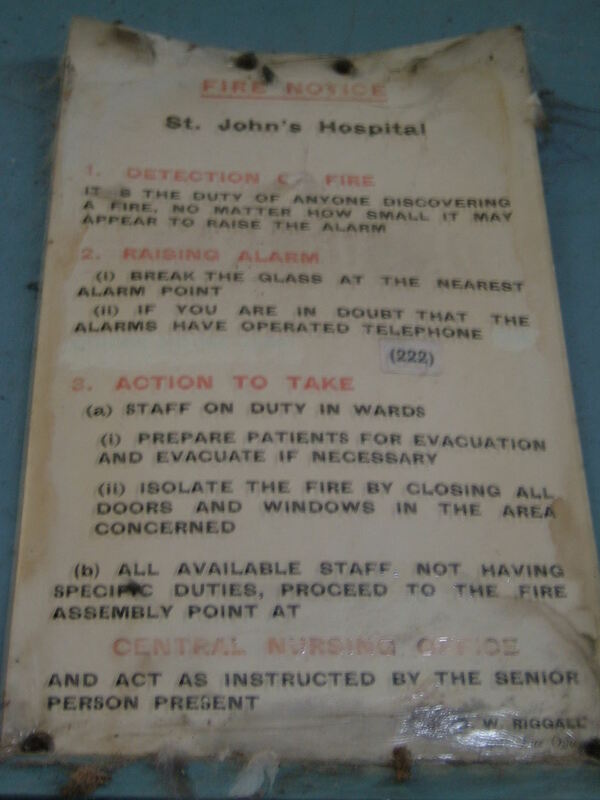 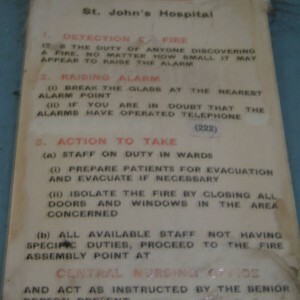 The Lawn hospital was closed in 1985 and St. John’s soon followed in 1989. 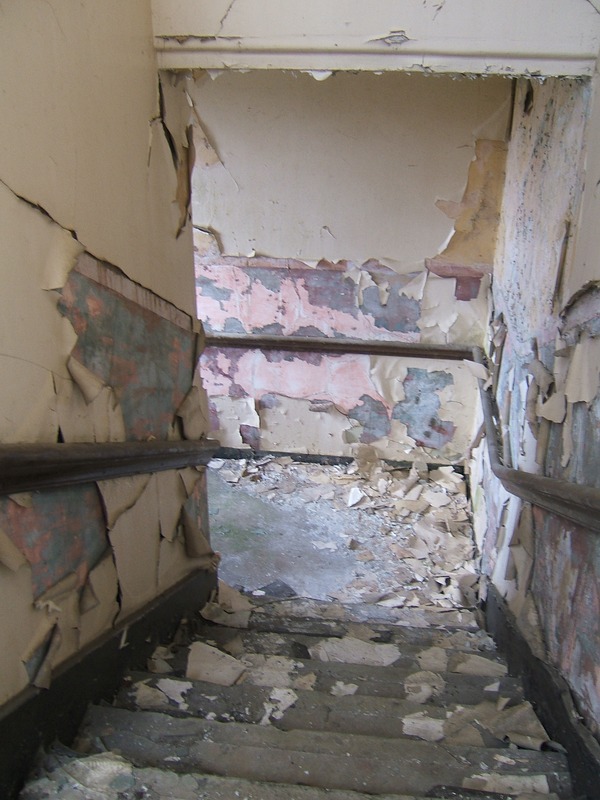 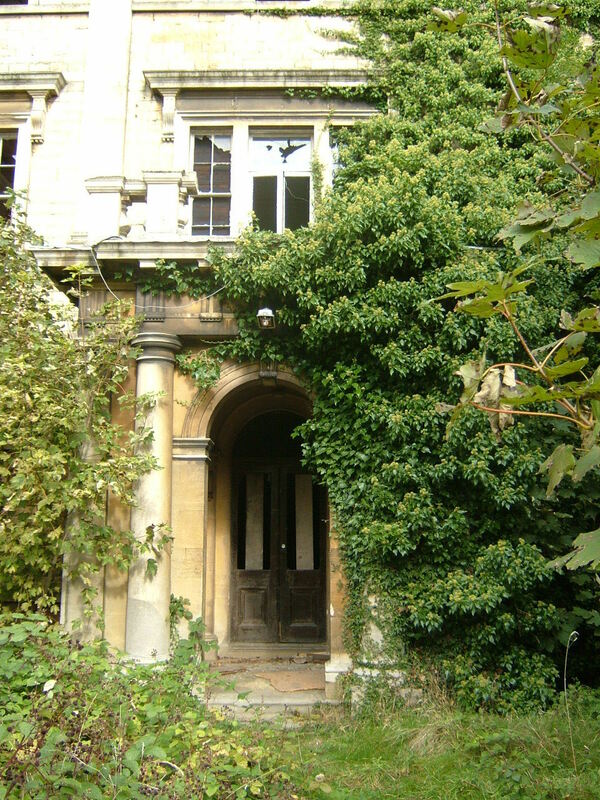 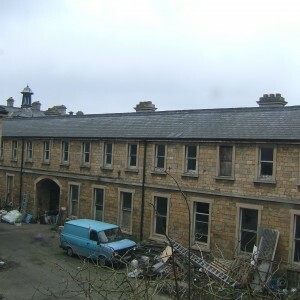 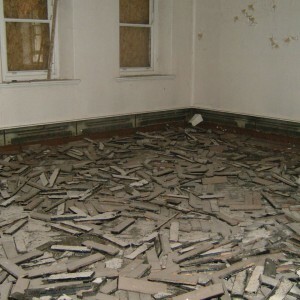 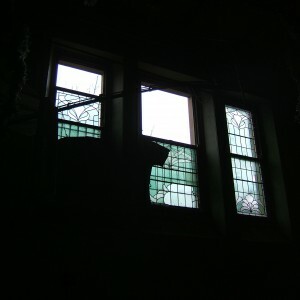 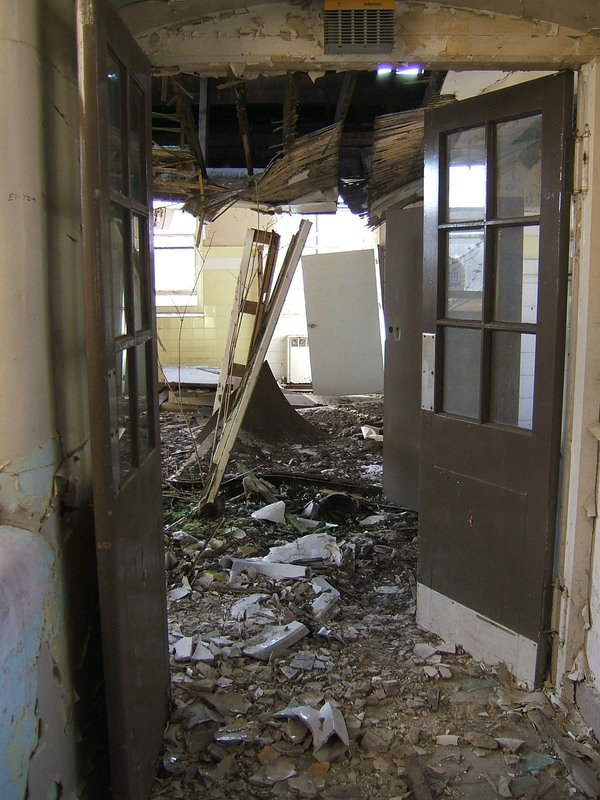 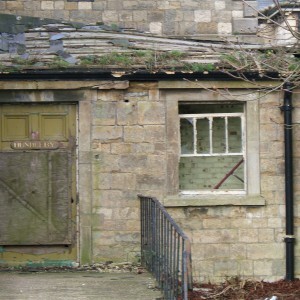 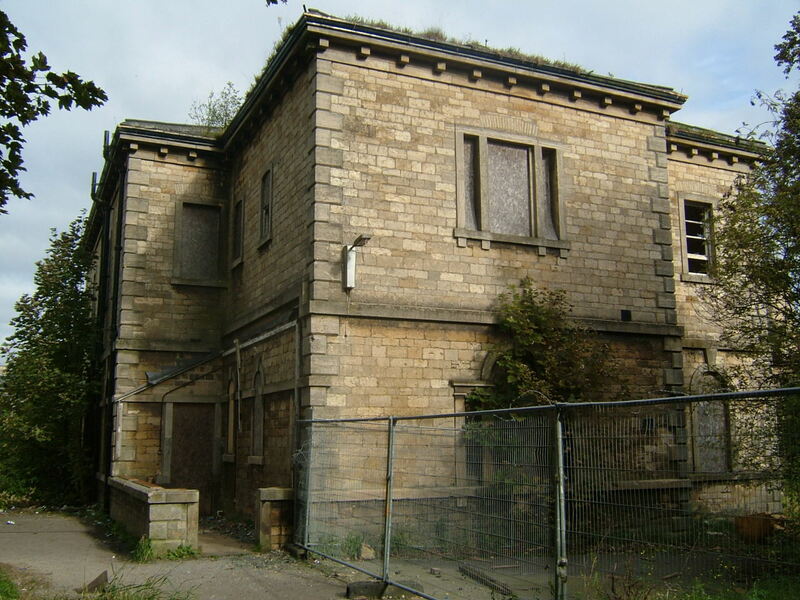 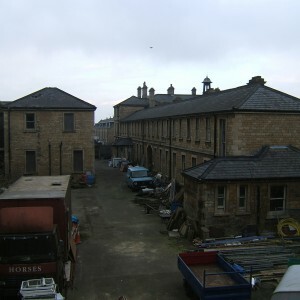 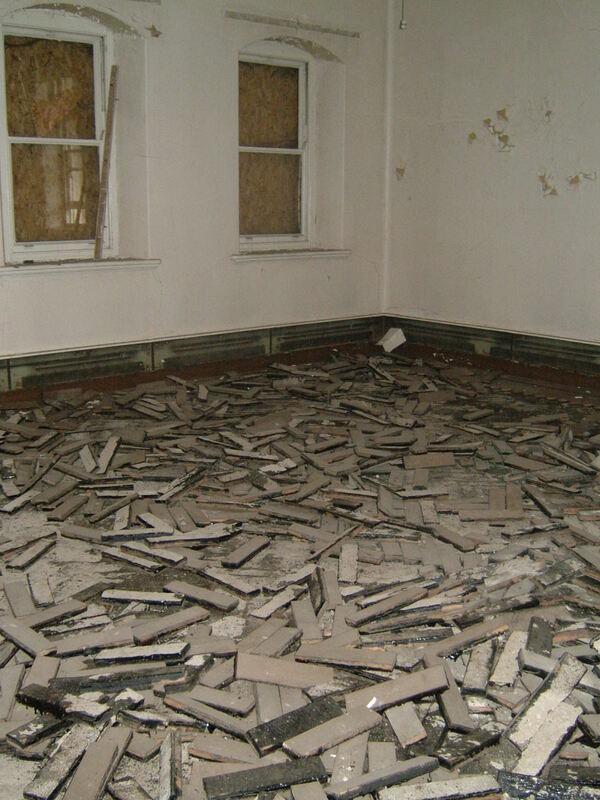 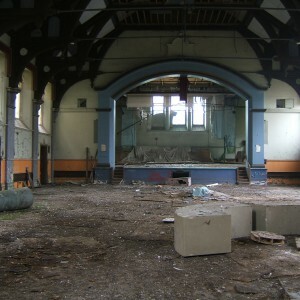 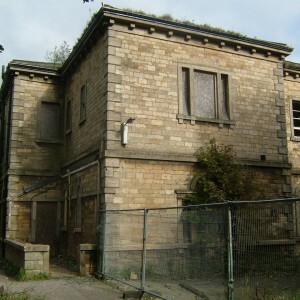 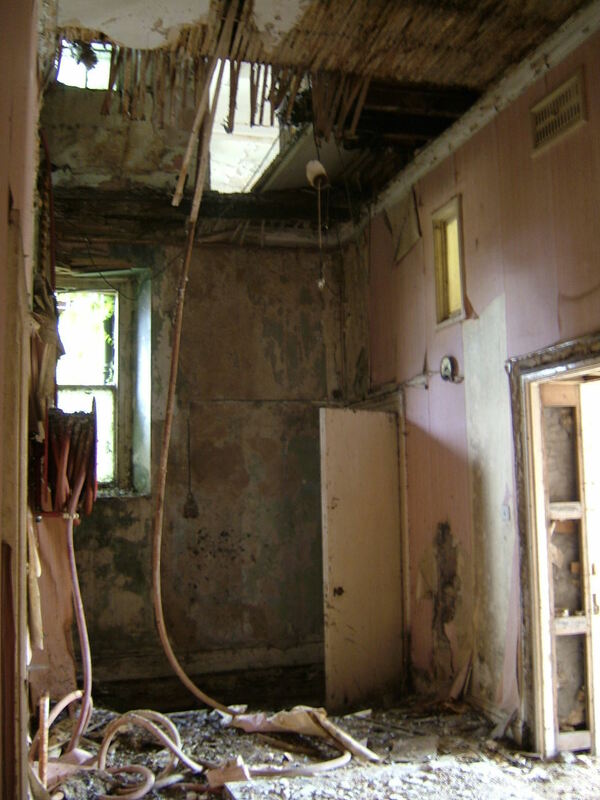 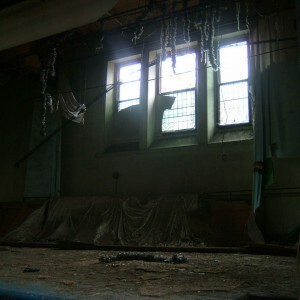 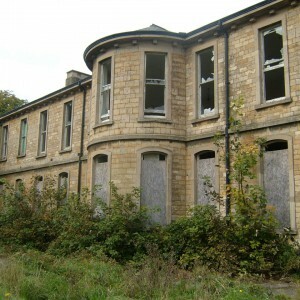 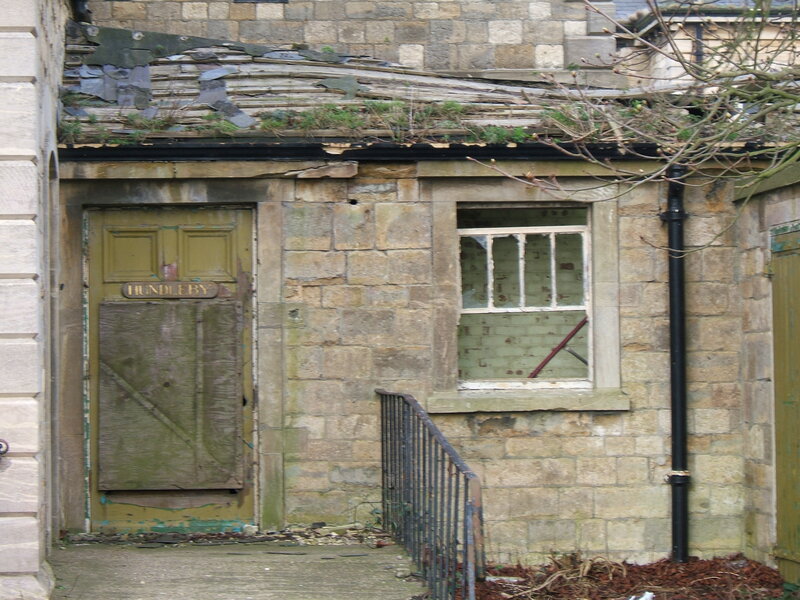 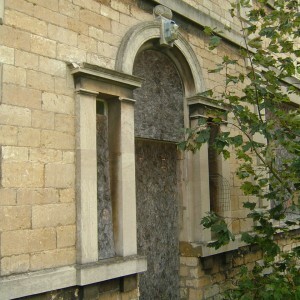 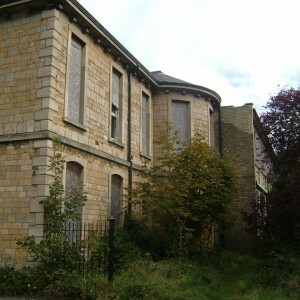 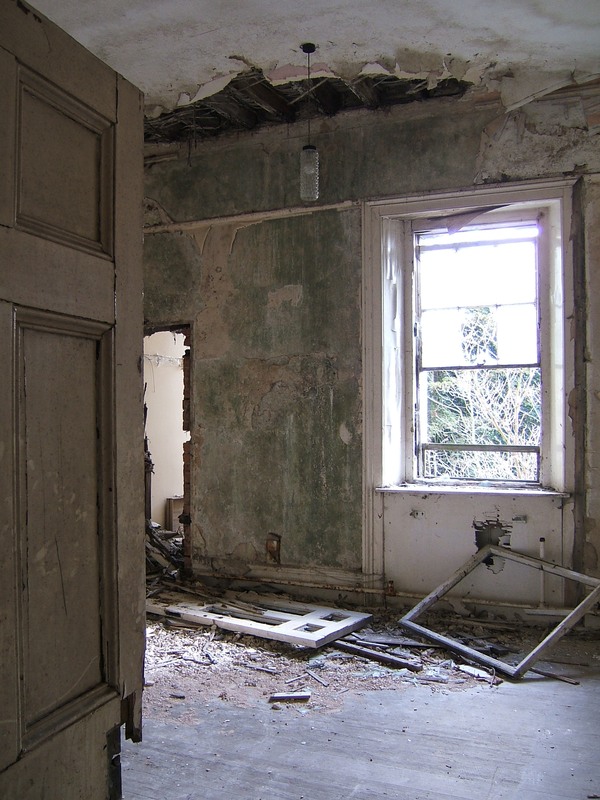 The St. John’s site was subsequently purchased for residential development which brought about the demolition of many of the outlying buildings and later extensions, however it failed to ensure the conversion of the now Grade II listed main buildings which continued to deteriorate for over 20 years after closure. 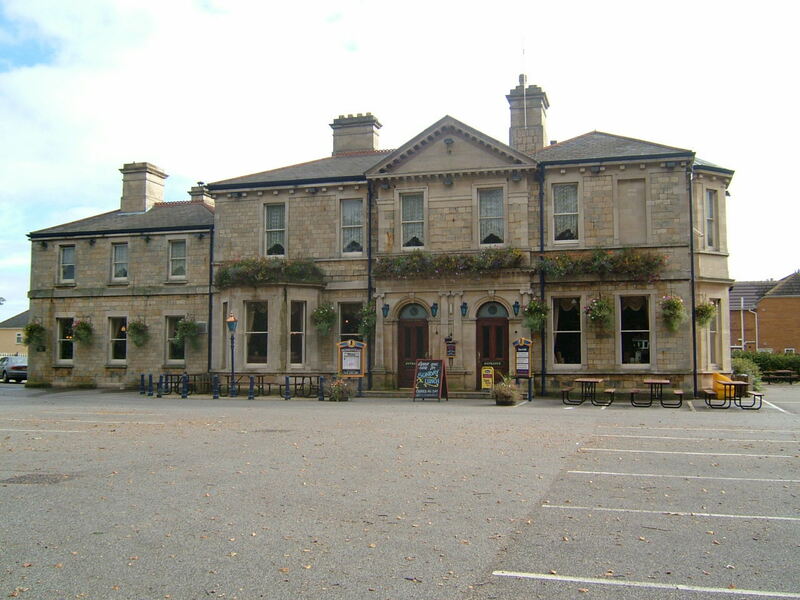 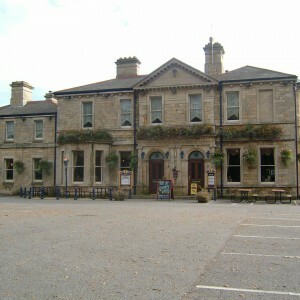 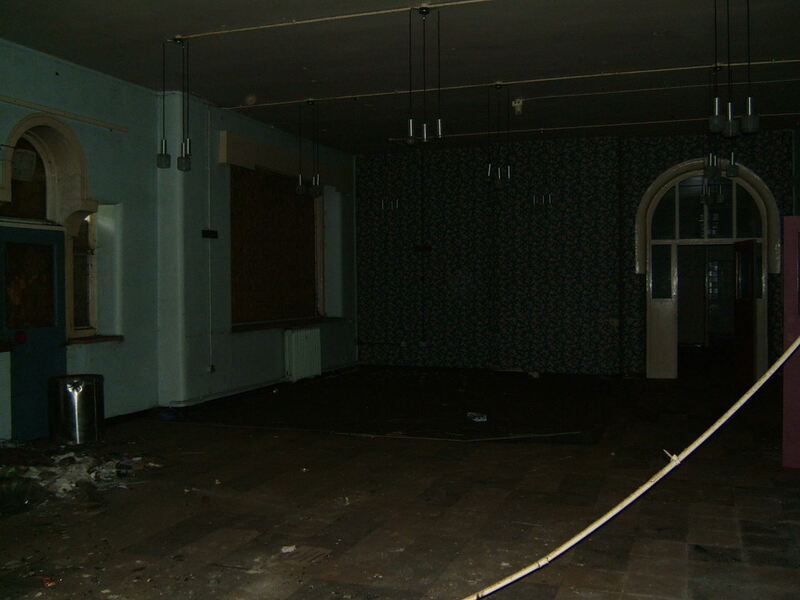 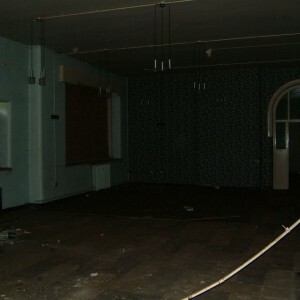 The administration block was let to the Society of Will-makers for offices and storage and the Superintendent’s house converted to become a pub/restaurant. 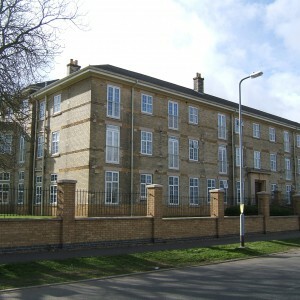 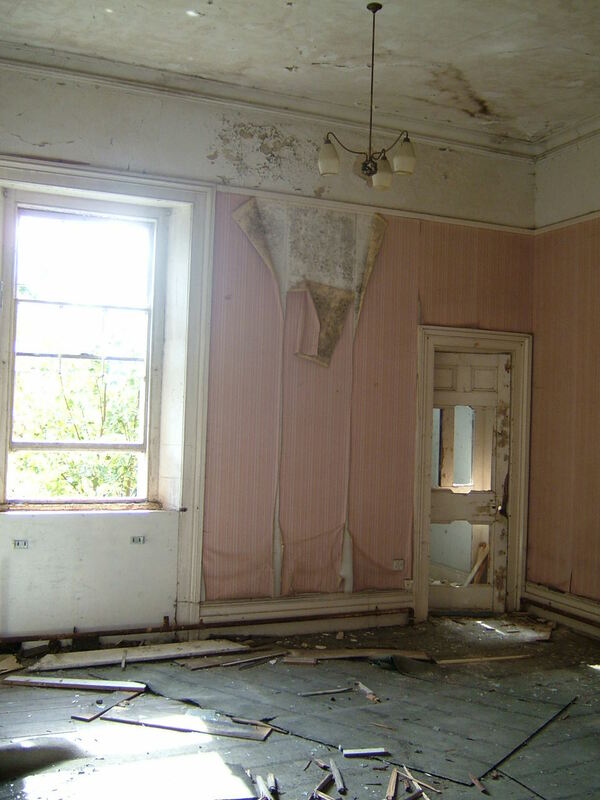 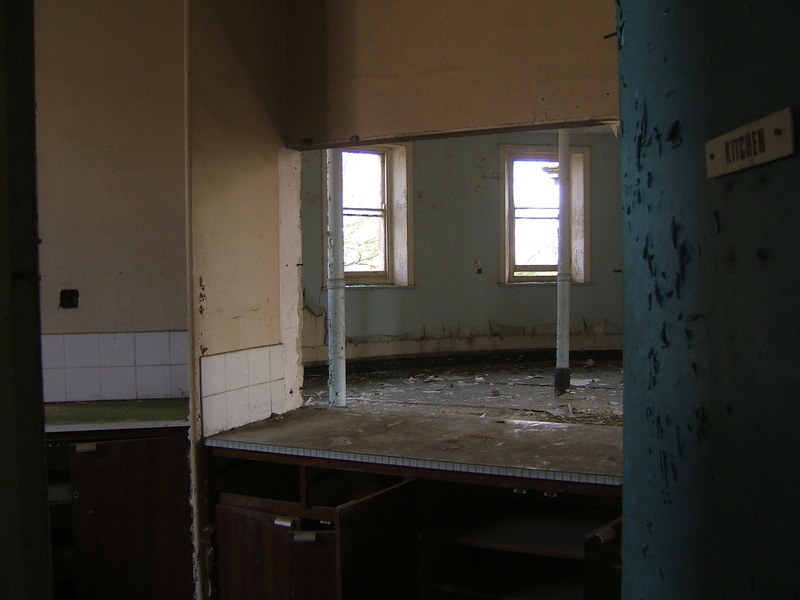 The lodge and neighbouring residences were sold and returned to housing use and the nurse’s home was refurbished as private apartments. 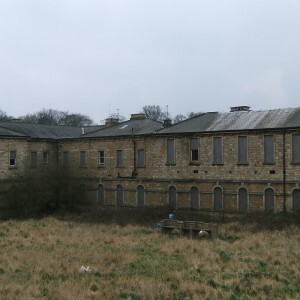 Much of the grounds surrounding the hospital were built upon with housing estates which involved the demolition of both working chronic villas, the isolation and admission hospitals and the 1915 addition to the female wing. 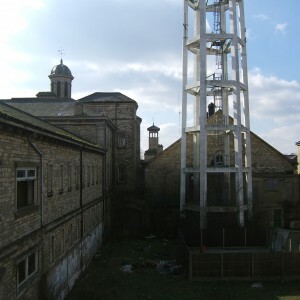 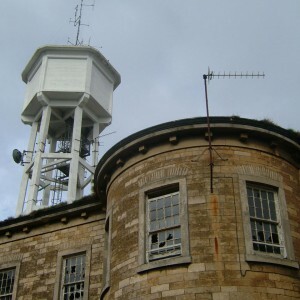 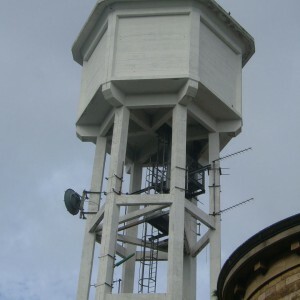 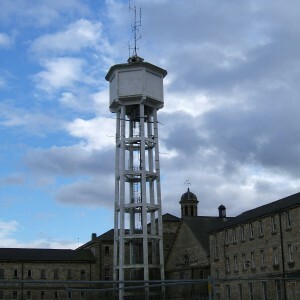 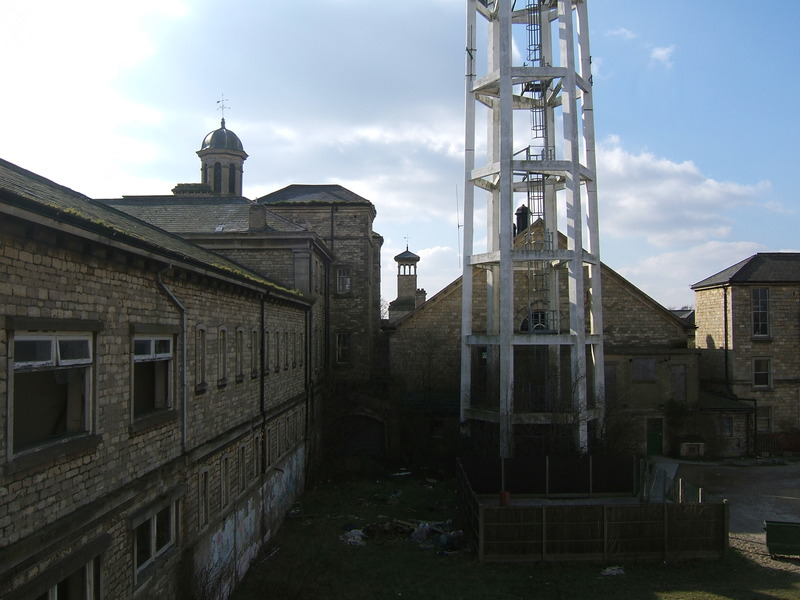 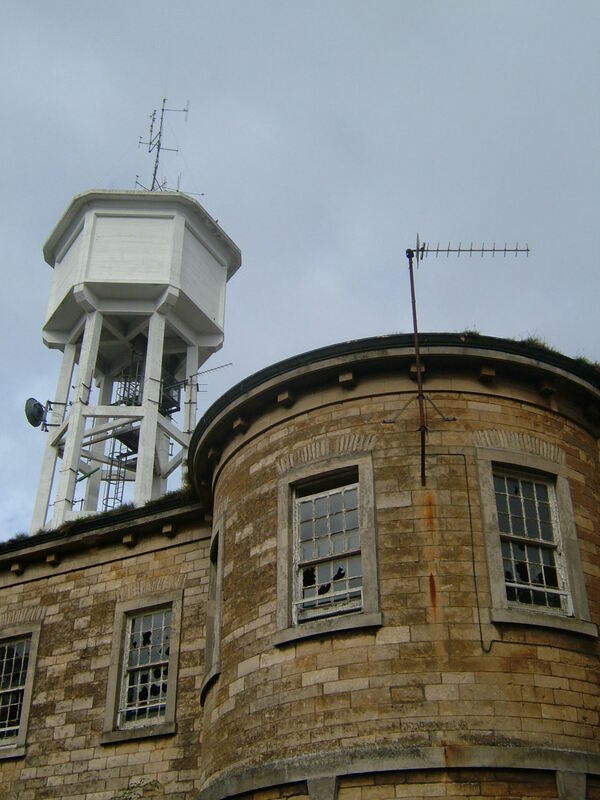 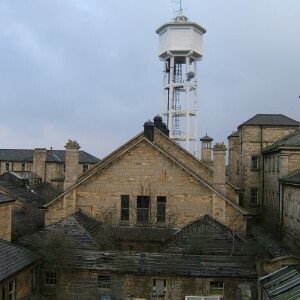 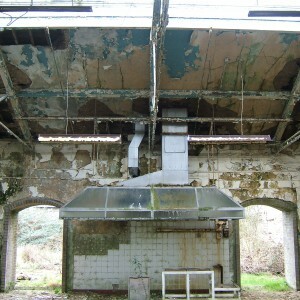 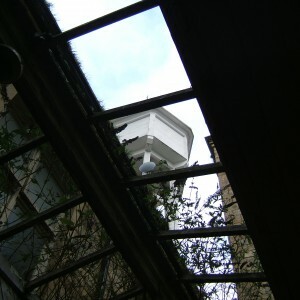 The laundry complex was also demolished although the neighbouring concrete water tower survived until residential conversion of the main buildings commenced in 2012. 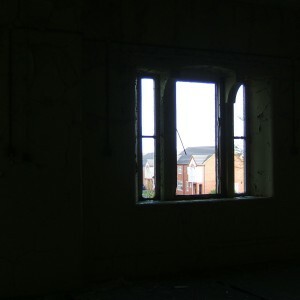 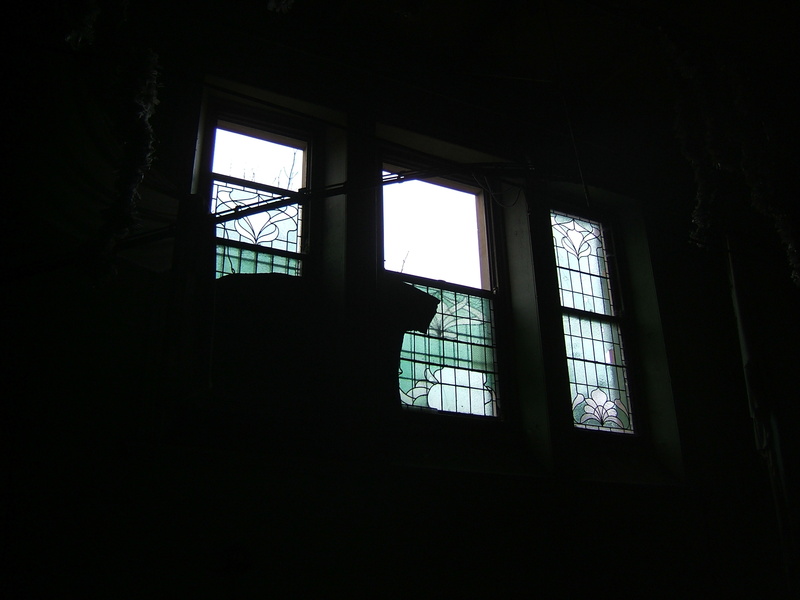 My Facebook page documenting the continuing development of St. John’s Village. 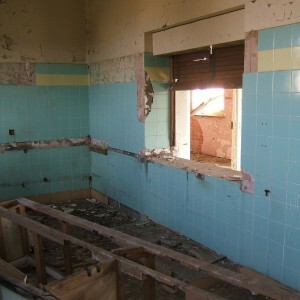 Thanks for this – are they finally working on the main block now?